Barry on Hearts sign one of St Nicholas best football players! We are delighted to be able to share our learning with you. Please visit regularly and interact with us by leaving comments. 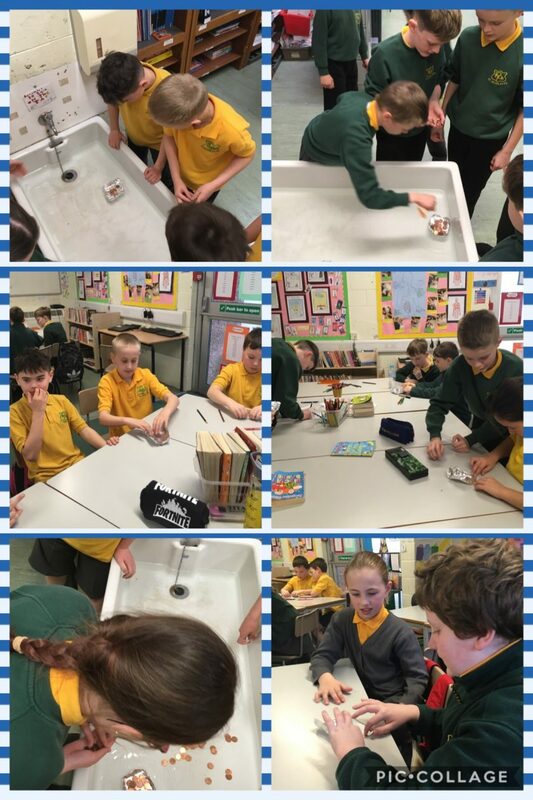 After all our Titanic research, P5 have been learning about what makes a boat buoyant. We tested out our theories using tin foil to make the boats and weighed them down using pennies. The record was 42 pennies in one tiny tin foil boat! Excellent design Tomasz and Kacper! It has been a great week in P4b, jam packed full of learning and fun ! We particularly enjoyed our trip to Duncarron Fort. Here are some of the things that we did this week. 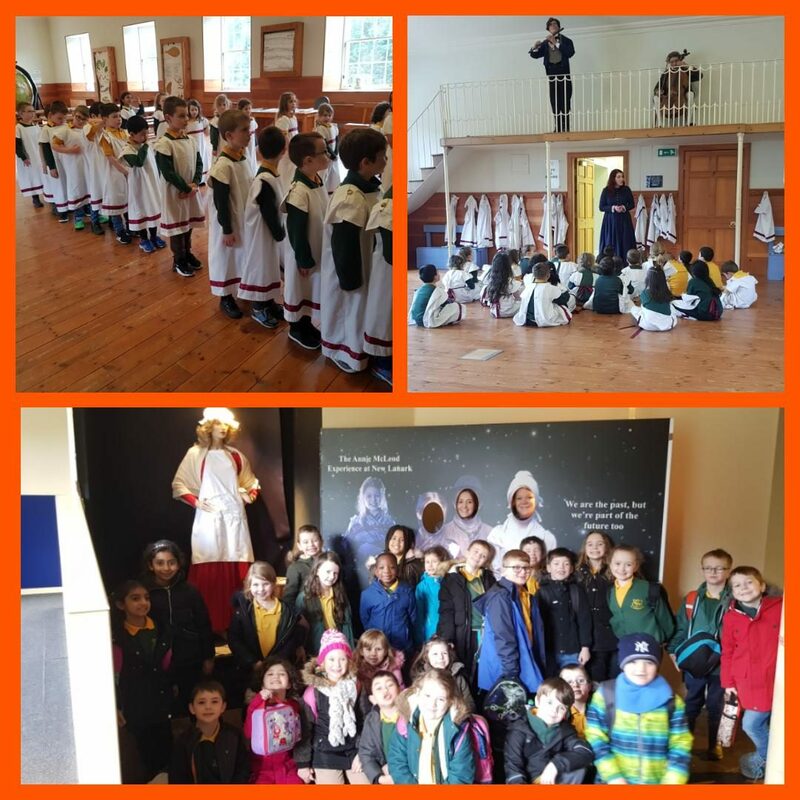 Catherine – On Tuesday we went on a trip to a mediaval village. Gerard – On Wednesday we practised hymns for our Stations of the Cross Service. Gaby – I learned about the weapons that would have been used long ago. I enjoyed having a shot of the axe (YIKES !). Shay – I enjoyed learning about Mary’s Meals. A man called Magnus started it off. Liam – We learnt that Jesus travelled to Jerusalem on a donkey with his disciples. Brooke – I learnt that salt was used a lot in a long time and it cost a lot of money. Holly – When Mary Queen of Scots was alive you had to take your spoon and cutting knife with you when you went to dinner. 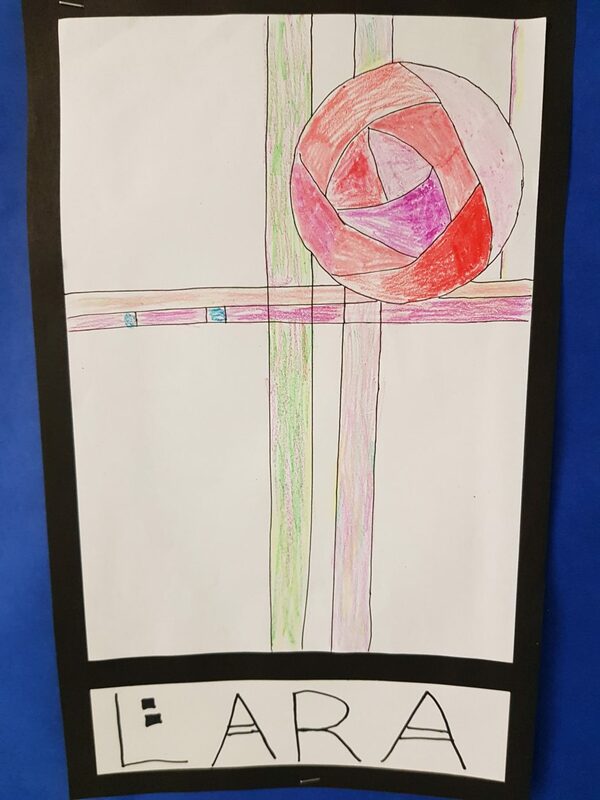 Lucas L – We visited our Church for Stations of the Cross. There are 14 altogether. Olivia – We visited the Shrine next to our Church and it was peaceful. We also made a wee something for all of our lovely mums. Have a good day on Sunday ! We have been very busy the last few weeks in Primary 5. We have covered lots of different things. In literacy we have been learning about different phonemes that make the ‘s’ sound. We have looked at s, ss, ce, se, and c.
Poppy – We have been learning about the story of ‘Invasion’ in Literacy. We have been looking at the character Rollo and predicting what we think might happen. Leo – we worked with a partner and discussing the story and our predictions and what we know and want to know about the characters. Kacper – we have been researching women in engineering and writing about why they are important and what they invented. I researched Victoria Drummond. She was the first woman Marine Engineer. 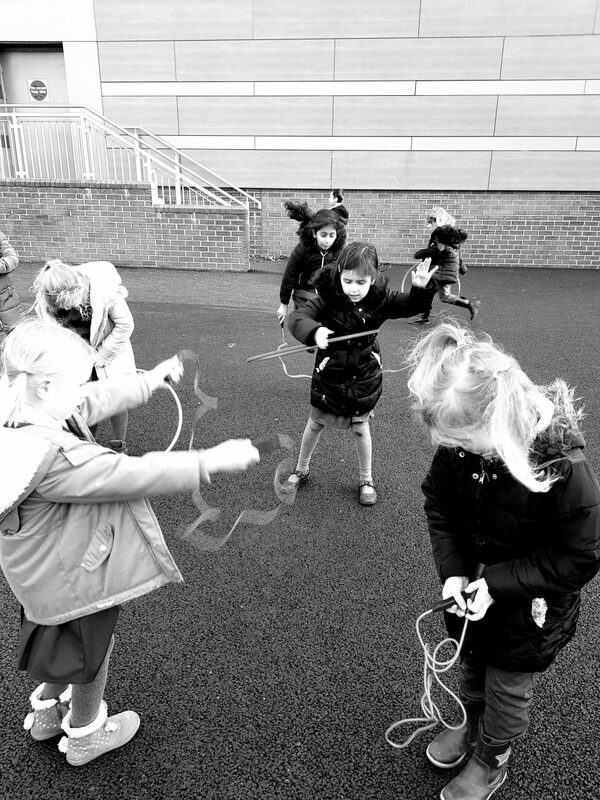 We have been learning about different turns and even went outside to direct each other around the playground. Max – we have been learning to multiply two digit numbers by two digit numbers. It is quite tricky but with practice I can do it! 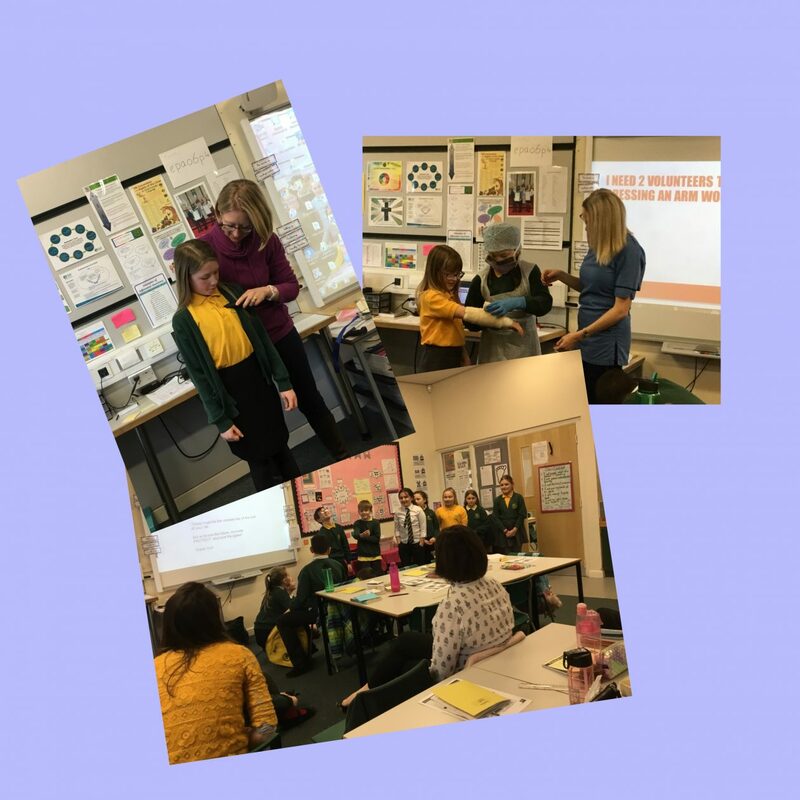 Christy – We had visitors from Stirling council to see us doing a number talks lessons about multiplication. We can break factors into smaller factors to help us in number talks. 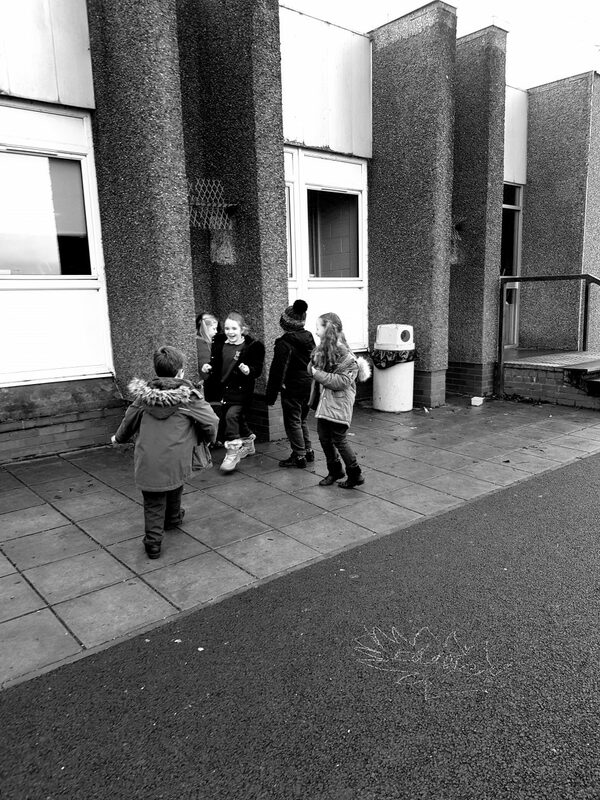 Leo – We have been measuring the length of different things in and around the school. We estimated then measured the objects. Ciaran – we have been creating titanic quizzes and fact files as we are finishing the topic. We had a theater production about Simon, Martin and Sharon. It was all performed by one man. It was called Pondlife. It was very good and entertaining. We were amazed that the man could perform more than one character. In Religious education we looked at the seven sacraments and when people receive them. 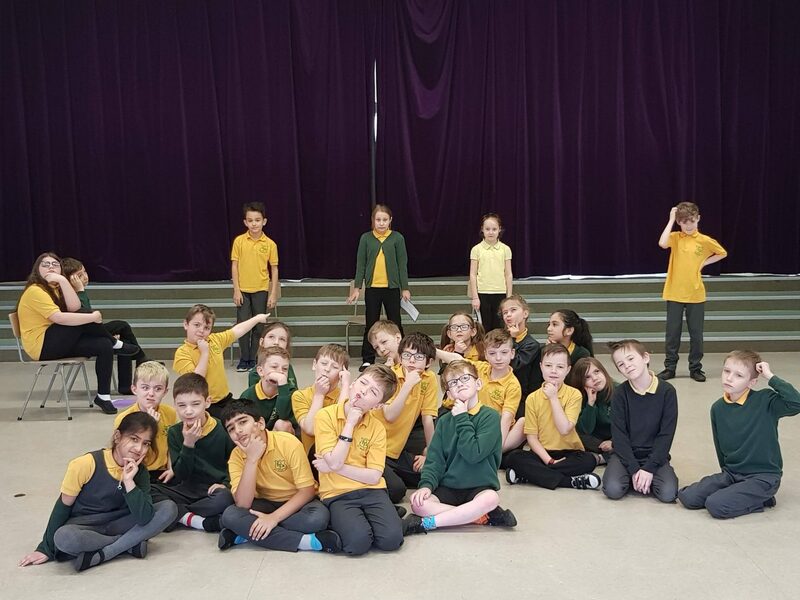 Max – we have been practicing the hymns for the Stations of the Cross and took our class picture for the Stations of the Cross service next Wednesday. We used the green screen. Leo – we went to the Church and Father Frances led us through the Stations of the Cross. 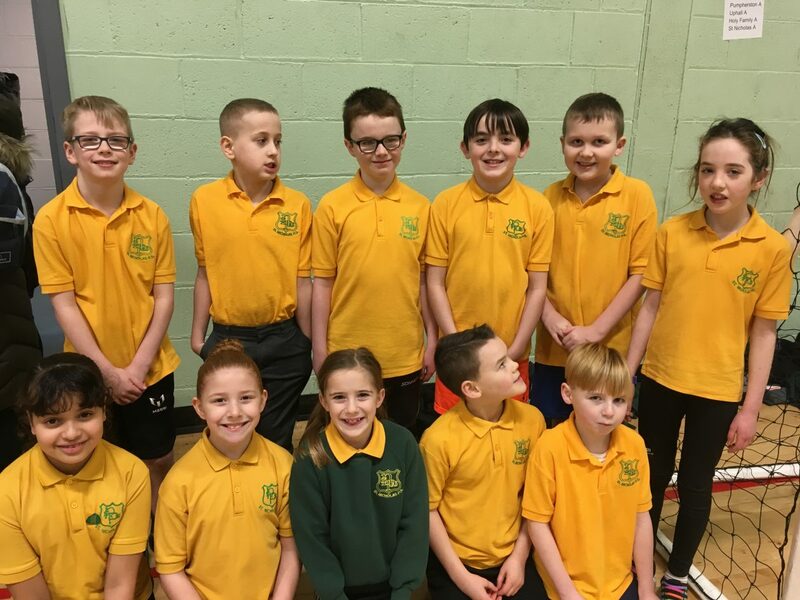 Sam – in P.E we have been skipping – we have been learning jumping skipping, running skipping and hopping skipping. Some people tried cross over skipping. 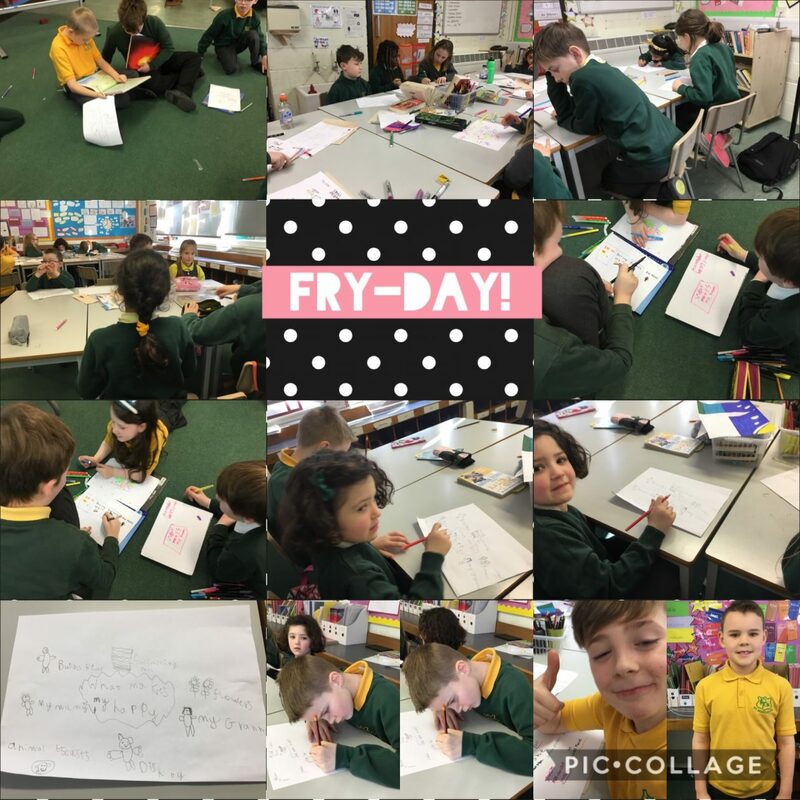 Today was ‘Feel Good Friday’ and we designed our own happiness t-shirts. Sadie- We had a craft afternoon yesterday and we made something special which we are keeping a secret until Sunday. Chloe- We had visitors from a school in Stirling who came to see our Rekenrek lesson. We did really well and the visitors were impressed! Tinashe- We were using prediction in literacy. The book was called ‘The Storm’ and we had to predict what happened in the story. Lena P- Our topic is called Forces and this week we did the ‘Car and Ramp’ experiment. Joshua- We found out that building a big structure for a ramp, making it higher, made the car go faster and further. Jacob- Friction stopped our car on the big ramp because it bumped into the carpet. Orla- We have been working on subtraction and addition together. Ethan- We have been learning all about the Stations of the Cross. There are 14. 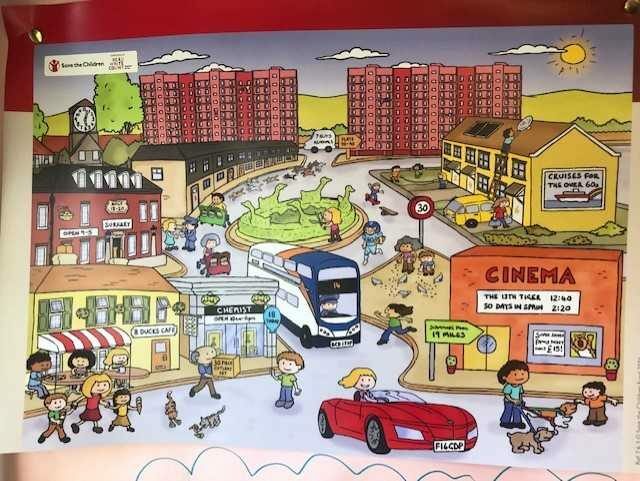 Car Registration plates, bus timetables, road signs, clocks, phones, house numbers, post boxes, shop windows, remote controls, cereal boxes, food packaging, microwaves, televisions.…These are just a small illustration of the places that our children can see numbers every day. And by taking the opportunity to point out these numbers and name them, we can really help our children when they are learning to count. But even more than this, we can help our children learn the names for numbers. Again, this is something that we as adults probably all take for granted. 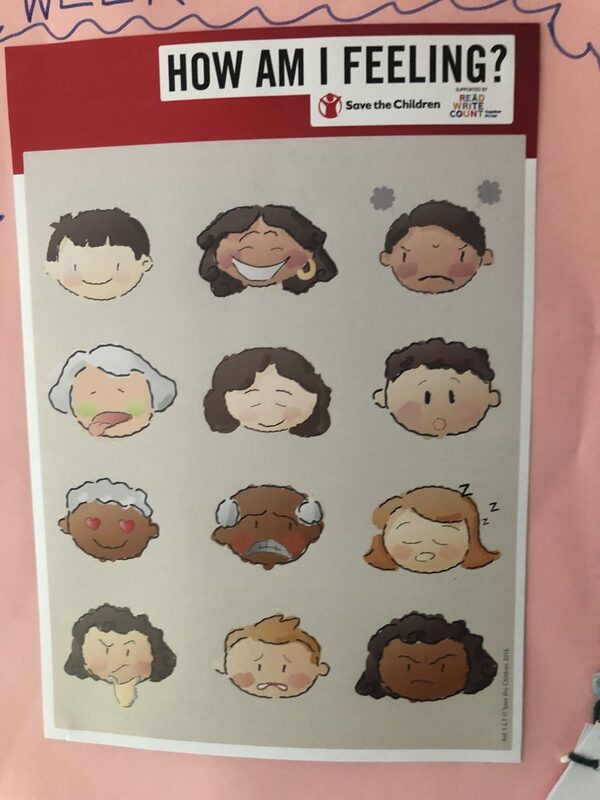 But how many times have you heard children count and refuse to include, 11, 12 or 15! This is because not only is counting complex, but our names for numbers are quite confusing too. Sadly, as you will come to see, there are no shortcuts when it comes to learning number names and not much logic either, so it is just something that our children have to learn. The more they hear and see numbers, the easier it is for them to learn them. * How does “eleven” and “twelve” relate to “one” and “two” – and compare this to “four” and “fourteen” which is far more logical? * Why are 13 and 15 not “threeteen” and “fiveteen”? And why are 30 and 50 are not “threety” and “fivety”? * Why are teen numbers spoken with the unit number first but numbers in the 20s, 30s etc are spoken with the tens number (which comes first!) first – i.e. 14 (1 ten then 4 units) is “fourteen” but 43 (4 tens then 3 units) is “forty-three”? * Why do we say “one hundred and eleven” for 111, but “Twenty-one” (not twenty and one) for 21? 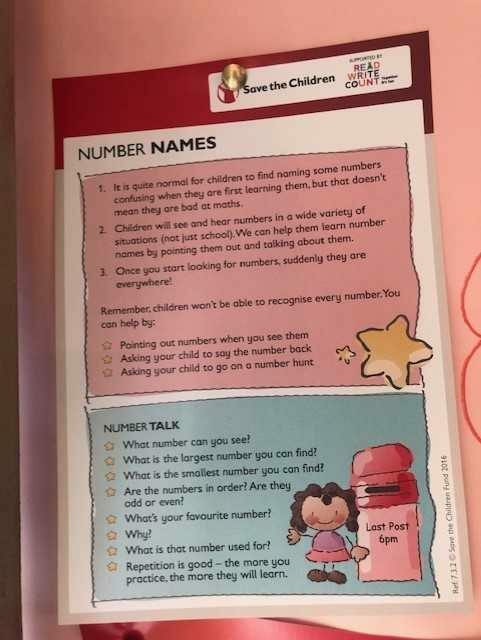 As we found in Families Connect, the more you think about the English way of naming numbers, the more complicated it gets! 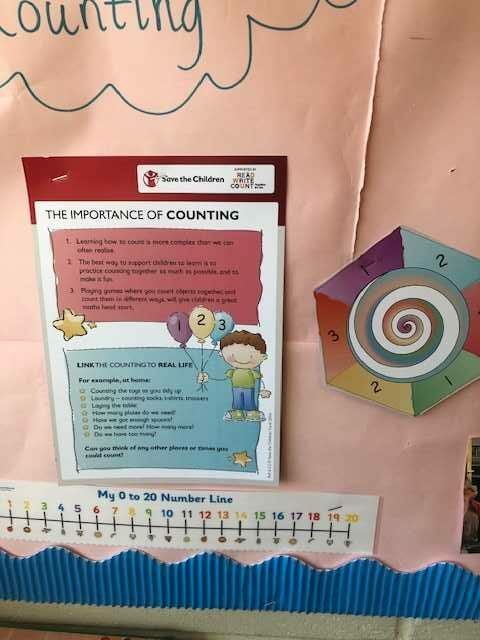 And this is what our children are trying to tackle, at the same time as learning the order of numbers and also that they represent a value for something. It is no wonder they find this all a bit confusing! So, any games you can play, any chance you can take to spot and name numbers, to count things when you are out and about really are the least, we can do for imposing such a crazy system on our poor children! Do you remember learning how to count? Do you have to even think about what 5 take away 2 is? The answer is probably no to both these questions. Most of us can’t remember a time when we didn’t know our numbers up to twenty; when we didn’t somehow automatically know that 5 take away 2 was 3. And this is why we might find it hard to understand that learning to count for our children, is really quite complex. In Week 6 of Families Connect we tried to bring this home to our parents by playing a little game where we no longer had numbers, just the alphabet. So 1,2,3… became A, B, C and there was no cheating and trying to translate back to numbers! In the game, we started off easy counting from A to Z, from G to M. Then we tried counting backwards from Z to A or even K to C…and it got a bit tricky. By the time we came to counting in B’s and E’s (akin to counting in 2’s and 5’s) we were really toiling and the final straw was doing sums: F plus M equals…., B plus G equals….?? Give up was the response from most parents! When our children begin to count this is exactly how tricky it can be for them. And this response of ‘give up’ can be a common one. So, it is important for us to remember this, to be patient and support them as much as we can to just keep on trying. And critically, don’t think that your children are ‘just not good at maths’ as all they need is a bit more practice. The best way to do this is simply by counting together as much as possible, and to make it fun. There are loads of opportunities in everyday life to include some counting and for you to help reinforce your children’s learning. In the group, we discussed counting toys, counting steps, counting plates at dinnertime and even counting socks, because apparently some children are already trained to put away the washing! We also played a counting game where we counted different objects in and out of a gift box, trying to win all the objects from the other player. Simple games like this are a great way to give your children a good maths start. 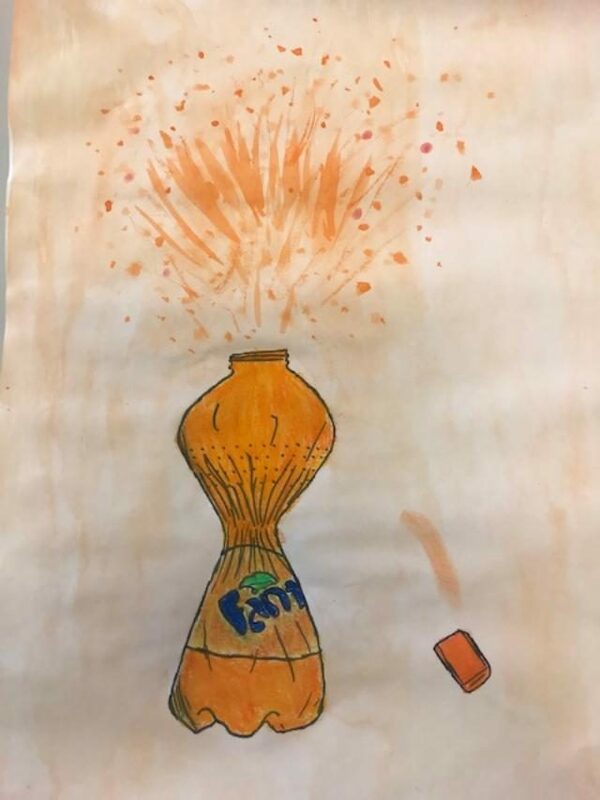 The only downside….you might need to refresh yourself on the messages from Week 1 of Families Connect when we looked at managing feelings, because it seems like most children do NOT like losing games! Finding time to read together just for fun (over and above homework! ), isn’t easy. But research shows us that reading together, little and often, can have a big impact. There are several things we can do to support reading at home, like trying to share books at different times of the day, telling stories together and using technology. All of these things will have just as good an impact on your children’s vocabulary, imagination and reading skills, as dare we say, homework! 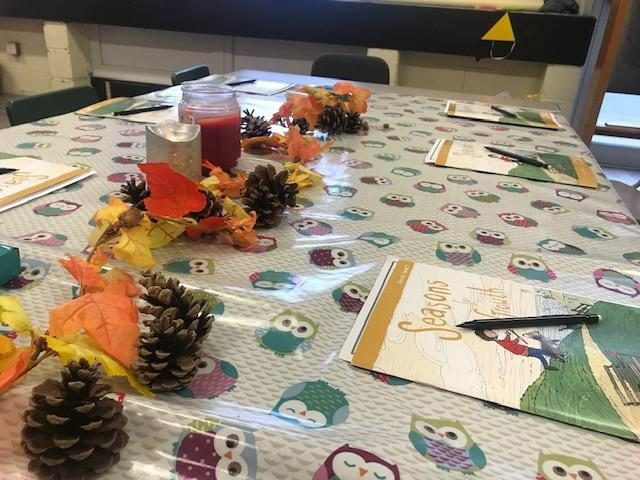 In Week 5 of Families Connect we chatted about fun ways of sharing stories. One idea was to try to fit in sharing a book at different times of the day. Reading at bedtime is probably the norm and can help establish a bedtime routine. But by this time, parents are normally flagging and either falling asleep or negotiating down the number of books! Alternative suggestions were to read during bath-time and maybe even pick a fish or pirate themed book. Or to read together during mealtimes, with the added bonus of helping to keep the children at the table. For one family, trying books during dinner went down a treat and gave them a welcome break from the long-running game of eye-spy! Telling stories when you are on the move, is another great idea to broaden literacy skills and really stirs up children’s imagination. Our Families Connect families thought that making up stories together helped to keep their children interested when out on a (boring!) walk, or on a long bus journey. But making up stories can be quite daunting for us adults. 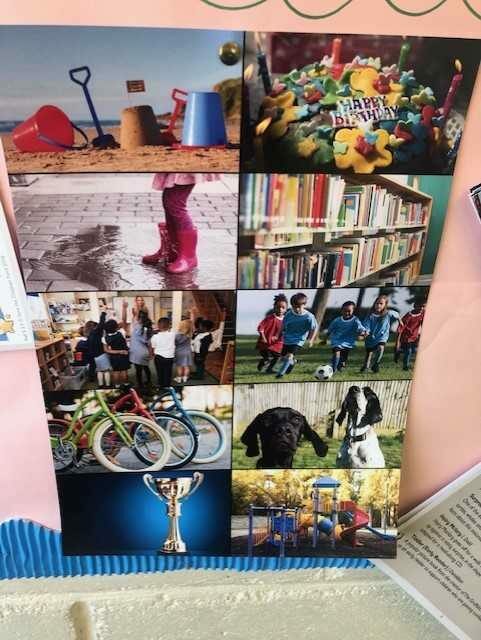 So, we looked at things we could use to help our story-telling, like cutting out pictures from a magazine or using old photos to use as prompts when at home, or using what we see around us like road signs, animals, people etc when we are out and about. We also got the chance to use the photo cards pictured below to have a practice, as well as looking at the CBeebies Storytime app as an example of how we can use technology to widen our reading experiences. Parents can have mixed views about using technology but as long as we are joining in with our children, apps and audio books etc can just be different ways of sharing stories. So, if you are one of those parents falling asleep during bedtime stories, why not try sharing the ‘extra’ stories promised at a different time of day or making up a story together when you are going about your everyday activities. This will be great for your little one’s reading skills, can make things more fun for you too and can even help manage situations where tricky behaviour might be expected – like mealtimes, bath times and plain old boring times! This week we have been really artistic! We have made some surprise creations for our mum’s for Mother’s Day and we were also inspired by Pablo Picasso and we made our very own interpretations of his work. In Maths, we have been continuing to learn about time as we have been finding it a bit tricky, especially quarter to on a digital clock. We are going to keep practising this at home too so that we are more confident in telling the time! In PE we have been learning how to skip forwards, backwards and in groups. We need go co-ordination to do this. In Literacy some of us wrote about our mum’s and how they are superheroes and some of us created a fact file about some Egyptian pharaohs. Some of us visited the church twice this week. Once was to practise and prepare for The Sacrament of Reconciliation and secondly we went to Stations of the Cross with Fr. Francis. 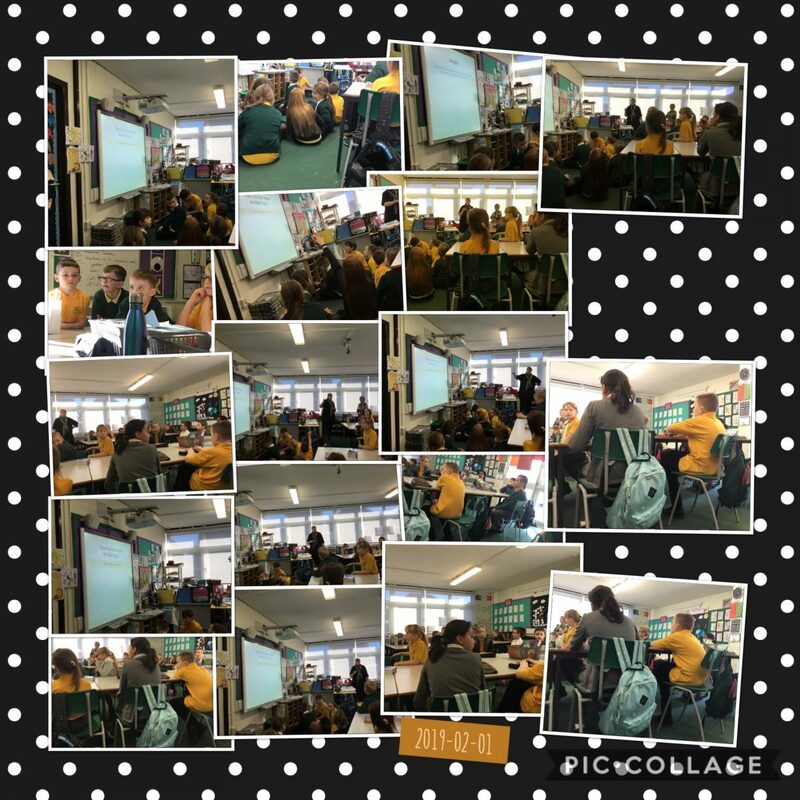 In Digital Learning this week we were making animated cartoons using Scratch on the netbooks and then we got to show our creations to our classmates. It was cool! Lastly, we have been singing lots this week in preparation for the Stations of the Cross service which will be in school next week. Today Mrs Fitzpatrick answered our questions on the gift of wisdom. 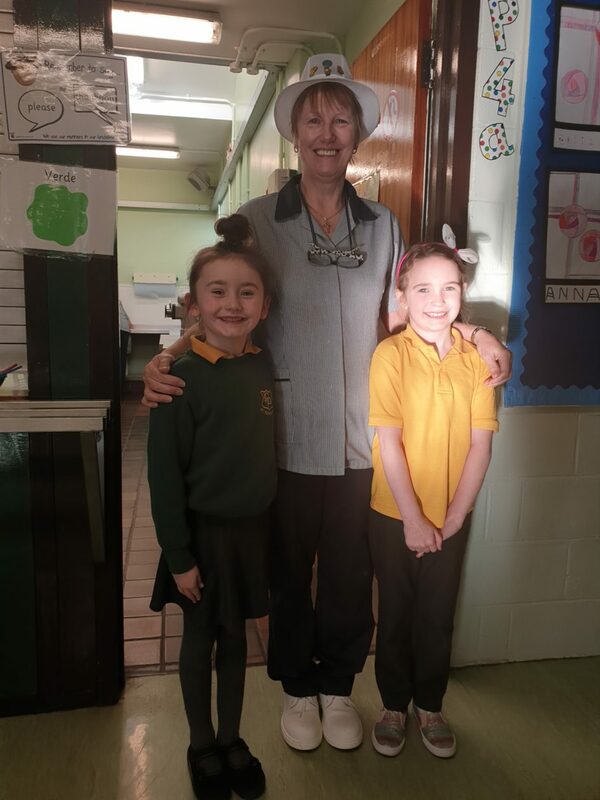 We invited her into our class as this was one of our tasks for the Pope Francis Faith Awards. She told us about the many subjects and experiences that had helped to make her wise. Mrs Fitzpatrick told us that her dad made her wise as he taught her great things and gave her advice. She enjoys reading autobiographies and she found the book about Alex Ferguson to be inspirational. We enjoyed having Mrs Fitzpatrick in to talk to us today and she gave us good advice for our lives. We have written a report on the advice that she shared with us. Our Friday music sessions with NYCoS are coming to an end next week. 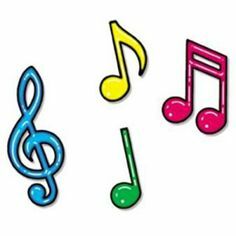 We have been enjoying learning about beat, rhythm and musical notation over the past few months. Today we worked in groups to create and perform our own music! In topic this week we have been learning about the mystery of Lord Darnley’s murder. Some people believe his wife, Mary Queen of Scots, was guilty but to this day we still don’t know for sure. It really is a mystery! 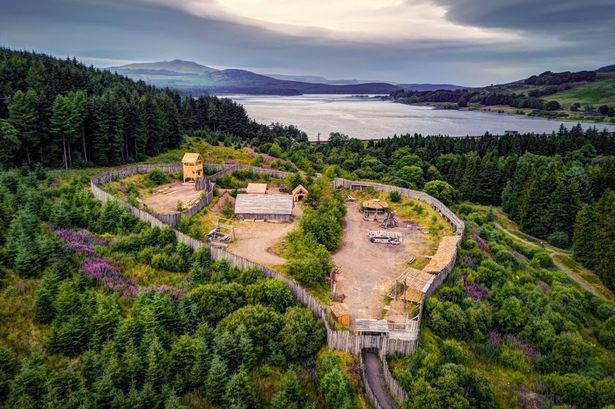 We are really looking forward to our trip next week to Duncarron Medieval Village where we will learn more about what life was like in these times! 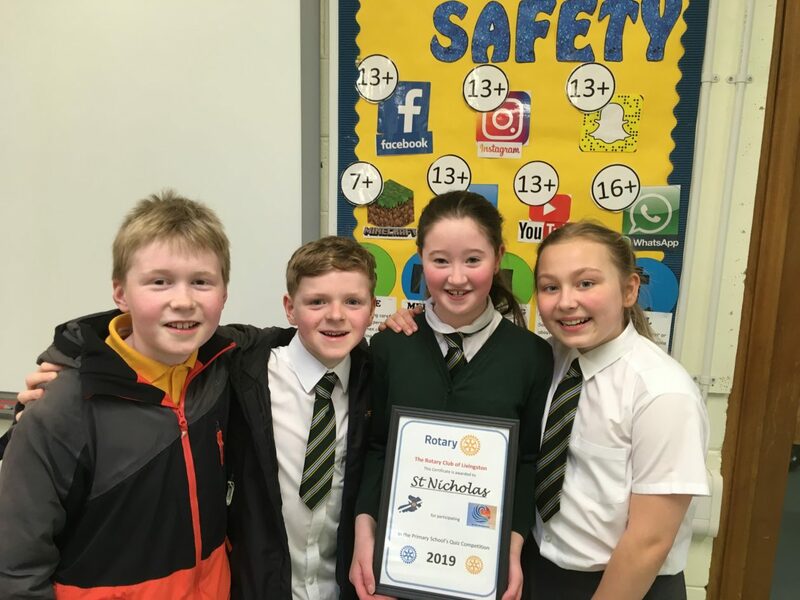 Hot off the press – St Nic’s Quiz Champs scoop another award! 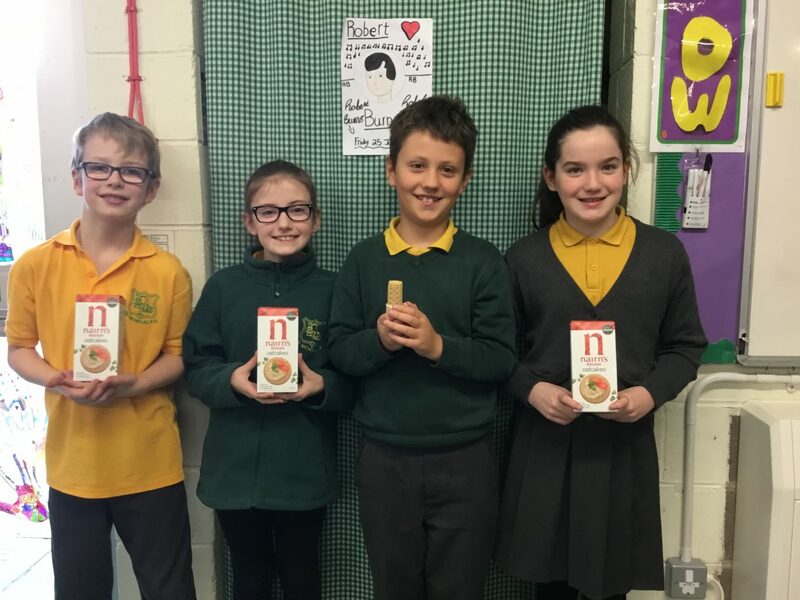 A huge well done to Harris, Nia, Ethan and Natalia who have just returned from the Rotary Club Quiz at Broxburn Primary School, where our P6 quiz champions scooped 2nd place. They were beaten by just 1/2 a point. Well done boys and girls – we are so proud of you. You have great team spirit and are a credit to your school, your parents and yourselves. 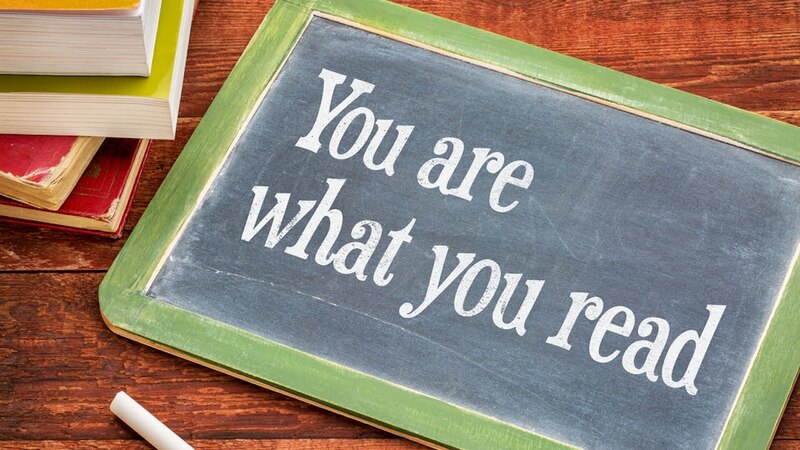 Be honest, have you ever found yourself groaning at the sight of reading homework? Reading together doesn’t only have to be about ‘decoding’ the sounds and letters. Whilst this is an important part of your child learning to read, and requires a fair bit of patience, books don’t need to feel like hard work! The most important thing that you can do for your children is make them feel positive about books. The more fun they have, the more they want to read. The more they read, the more their vocabulary expands, their imagination runs riot and their comprehension gets better. * Don’t be shy – make up actions, sound effects, strange character voices and even act the story out! All of these things make reading together more fun for everyone, and many parents will just do them automatically. 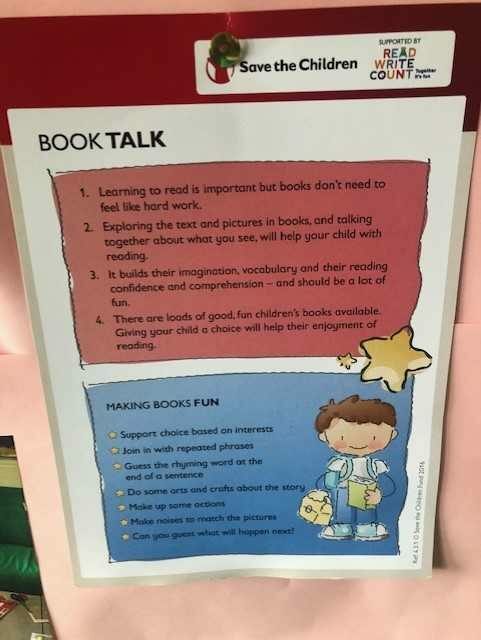 Another thing that often comes naturally, we call ‘Book Talk’ in Families Connect. 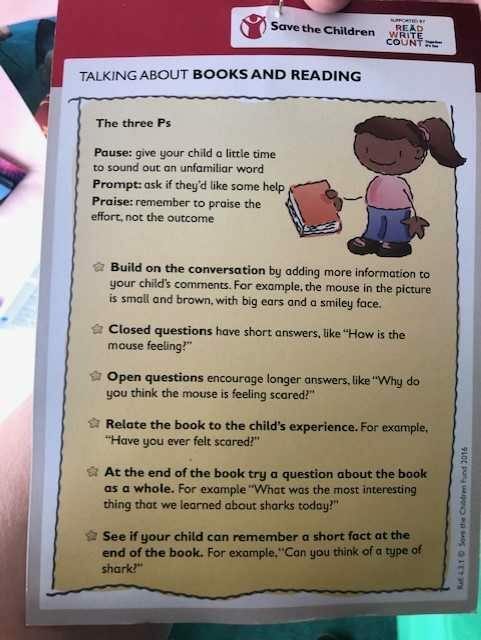 This is when you chat about a book as you are reading it together and ask some questions to help your child understand and relate to the story. So, asking open questions like ‘What do you think the mouse is feeling here”, “Have you ever felt scared like that” and “What plan might you come up with faced with the Gruffalo?”. Again, this shouldn’t feel like a quiz as there are no wrong answers and you shouldn’t feel pressured to come up with a question for every page either! We tried all of these techniques in Week 4 of Families Connect and really had lots of fun reading together. We found that a really important thing is to let your child pick a book based on their interests – any reading is good reading! To our surprise we even had one little boy who didn’t really like reading and at the end of our exercise asked if he could have another story. Well done to all our parents, that’s what success looks like! A huge thanks to our committed and hardworking Parent Council who organised a wonderful event for the St Nicholas PS. community on Friday night. We had a ceilidh (run by our PE teacher, Mrs Smith), Irish dancers, raffle, Irish Bingo, a disco and delicious hot food by the Canon Hoban staff. 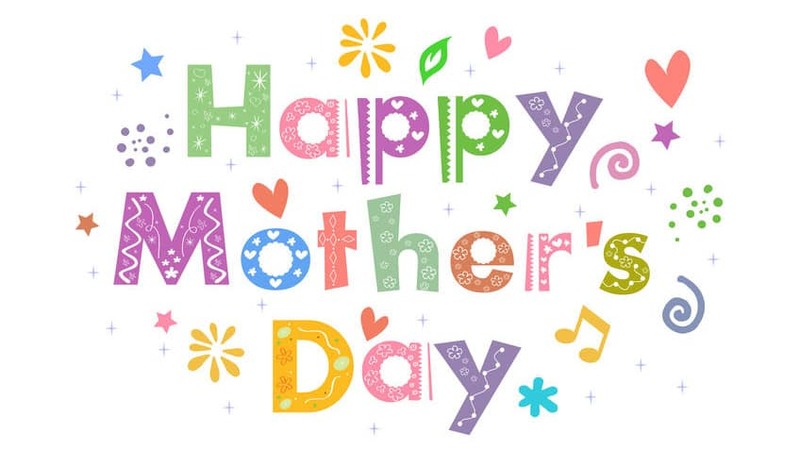 A huge thank you to the following partners who helped make this happen by donating to our raffle: Potter Around in Kirknewton; Houston House Hotel, Uphall; Kirsty Loves Hair, Broxburn; Final Touch Beauty, Broxburn; Florist in Argyle Court, Broxburn (10% off Mother’s Day Flowers plus free delivery if you mention St Nicholas); Lawson’s Butchers; Tesco, Bathgate; Morrison’s Livingston; Scotmid, Broxburn, Lindt Chocolate, Livingston; Dance Store; Broxburn. We are very lucky to have our Parent Council who work tirelessly alongside us to improve outcomes for our children. Children, parents and staff all had a ball! Looking forward to the next community event. Well done to Chloe and Poppy in P5 for taking part in a gymnastics competition at the weekend! We have had a busy week in P5b. This week we have been continuing with Multiplication in Number talks and in our Numeracy lessons. 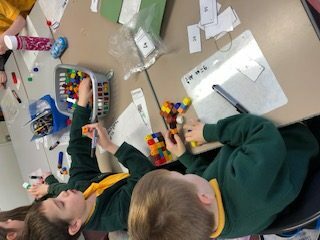 In Number talks we have used the strategy partial products this week and also used friendly numbers, doubling and halving and repeated addition. 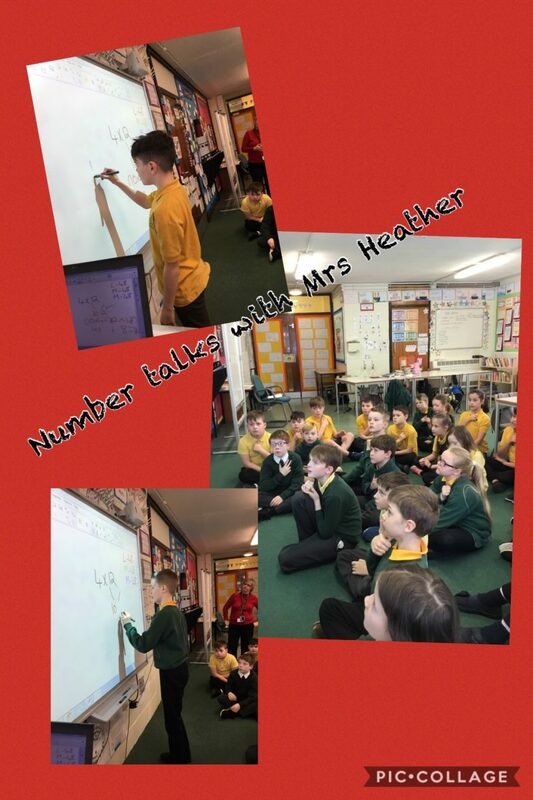 Mrs Heather came into class and worked with us on Thursday. In Numeracy we have worked on the formal written method of multiplication. Marwa – there are different ways to do the written. Mirin – this method is easier than a vertical sum for me. We have practiced this week and are getting really good at it. In maths with Mrs Renshaw we have started to looked at measure and started to estimate the length. In Literacy we have completed spot the silly word in two different pieces of writing. Sam – one was a job advert and the other was about Harry Potter. Phoebe – you need to read the whole piece then look for words that don’t make sense. 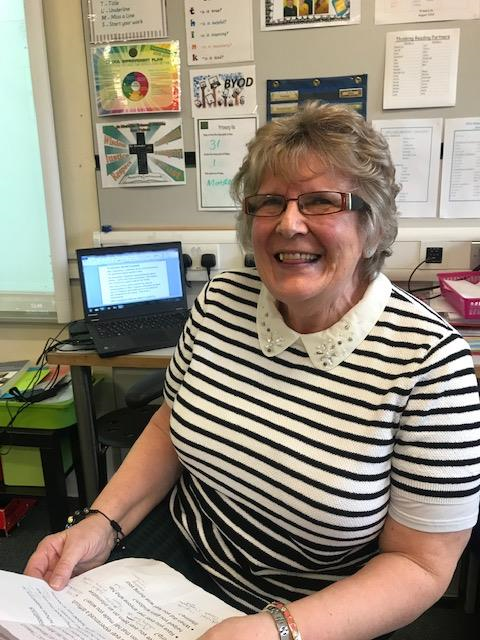 Paula – we have continued with literacy circles and are improving with our group discussions and peer assessments. In writing we wrote a diary entry about when the Titanic hit the iceberg. Max – In a diary you must discuss your feelings. Connor – you must use ‘I’ when writing a diary entry. It also has to be in the present tense. In Health and Well being we looked at advertising and how companies advertise products to get people to buy them We discuses different strategies like buy one get one free, half price, toys in boxes and tokens to collect. Ellie – We then created our own cereals and next week we will create an advert for our cereal. Sam – we also discussed what makes a good friend and created a ‘wordle’ about friends. Some of the things we think they need to be are- kind, caring, honest and trustworthy. In our Titanic topic we created adverts for Titanic. We talked about communication on board the Titanic and how important it was. We also looked at the technology on the Titanic. We also completed a cross section of what was inside the Titanic looked like and looked at where things were placed for first and third class passengers. We also visited the library this week and had a look for Titanic books. These are only some of the things we have covered this week. What a busy week! We have had another great week in P4b. We have been learning how to spell words that need a prefix and working on the proper use of exclamation marks. We have been learning that it is more effective in writing to use one exclamation mark and not lots !!!!!!!!! (ha!). In numeracy, we have moved onto telling the time in one minute segments and are still practising our times tables as we know important these are. Liam – She was born in 1542. Cameron – She was born in Linlthgow Palace. Natan – When she was 6 days she became Queen of Scotland. Catherine – She married three times. Lily – She moved to France when she little because her mum did not want her to marry Price Edward. Hamza – Her cousin Queen Elizabeth the First was jealous of her. Alicia – She was a Catholic. Lucas L – She was imprisoned for 18 years. Shay – The axe fell on her head three times. Oliver – She watched her friend, David Rizzio being murdered. Freyja – Her mum was Mary of Guise. Leonard – Henry the 8th the King of England wanted his son to marry Mary Queen of Scots. Holly – Her first husband was the Dauphin of France. Mya – Her second husband was Lord Darnley. Gerard – Her third husband was the Earl of Bothwell. Wojciech – She was beheaded. Gaby – She did not have a good life. Olivia – Her mum was born in 1515. Lucas C – Her mum died in 1560. Haroon – When she died one of her dogs was found hidinhg under her dress. 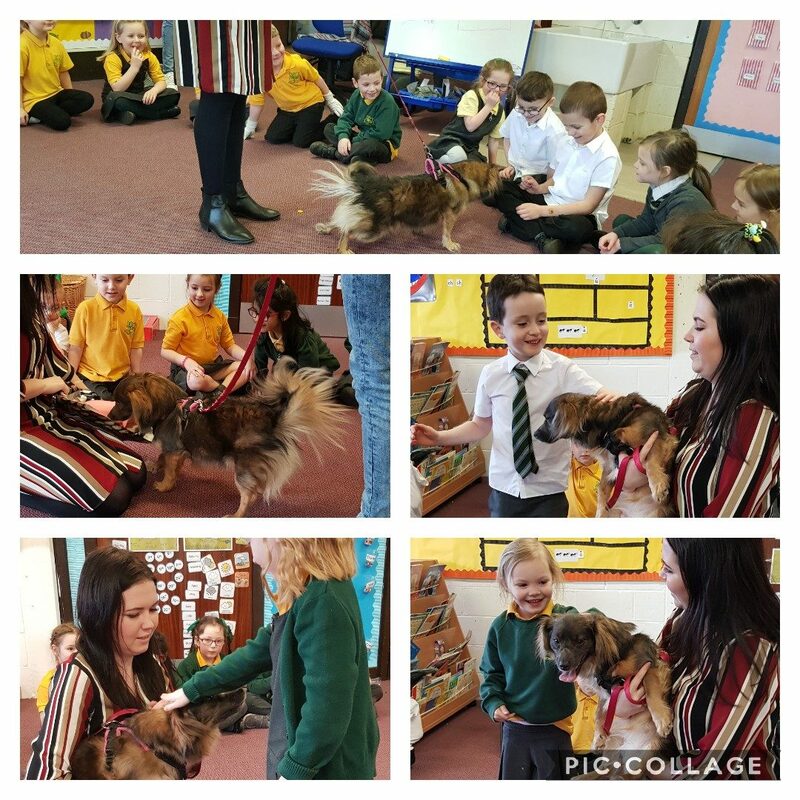 Cami the dog visits P1! We also met with our p2 buddies for the first time, while with our buddies we read a book to each other. We had such a good time. Some p6 parents also came into our class for a career talk. Fun filled week in P2! `It is difficult as busy parents to always find time to listen to our children, especially if they are little chatterboxes! However, listening to them makes them feel valued and helps their development in so many ways. It also helps us to understand how they see the world, what they might be finding hard and what they might be feeling. Crucially, it has also been shown that if children trust us to listen to the little things, they will share the big stuff with us as well. But there are so many things that can easily get in the way of us listening to our children, no matter how well-intentioned we are. I wonder what the biggest barriers are for you? 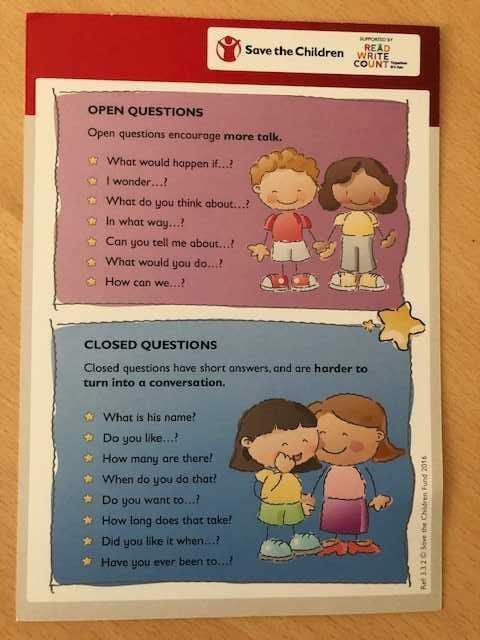 We did an exercise in Week 3 of Families Connect where some parents deliberately (and secretly) tried to be ‘bad listeners’, as others parents excitedly talked about something important to them. Despite brainstorming all the nasty things we might do to be bad listeners, the thought of being rude and hurtful made it really hard to pull off! Because we all know what it feels like when we aren’t being listened to, and we all know what to look for in a ‘good listener’. 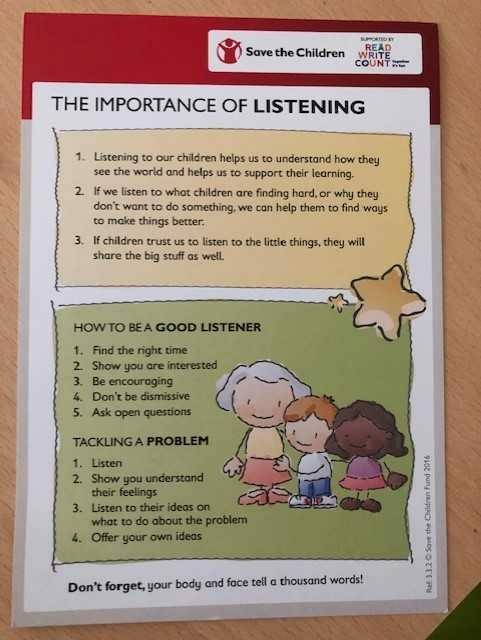 All of these pretty simple tips can help us to listen carefully to our children, a small investment that really can make a huge impact on how valued they feel. Mrs Cook, Mrs Walker and Mrs Spence have really inspired some of our primary 6s in this week’s career talks. Thank you very much! Did you know that for every one positive comment our children hear, on average, most will hear 8 negative comments? Now, we can’t really feel bad when we have to shout ‘don’t run onto the road’ or ‘don’t put that pea up your nose’! But it does sound a bit imbalanced doesn’t it. The problem is that it is positive comments, from people that matter, that can have a brilliant impact on children’s self-esteem, their sense of value. This feeling of self-worth helps their confidence, their ability to learn and their belief that they can do anything. So, whilst we are busy keeping them safe, we might also remember that it is catching them being good that is more valuable, than catching them being naughty. Research also shows that some types of praise are more ‘helpful’ than others for children in valuing themselves and growing in confidence. In the second week of Families Connect the parents had a shot of practising this ‘helpful praise’ with each other, before being let loose on the children! We practised ‘good praise’ and ‘bad praise’ and were left in no doubt about which felt best and was more helpful. 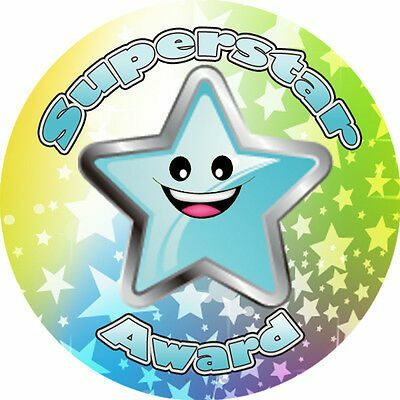 With the children, we made superstar awards. These were taken home as a reminder to parents to look for the positives and to praise everyday little things, using the stars in whatever way worked for their family. For the children, the awards were simply to make them feel valued and to understand what they were doing well. For one family it definitely worked, with one little girl feeling SO valued she sported her award for an entire weekend in all weathers! •	Genuine – children can spot when the words don’t match the facial expression and body language! •	Focused on effort – rather than the outcome (‘you won!’). By focusing on the effort and approach taken, children know that trying is important, that they don’t have to be stuck at being ‘good’ or ‘bad’ at something, they can practice and get better. It also means they will be happier to try something new. •	Without a sting in the tail – ‘what a great drawing, next time you might want to give the person facial features!’. When children hear praise mixed with criticism, they only remember the criticism. Use these tips to try switching the 8:1 ratio and encourage our children to do more of the stuff that gets them praised. Some of this might not come naturally at first, but practice makes perfect! St Nicholas are offering the P6 and P7 pupils the opportunity to participate in our Seasons for Growth programme this term. Seasons for Growth is a programme devised to help children to cope with changes in their family through loss or bereavement. The programme was developed in Australia over 20 years ago and is used across the globe to support the emotional wellbeing of young people. We hope to offer the programme to other age groups in the coming months. 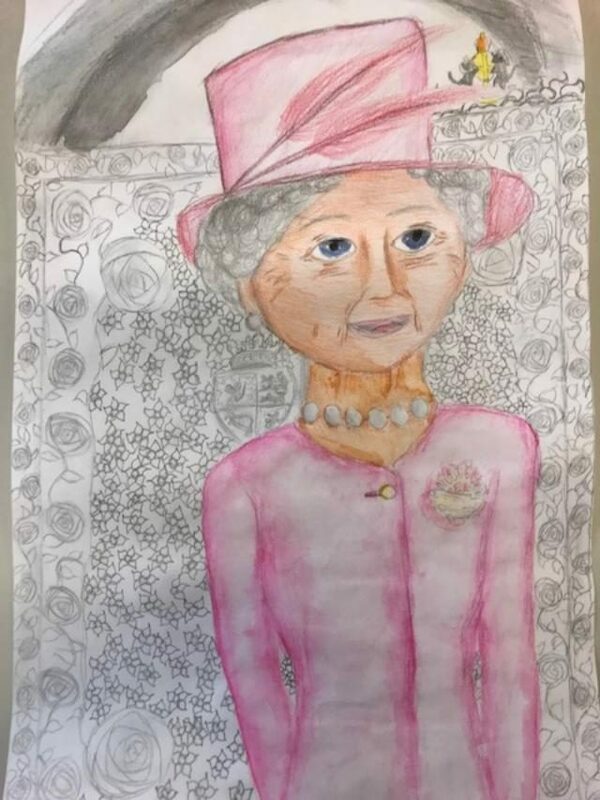 Primary 6 have been using their creativity to design entries for the John Byrne Art Competition. 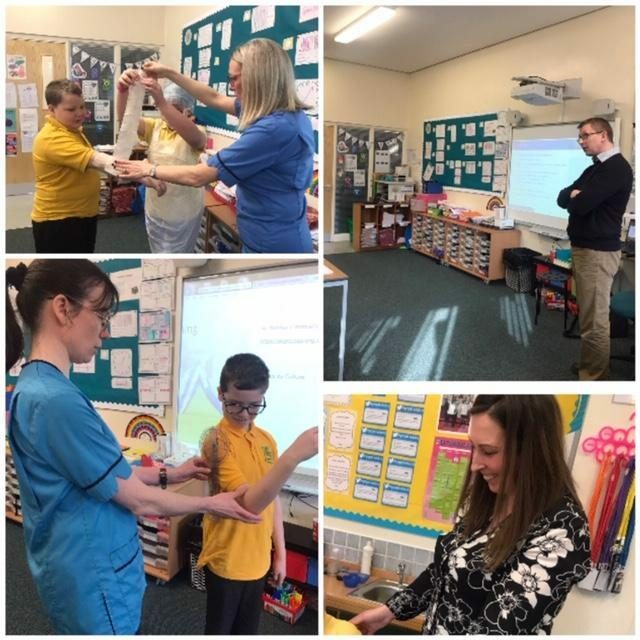 Primary 6 have been so lucky to hear about a variety of jobs from parents who have been visiting our classes over the past three weeks. Today we heard from Mrs Spence who explained how her job will influence the future and lifestyle of prospective jobs for our pupils and showed how life may be in 2037 – it was fascinating and certainly food for thought. Many pupils have been inspired by these presentations and have started to think about their future employment. We would like to say a huge thank you to the parents who took time to pay us a visit. 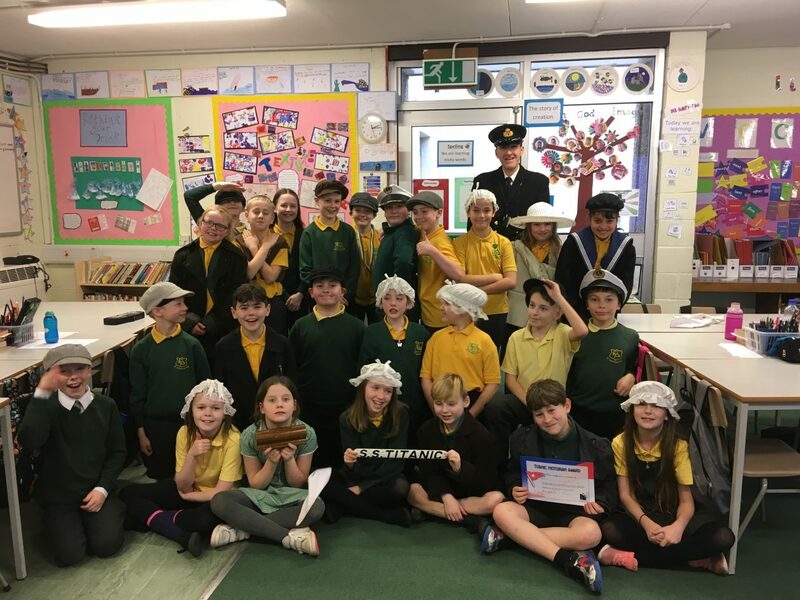 P5 sail aboard the Titanic! 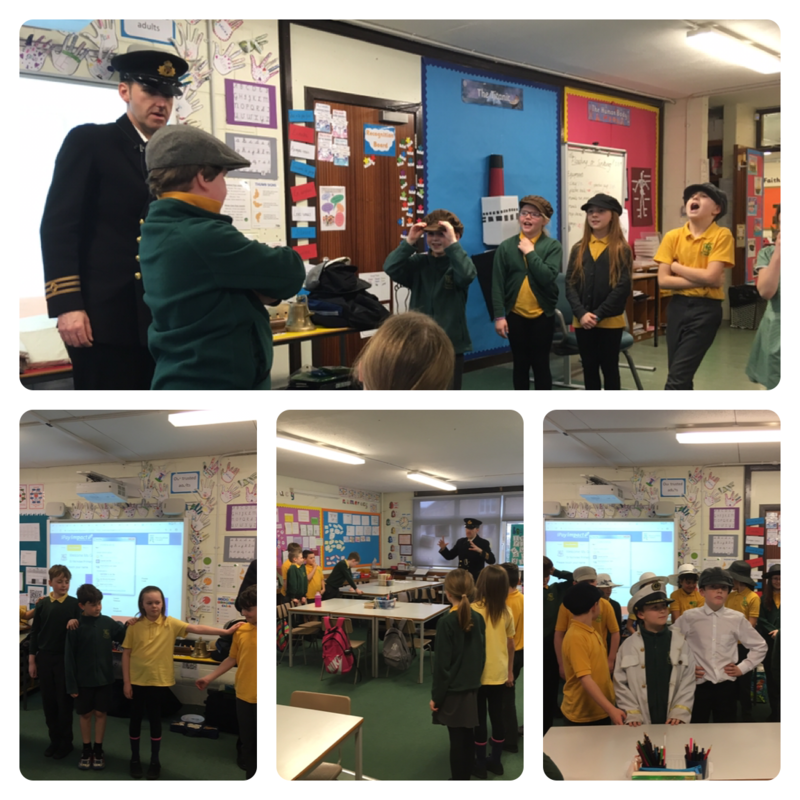 Primary 5 learned so much today from our Titanic workshop! We took on different roles as the passengers and crew of the ship. We found out what happened from the shipyards to the day the ship went down. Thanks to Captain Sean for such a memorable day! We have had a busy week in class learning lots of new things. Christy – if you put Fair trade banana skins on mosquito bites they go away. Ellie – I learned that in the UK people eat over 5 billion bananas in a year. Max – over 1.66 million farmers and workers produce Fair trade products. Ciaran – there are over 100 billion different Fair trade bananas produced a year. Mirin – we made a Titanic display. Phoebe– we completed our well being check in. Charlie – we have been learning bout Michelangelo and his image of God. We have been using our own devices to complete research and find out more about Fair trade and the Titanic. This week seems to have gone in a flash ! What have we been up to ? In literacy we have been talking about how important reading is. 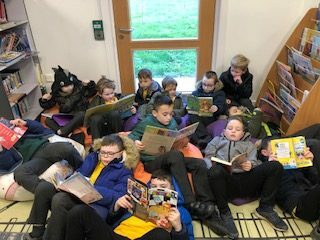 We are making a real effort to read more books for enjoyment and not just the reading book that we are given at school. We also been learning about prefixes and our sound of the week has been ph. In maths we have been practising telling times on analogue and digital clocks. We have also spoken about area and are continuing to practise our times tables. We drew some daffodils this week and used wax crayons and watercolour to colour them in. We are proud of these are we all made a beautiful job and put in a lot of effort. 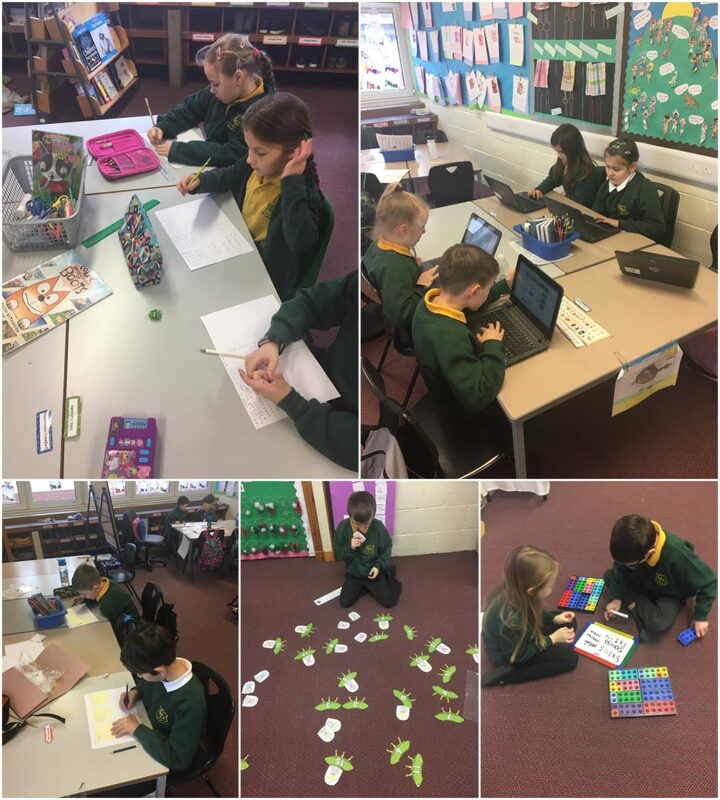 In digital learning some of us manged to finish recording our books for the P1s and we have also used the laptops and ipads to play maths games on. And for the exciting part ! 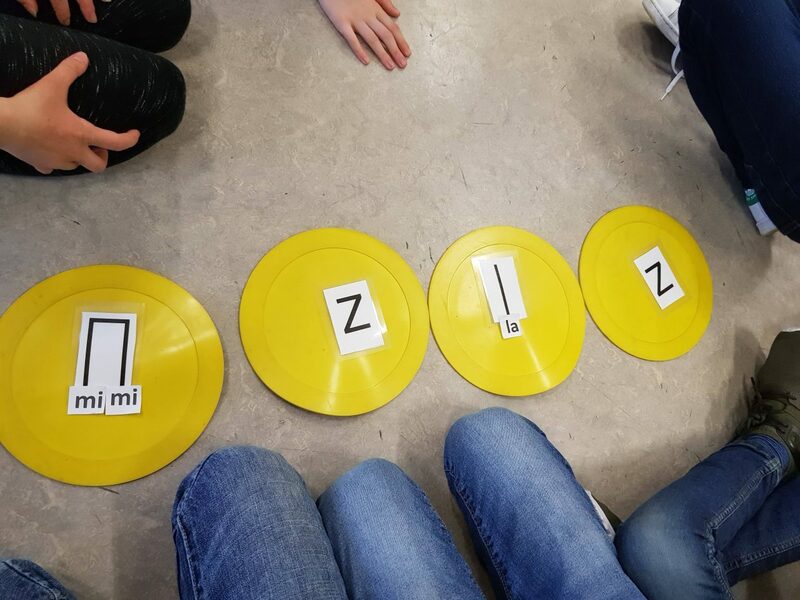 In our music lesson earlier today we were taught how to read music using two notes , ‘so’ and ‘mi’ . This was challenging to begin with but we got there in the end. We are great at using our growth mindset in P4b. We certainly don’t give up when there is a challenge. Have a nice weekend everyone ! What have we enjoyed the most this week ? 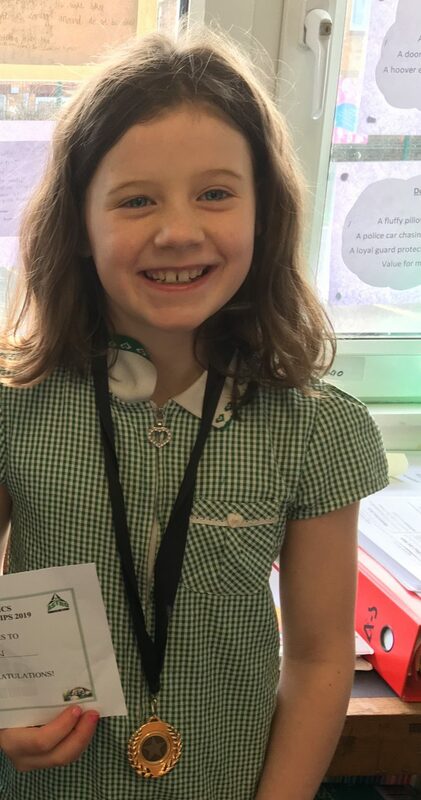 Catherine – ‘I have enjoyed completing all of the maths games on the computer’. 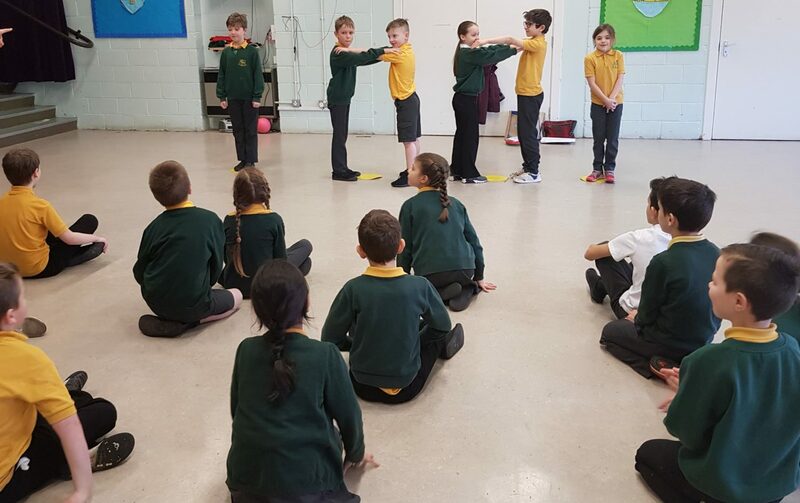 Shay – ‘I have enjoyed balancing in P.E’. Gerard – ‘I have enjoyed completing more time activities’. Liam – ‘I have enjoyed recording ‘Mr Big’ for the wee ones’. 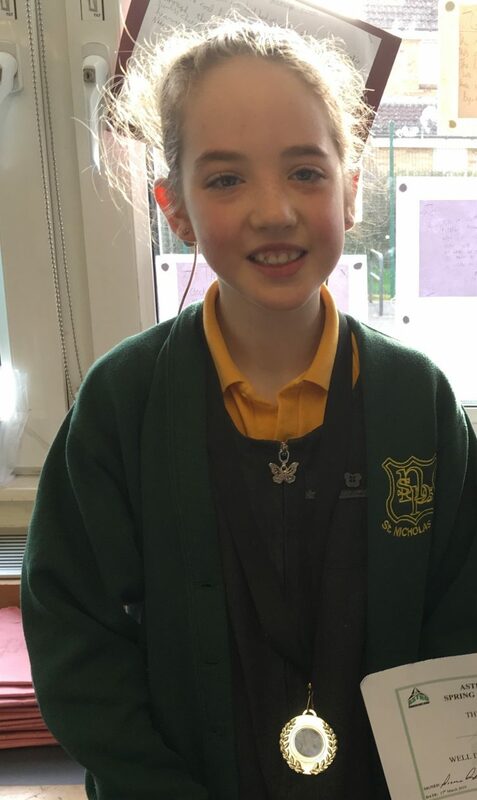 Freyja – ‘I have enjoyed reading because my book is exciting’. Alicia – ‘I have enjoyed doing the deliberate mistake task. This is when we read a story and have to find the silly words and highlight them’. 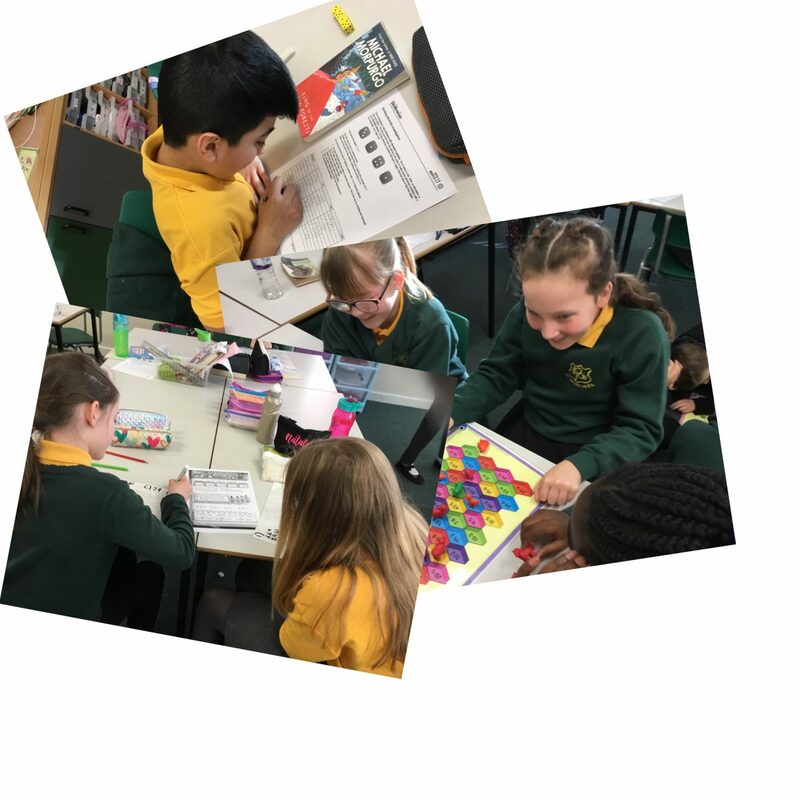 In Numeracy this week we have been learning about fractions and have been calculating halves, thirds, quarters and fifths of shapes and numbers. We know that if we are confident counting in 2s, 3s, 4s and 5s this will help us to calculate fractions of numbers. 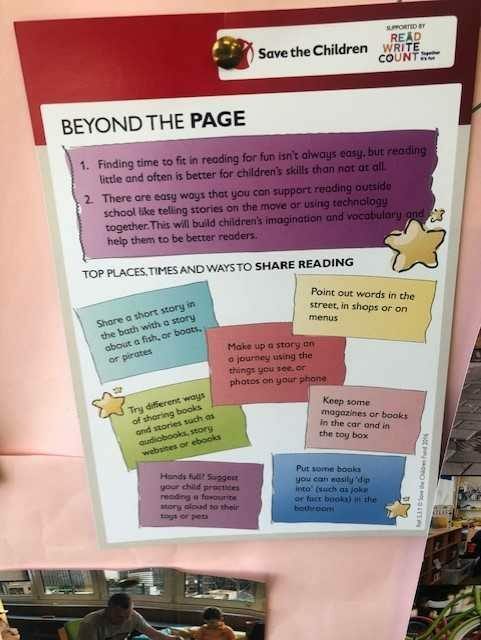 Our teachers did some training on something called ‘Reflective Reading’ and they taught us some of the skills that they learned and the skills that we need to make us better readers. We did things like ‘Blankety Blank’ where we had to work in groups to think of words to make a sentence make sense. We also did a ‘Picture It’ and had to read a gruesome description of The Bloodbottler from our new novel ‘The BFG’ and we had to draw a picture of him. 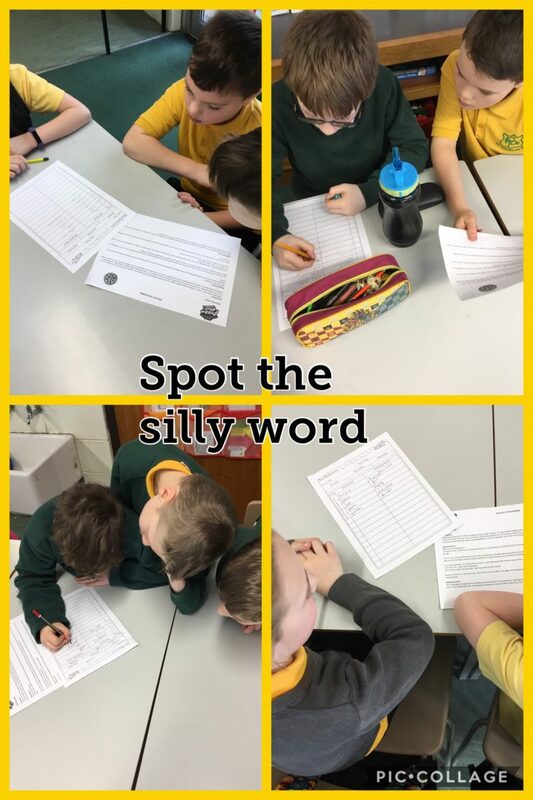 Lastly we did a ‘Spot the Silly Word’ where we had to replace a silly word with a sensible word. We did this through our topic The Ancient Egyptians. We realised that we already know lots of interesting facts about The River Nile and the pyramids. Last week we finished our class novel ‘Charlie and the Chocolate factory’ and this week we have been enjoying watching snippets of the original movie each day and have been comparing and contrasting the book to the film. We realised that there are quite a few differences between the two. 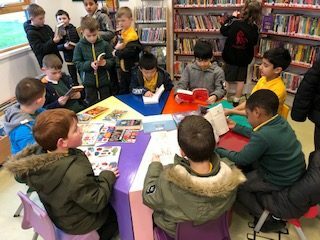 We visited the library this afternoon and enjoyed choosing a new book to read. In our Digital Learning we were using an app called Stickbot Studio and we were creating our very own animation projects. We realised that we had to move our objects little by little in order for it to look like it was actually moving. It was great fun doing this and working as a team. We had a visit from Fr Jeremy and a visiting priest from Nigeria called Fr Francis. He told us all about Nigeria and he will be helping us when we make our First Reconciliation. It may have been a short week but we have managed to pack a lot of learning in. What have we been up to ? Well firstly, we welcomed a new friend to our class, Natan. We are delighted to have another friend in P4b, welcome to Saint Nicholas Natan. 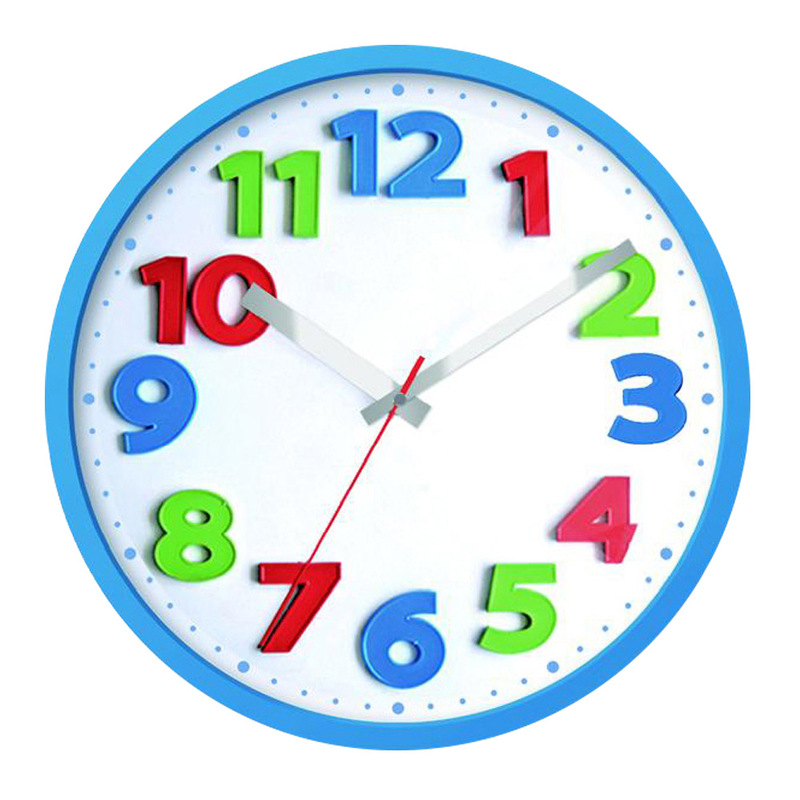 In maths we have spent more time on how to tell the time using all of the numbers on the clock. We are becoming really good at this. We have also been practising counting up and back in 7s. Quite challenging for some of us but we know that we will become experts soon enough. In literacy, we have been learning how prefixes can change the meaning of a word. 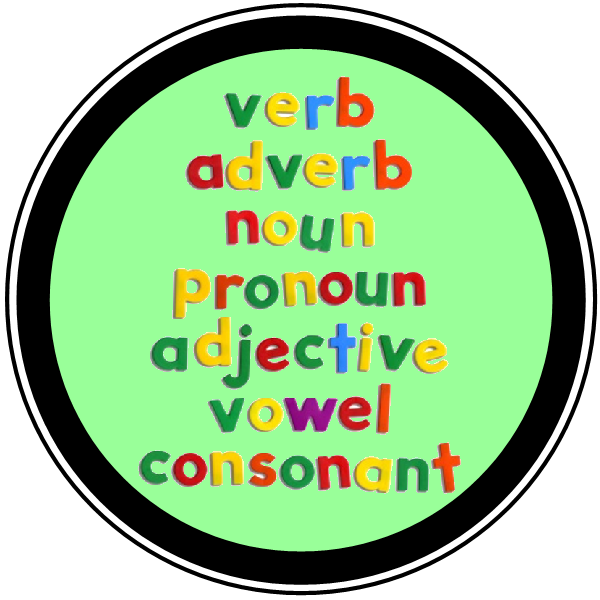 We have also revised nouns, adjectives, verbs and alliteration. We have also been reading more texts for inference and have enjoyed listening to Mrs Macdonald reading our class novel, ‘The Witches’ by Roald Dahl. It is sooooo funny ! In P.E with Mr Muldoon and Mrs Smith, we have been perfecting our gymnastic skills which has been fun too. As part of our digital learning, we worked together in groups and used the Ipads to record us reading a story for the P1s. We will finish it next week and then use a QR app to make a code which we will then stick inside the book so that the P1s can scan it and hear us read ! Sadly, our topic, ‘Famous Scots’ has come to an end. However, we are excited to start our new topic next week although we do not know what it is yet , it is a surprise ! Haroon – I have enjoyed P.E because it has been fun in gymnastics and learning how to balance. Oliver – I have enjoyed learning about time. I find it cool how every number represents five minutes. 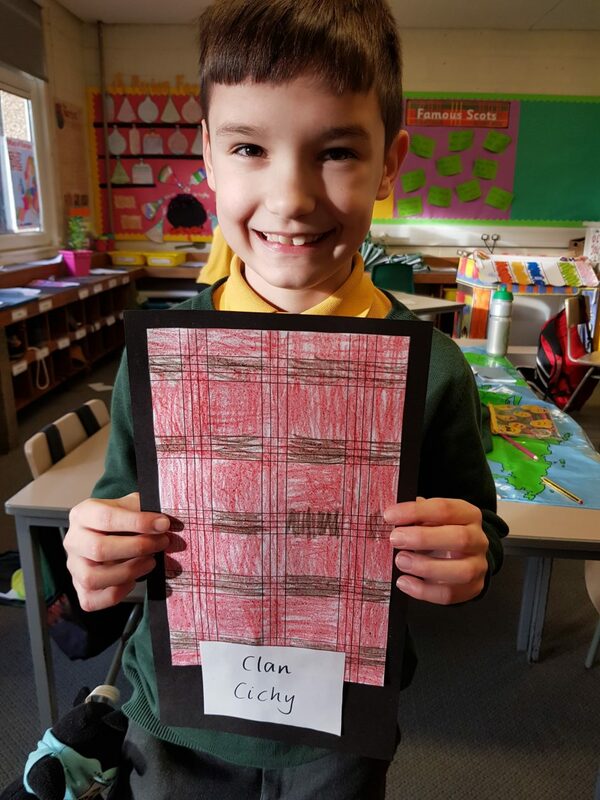 Lucas C – I have liked designing my famous Scots poster because it is fun learning about the different famous Scots. Ethan – I have liked reading ‘Kipper’s Balloon’. Natan – I have enjoyed learning about the time and have had fun in my new school. We have been taking part in a drawing and engineering contest. In the drawing contest we had to draw what ever we want and John Byrne would pick and it’s a Scotland competition and there is only 1st 2nd and 3rd. Have you ever tried to tackle a tricky job whilst feeling angry? Ever tried to engage in a meeting at work when something at home is really worrying you? It’s hard to concentrate when emotions are running high. That is what it’s like for our children. 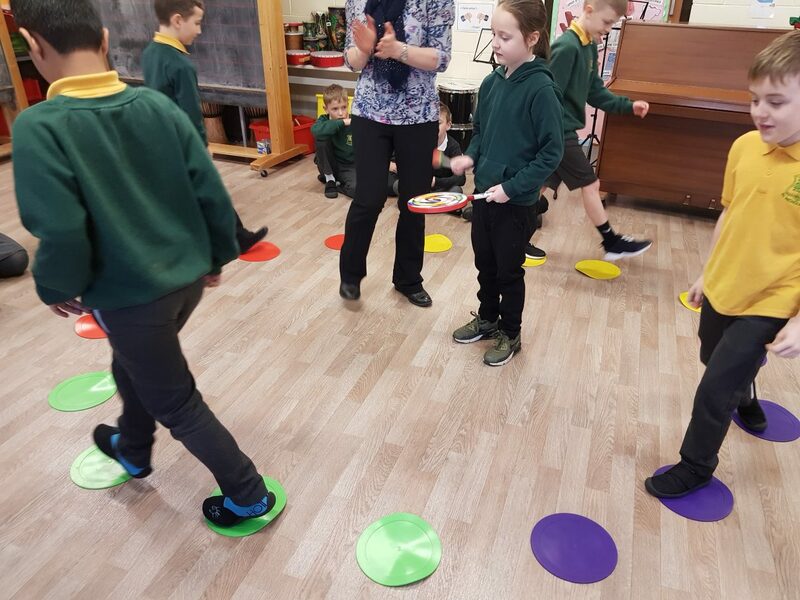 For them to concentrate on their learning, this requires managing a whole range of, often uncomfortable, feelings; it requires them being in a ‘good headspace’. We all know the horrors of tackling homework when they are too tired, too frustrated or even too excited about something else! But it’s even harder than that for our children. We know the words to use to describe feelings. We know how they might impact our bodies, faces, our thoughts, even our actions and behaviours. Our children are still getting good at this. They need help to associate with, recognise and name all the feelings that they might experience. They need practice in talking about their feelings. When they become more confident naming and understanding feelings, then they are better able to manage them and focus on their learning. That’s got to be easier all round! We cheated! We had some tools to help us talk about feelings with our children – a magnifying glass to hold over parts of our body that might give us clues to our emotions. Held over a ‘washing machine’ tummy, as one mum brilliantly put it, for example when we are anxious. In time children learn that this feeling doesn’t mean they are unwell, but scared about something and that is the first step to dealing with those feelings. 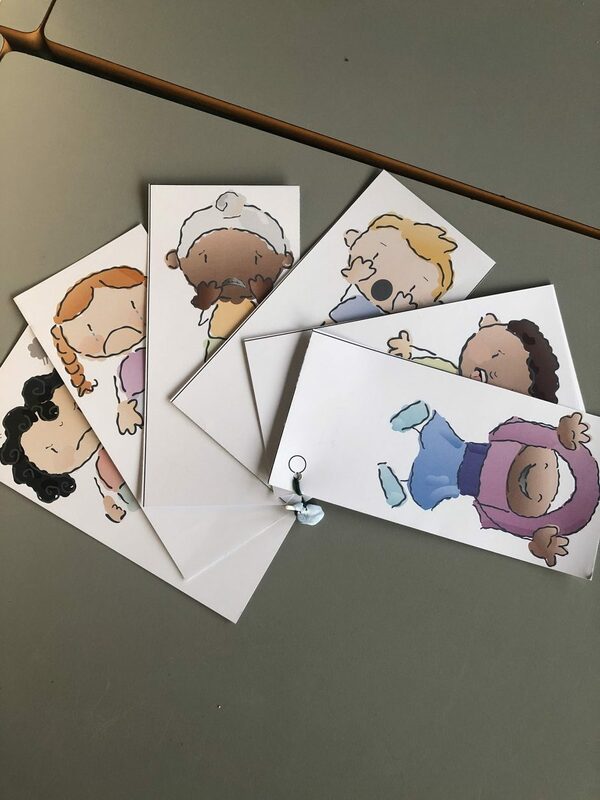 We also had the help of a feelings fan, a set of cards showing drawings of children with the 6 universally recognisable feelings – happy, angry, scared, surprised, sad and disgust. As you know there are many more feelings! But these are a good place to start when talking to your children. You can see our fans in the picture below….you might like to make your own feelings fan at home and use it as a prompt when chatting about your children’s feelings or even your own! Here is a little snippet of our Friendship rap which we performed at our assembly on Friday. We hope you enjoy it! We have had another busy week in P4a. In Topic and Literacy, we wrote about Famous Scots who inspire us. Michael – Andy Murray inspires me because he is a very good tennis player and when I grow up I want to be the same. Kaylan – John Logie Baird inspires me because when I grow up I want to be an inventor too. Lara – Saint Margaret inspires me because she helped the poor and when I grow up I want to help others by being a teacher. Leon – Andy Murray inspires me because when I grow up I want to help children play tennis too. 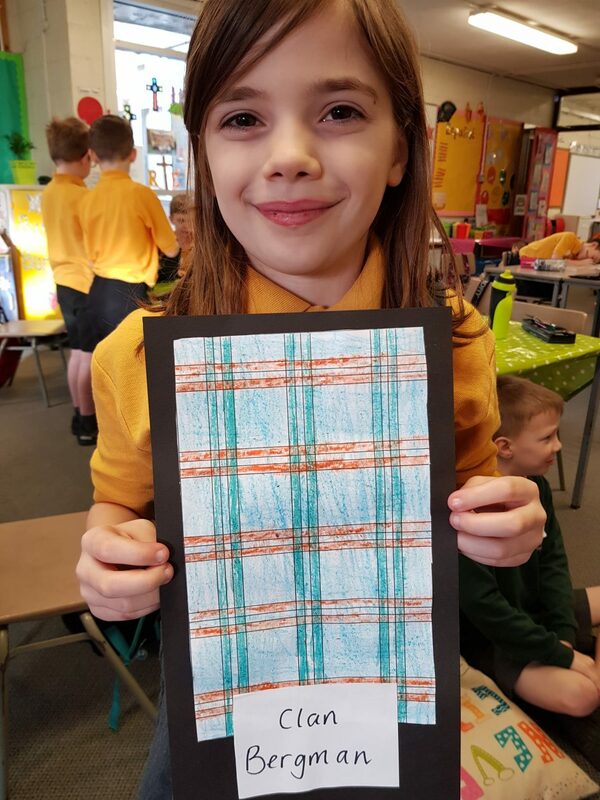 We have started making giant posters about all the ‘Famous Scots’ we have learned about the past few weeks, bringing together our skills in ICT, reading, writing and research. In Numeracy we have changed our focus to ‘Time’. We learned about using a calendar and we made our own, adding some important events such as class birthdays and the February Break! We played games with the clocks too, recapping o’clock and half past times. On Tuesday, Archbishop Leo Cushley came to visit our school. His Grace came to our classroom and we sang him some songs about the 12 Disciples. We also prayed together for all the people who help us in Primary 4, especially as we prepare for the Sacrament of First Holy Communion. Finally, in Music we played ball games, sung songs and learned about the rhythm names: ta and te-te. Primary 5 have had a busy week. Here are some of the things we have been doing and learning. 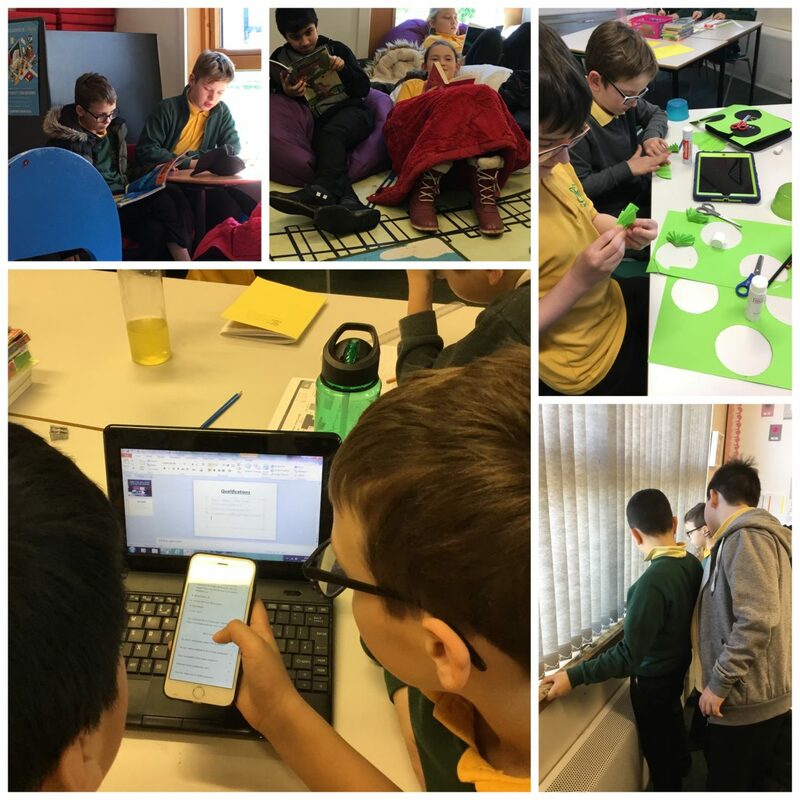 Mirin – this week we made an emotions timeline thinking about how we felt at different points in our lives. Marwa – we started to learn about the Titanic. Ciaran – we learned that the Titanic was on her the first trip from Southampton to Nee York. Daniel – we thought about we what know and what we want to learn during the topic. Lucas – we have continued to practice our cursive script. 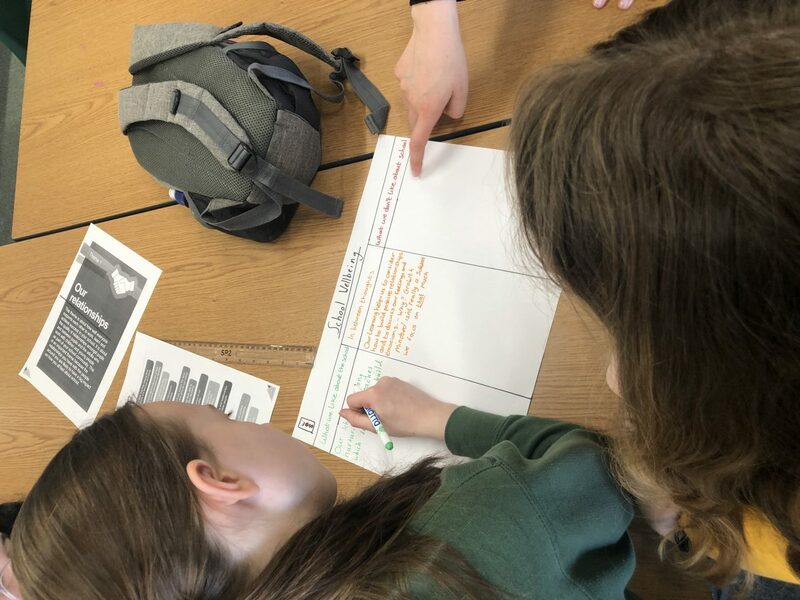 Max – we started to look at the timeline of events that led to the sinking of the Titanic. Mirin – we typed our learners statements and shared them on Teams for our parents to see. Sam – we reviewed our guided reading books. 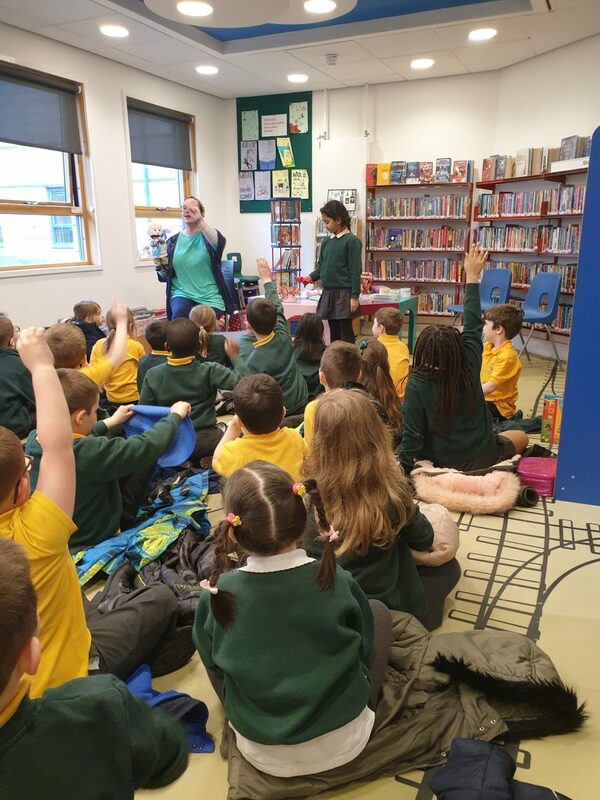 Phoebe – we went to the library and read to the nursery children. Marwa – we completed our entries for the engineering competition. Good luck everyone! 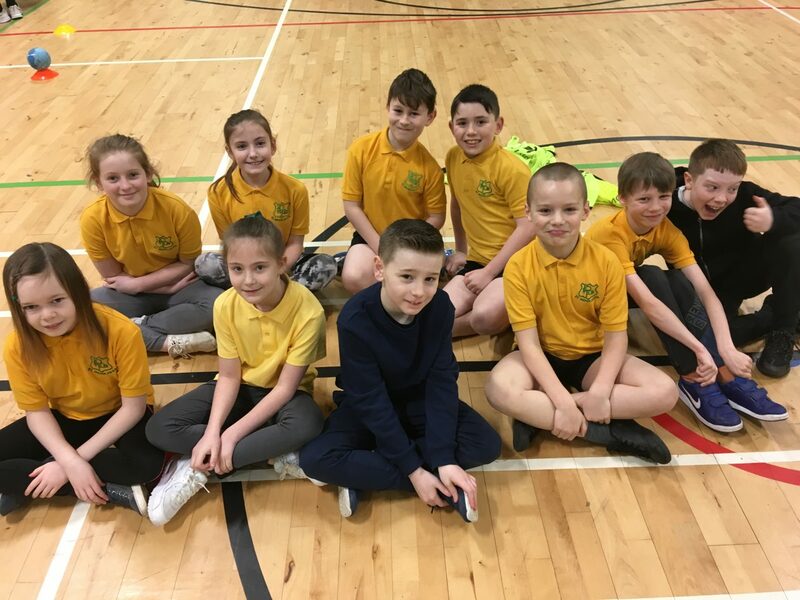 Paula – we went to Broxburn Academy to play Handball. 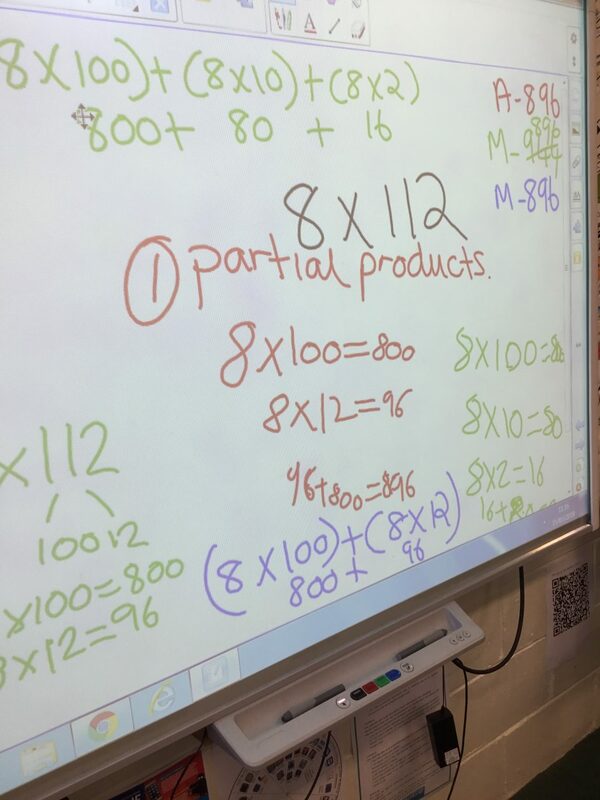 Leo – we were learning how to use the halving and doubling strategy in number talks. We have been very these last two weeks! In literacy we have continued to brush up on our grammar skills. We have become very competent at identifying adverbs, verbs, nouns, adjectives and homophones. We also had fun with alliteration. In reading we have been making good progress with our chapter books. Some of us are reading a book that has been written by Chris Hoy, ‘Flying Fergus’. Chris Hoy is actually one of the famous Scots that we have learnt about , however, we did not know that he had written a book ! We have also read lots of texts and completed reading comprehensions which have focussed on inference which some of us have found challenging, however, we know that these will become easier the more we practise. In numeracy, we have moved on from fractions and are now learning how to tell the time using all of the numbers on the clock. We have used lots of interactive games to help us with this. Our favourite one is called, ‘Beat the Clock’. You have to read the time sentence and press the buzzer to stop the big hand and make sure that it is in the correct place. It is great fun ! Our topic, ‘Famous Scots’ has almost come to an end which is a shame because we have really enjoyed it. We are in the middle of making a HUGE poster which will showcase our learning. We will post pictures as soon as we have finished them. Wednesday was very exciting because Archbishop Cushley visited us. He gave us a special blessing and spoke to us about our First Communion. It was lovely to meet him. As part of our learning, we have also studied the life of Saint Margaret. She was a special queen and led by example. 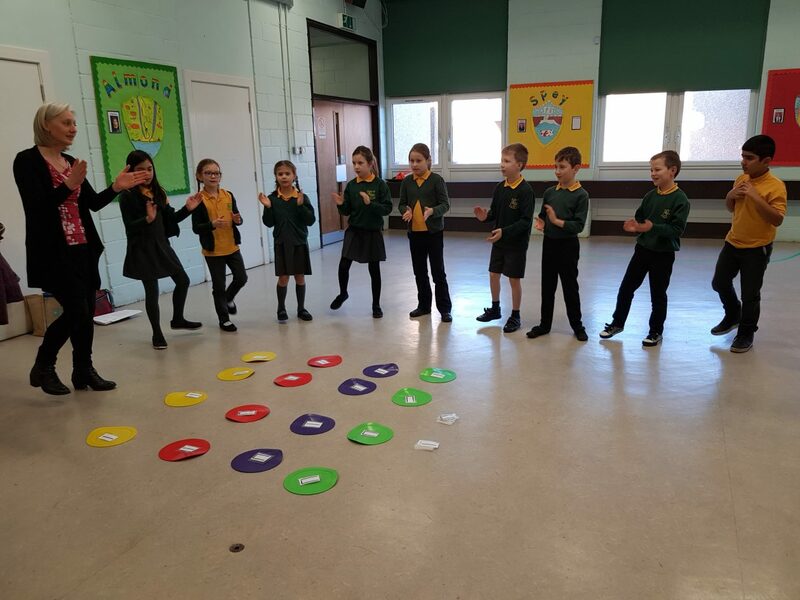 The last few Fridays have also been fun as Mrs Curle from NYCOS has been in to teach us about rhythms and beats in music. We have learnt some great songs including: ‘I Like Coffee’ ‘Starlight’ and ‘Lemonade’ and now know one beat in music is called ‘TA’ and two beats are called ‘TE TE’. What have we enjoyed the most ? ‘I have enjoyed learning about what all the numbers mean on a clock’ – Freyja. ‘I have liked doing my times tables in maths this week’ – Holly. ‘I have enjoyed making my poster because it has been really interesting researching people’. – Cameron. 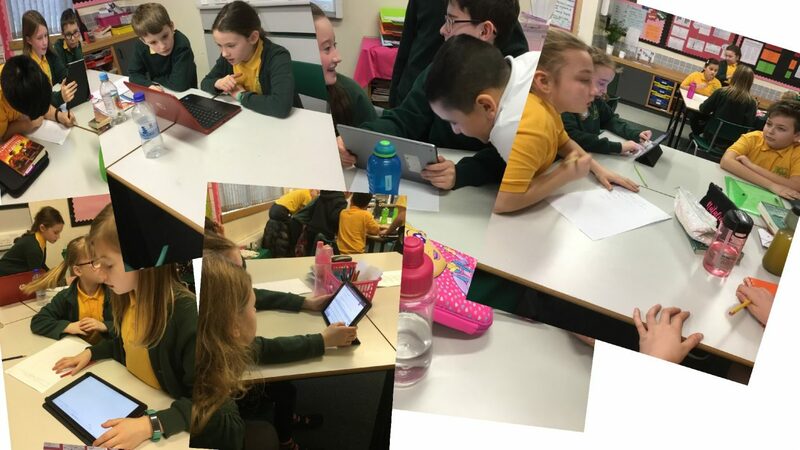 ‘I have enjoyed learning using the computers’ – Lucas L.
Primary 7 have had a very busy week. We have been working on data handling this week. We enjoyed collecting data and deciding what graph or chart to present our findings. We also worked on reading and interpreting data. In true valentines spirit we analysed and wrote our own love poems. 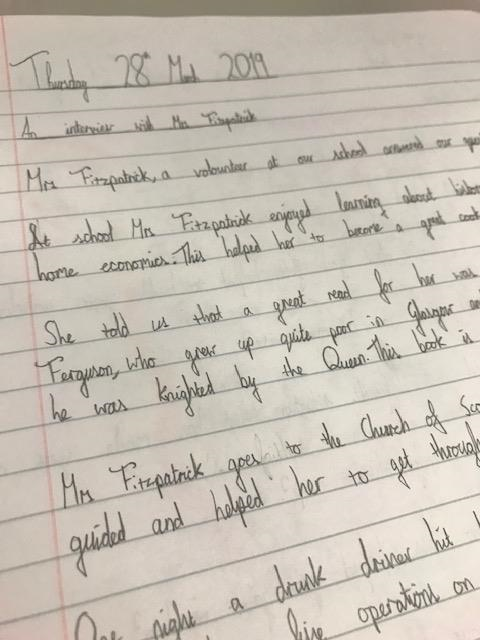 They were very creative and we used techniques like similes, metaphors and personification to enhance our writing. This week we’ve been learning about evacuation. 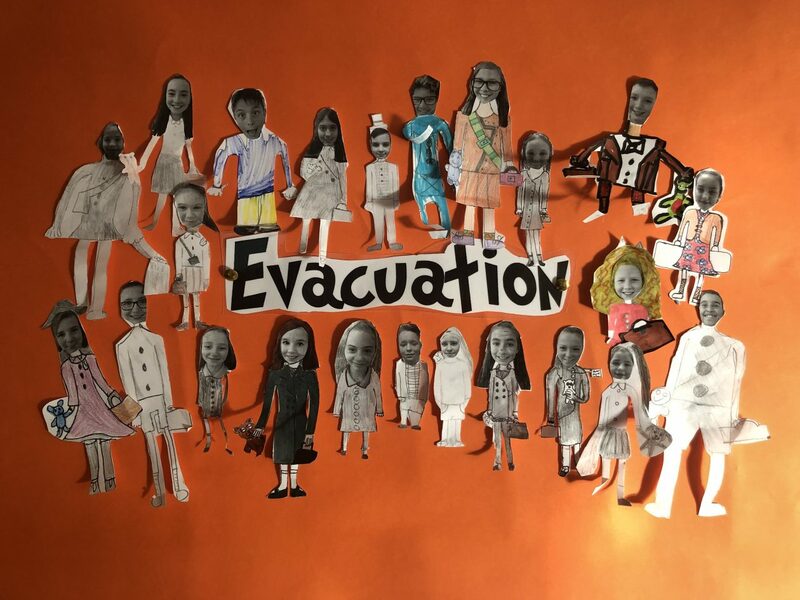 We wrote an information text about evacuation and designed ourselves as evacuees which was lots of fun! This week we had a visit from Andy Weir who has been teaching us about presentation skills. He left us with a ‘wee gift- WIIGFT’ which taught us when giving a presentation always include what is in it for them to engage the audience. We’ve also been working on evaluating How Good is Our School (HGIOURS). We self assessed how good our school is at relationships and identified what we could do to improve. Rebecca- I liked learning about tally marks! We made a tally chart of P2’s favourite pets. We also started to use tally marks to record our group points. We are enjoying our ‘information handling’ maths focus. Daniel- We learnt a new skill in literacy. It’s called note taking! A note is writing something short, we used bullet points. You don’t write a big long sentence. Jacob- We were learning the sound ‘ph‘. Like elephants, dolphin, phone, phonics and alphabet. This is a quiet, lip sound. Sophie- We starting singing songs to get ready for our assembly. Our assembly is on the 1st of March at 11.15am. All P2 parents are very welcome! Sadie- Mrs Thompson, our dinner lady, came in to talk to us about what children ate for school dinners before we were born. She has been cooking school dinners for 27 years! Sara- My dad came in. He spoke to us about when he was little and what it was like in school for him! Joshua- He liked the team Hearts when he was a boy. Lena- In Mr Sanderson’s school, f you were very healthy and always took the green tray, you got to win a prize! Like going bowling. 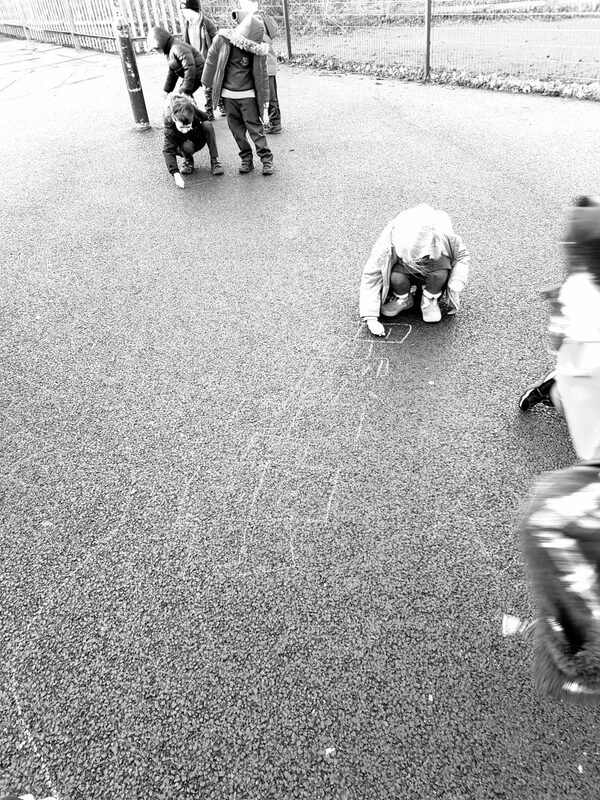 P1 were very excited to find that some dinosaurs had visited our playground and left some footprints. We have been learning about estimation and we decided to estimate how big the dinosaur footprints were. We estimated how many P1s we could fit inside some of the footprints, how many cubes long the footprints were and how many steps it would take to get from one side of the footprint to the other. We then checked to see how close our estimations were. This week we have been incredibly busy preparing for our class assembly which is all about friendship and forgiveness. Our assembly will be tomorrow (Friday 15th February) at 11.15am and families are welcome to come and see it. As it is Valentine’s Day we learned a little bit about the history behind it. In Spelling we have been focusing on the pattern ‘ou’ and we can read it and use it in our writing. 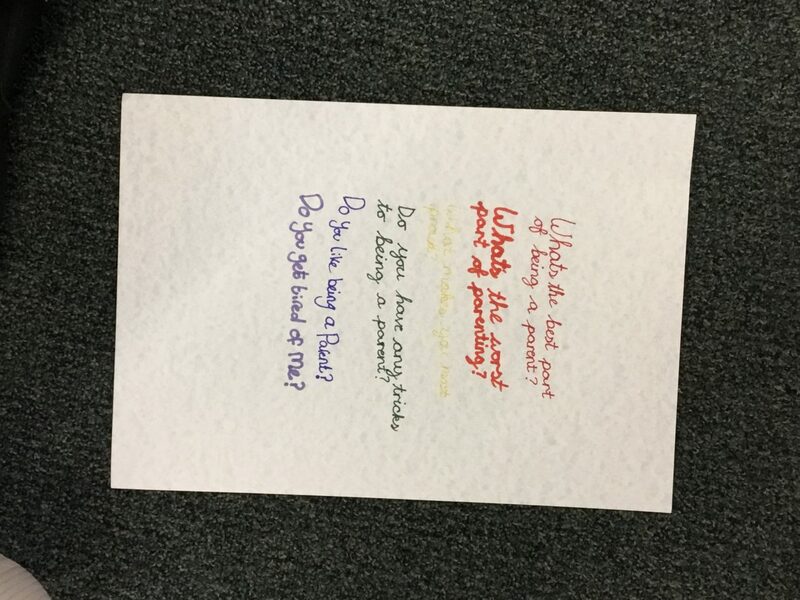 In Literacy we have been continuing to learn about poetry and we worked in groups to write our own rhyming verse to continue the poem ‘Going through the old photos’. We used some of our own names but we discovered that not all of our names have words that rhyme with them. In ICT we used Forms on the ipad and netbooks to make our own quizzes on something we knew lots about. In PE we are continuing with gymnastics and we have been doing different stretches and counter-balancing. This means that we had to put trust in our partner and work as a team. We look forward to seeing you at our assembly! 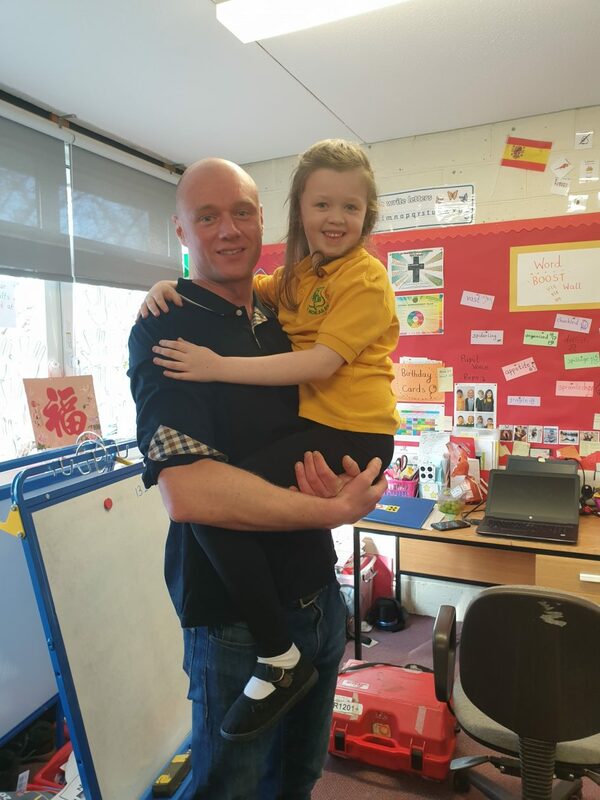 Today P6 had a visit from Mr Sanderson,a P2 parent. 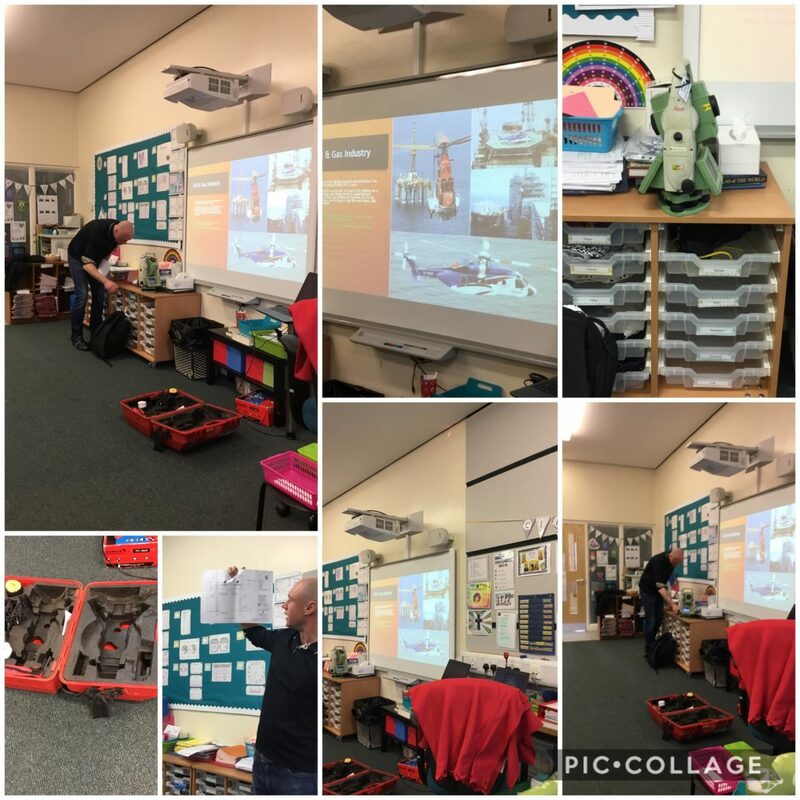 P6 had lots of fun learning about oil rigs and what you need to do to be a surveyor. 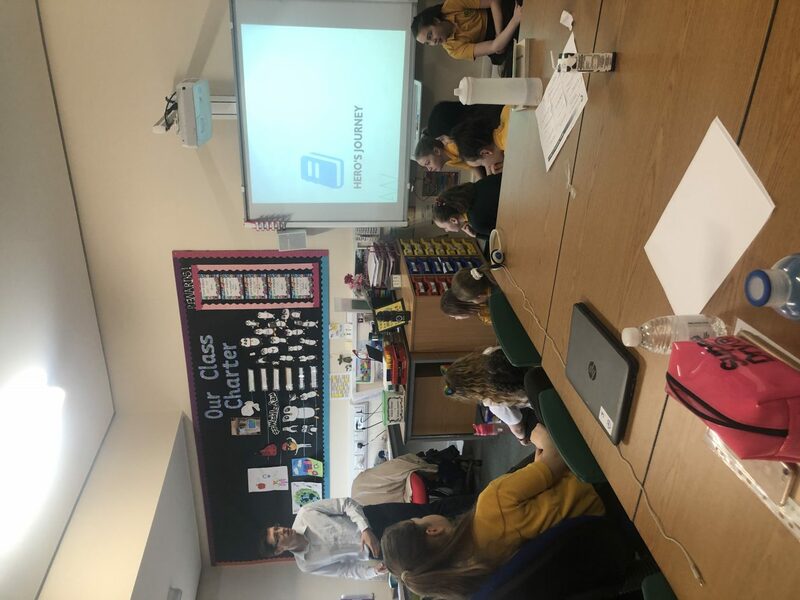 Mr Sanderson explained that there is a crisis for jobs in this area and encouraged us to think about a career in this field, especially the girls. You only have to work for two weeks and then you get four weeks off. You get the same wage as a footballer and the food on the oil rig is amazing and it is like a hotel with a football pitch,gym, swimming pool and a squash court. The downside is that you miss your family. You don’t need to go to university as you learn on the job but you need to be good at maths. 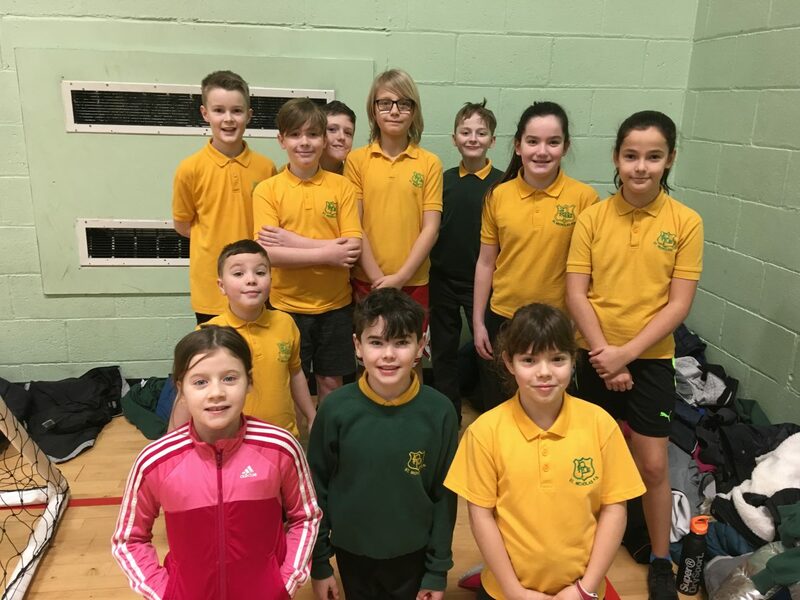 P5a and P5b had a great time this morning at the Handball Festival at Broxburn Academy! We were in 5 teams and played 5-a-side matches against 5 other schools. We have been practising handball over the last few weeks in PE and played fairly with some excellent tactical moves! Thanks to the parent helpers who walked us along too! Busy week in primary 2! 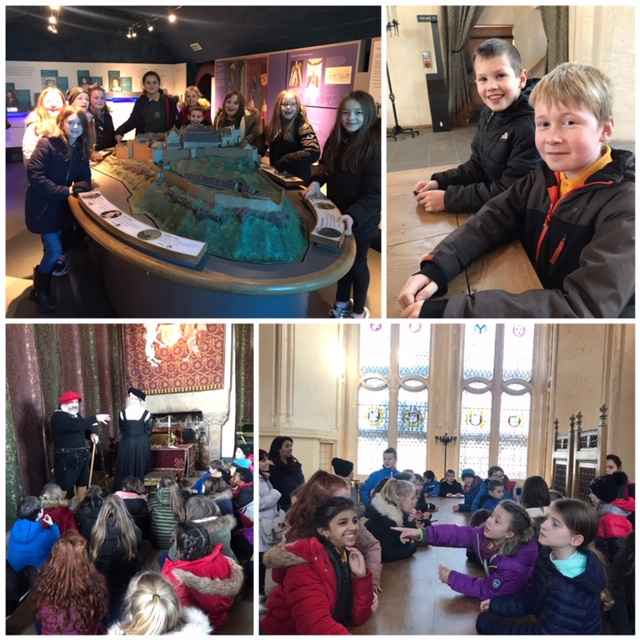 Primary 6 went on an AMAZING trip to Bannockburn and Stirling Castle yesterday. 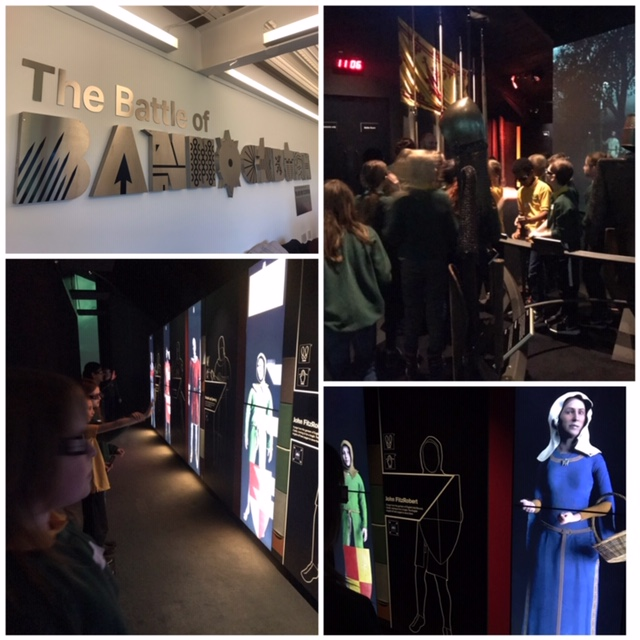 At Bannockburn there was a lot of really cool things to do : you could explore the battle by looking at the 3D giant screens, we could touch the weapons and armour, and we could interact with digital people who were part of the battle. The Chiltern spears were 12 -15 feet tall. The chain mail was really heavy. We then went into the battle room where we split into the Scottish army and the English army. We then plotted the battle on an interactive map. On this occasion, England won the battle through the use of our strategic commanders. It was named the Battle of the Bowling Club, as that is the building on that piece of land now. The map could change from present day to the landscape of 1314. 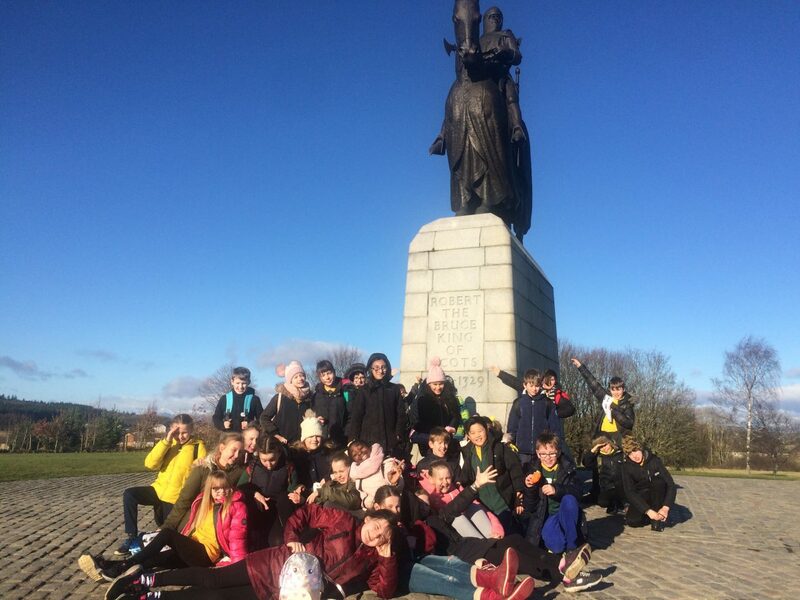 We also took a walk to the Rotunda and saw the famous statue of Robert the Bruce. A short journey away and we arrived at Stirling Castle where we spotted another statue of Robert the Bruce and we could see the Wallace Monument in the distance. We were amazed at how narrow the River Forth is at Stirling. 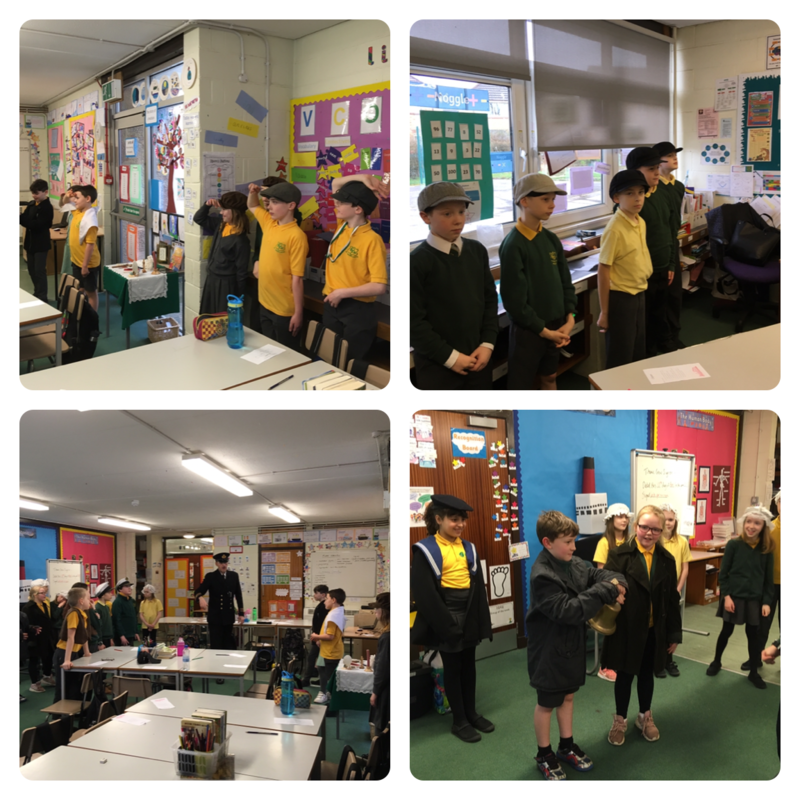 We explored a room with a Scottish history timeline and recognised many events from our studies. We then explored the chapel where Mary, Queen of Scots had her coronation as a baby. Next stop was to the Great Hall where we sat on thrones which also incorporated a potty !! We then popped into the Palace and admired the famous Stirling Heads before spending time in the Queen’s Bed Chamber. The Palace staff told us about the history of the Castle and were really funny. 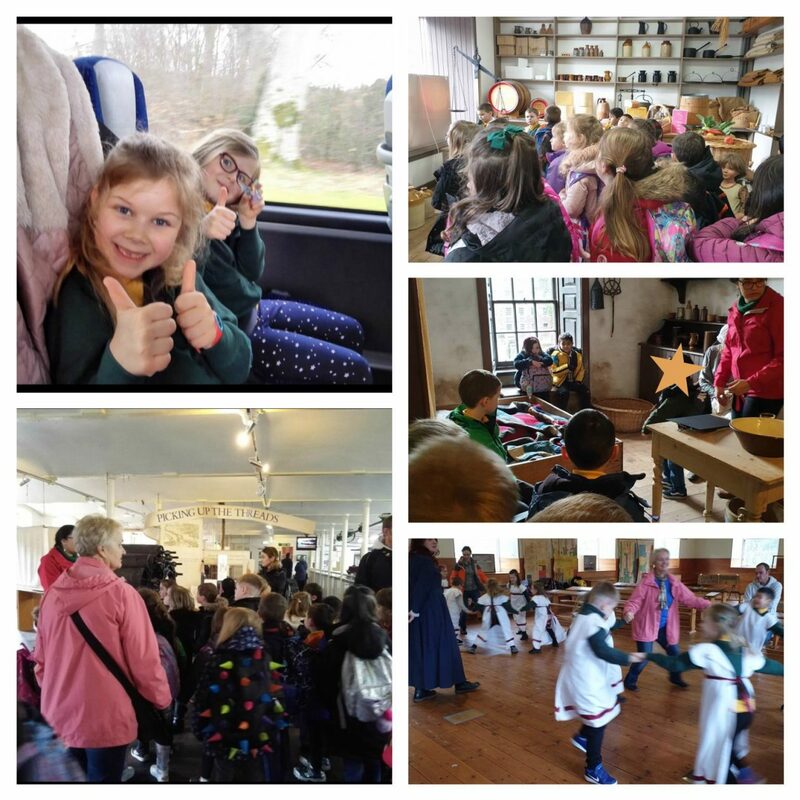 We enjoyed this trip and would highly recommend it to other primary schools. 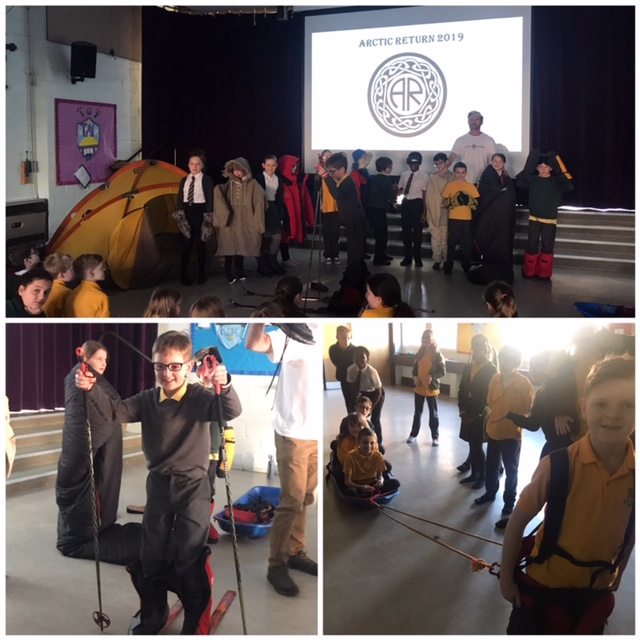 Mr Smith came into school to tell us all about an Arctic adventure that he is going on in March. He showed us all the equipment he will be using and even let us taste some of the dehydrated food that he will be eating on his expedition. He explained that he has been training for the expedition by pulling tyres to build up his strength. He will be taking the same route as a historic Arctic explorer called John Rae, who was also Scottish. He allowed us to try out his clothing and equipment for the trip. His clothing will prevent him from getting frostbite as the temperatures will be minus 30 to minus 50 degrees ! There is also a risk from hungry Polar Bears so Mr Smith will use an electric fence to keep his tent safe at night. 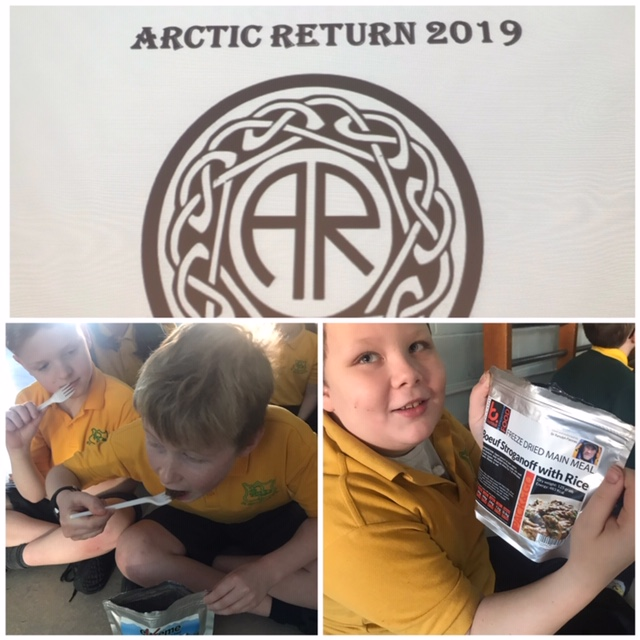 We learned LOTS of interesting facts and look forward to seeing his route progress online and he will try to contact us via satellite whilst on his expedition. Primary 6 will design a St Nicholas flag that he will leave in the Arctic Circle. 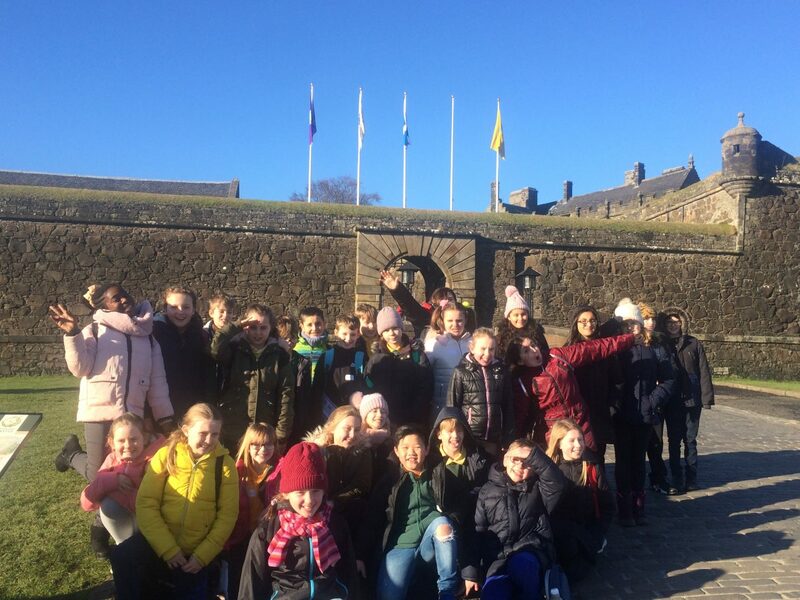 P6 went on a trip to Stirling castle and Bannockburn. We had so much fun! 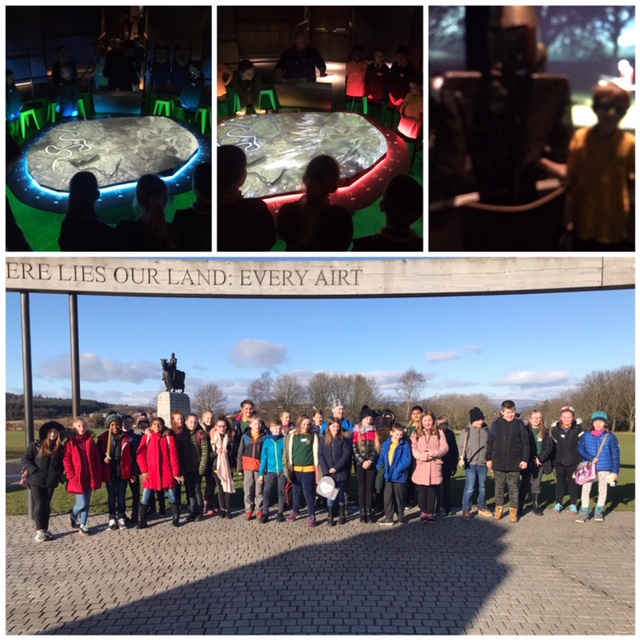 We learnt about the Bannockburn war and what weapons they used. We saw the Rotunda and the statue of Robert the Bruce. We learnt that if a King was camping at war he would have a flag on top of his tent so that the warriors know where he is. Amazing! 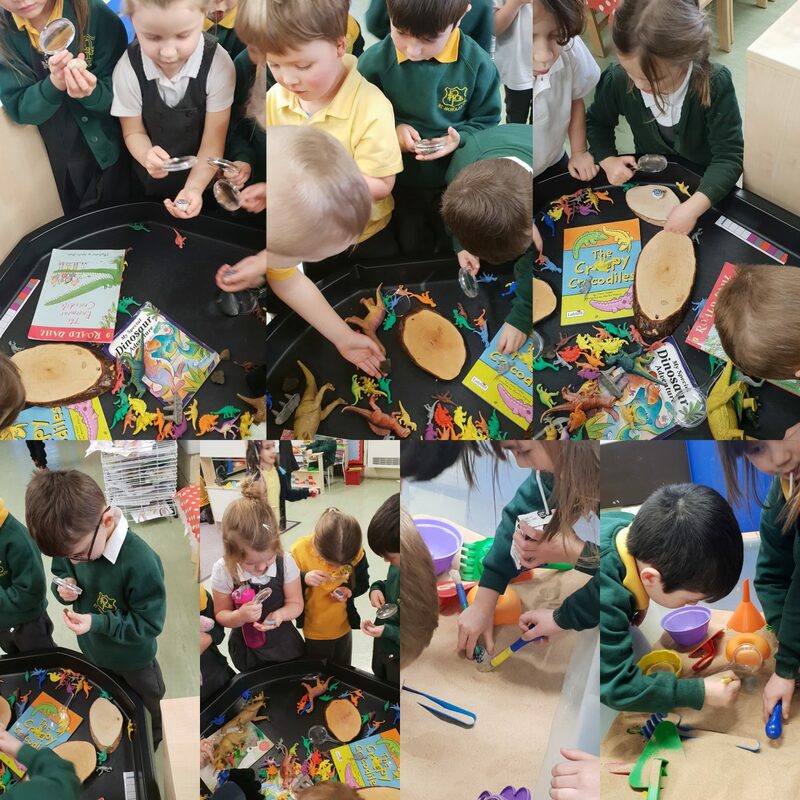 Primary 1 have been very busy over the past couple of weeks. We received a very exciting letter from Pat who is a Paleontologist. He asked us for his help as he had heard that we had been asking lots of questions about dinosaurs. He informed us that there were 14 fossils hidden in St Nicholas and asked if we would be able to find them! 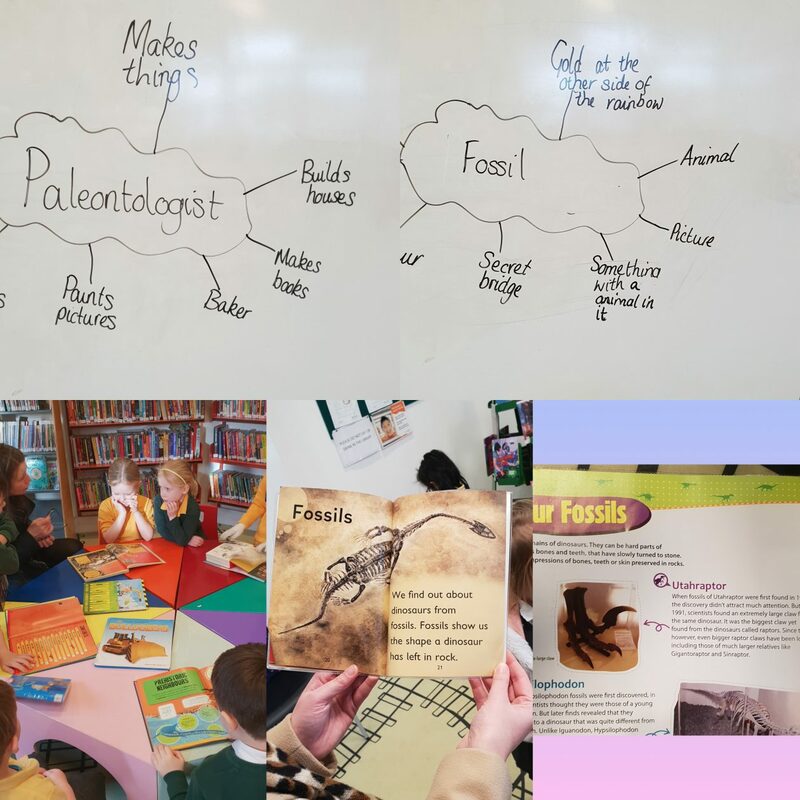 We were unsure of what a fossil or a paleontologist were so we brainstormed some ideas and made a mind map on the board. We decided to go to the library to get some non-fiction books to help us find out. At the library we looked through books and learned how an index can help us to find information on a certain subject. We also found out how to use kiddle and found out some great information from both the books and the internet. 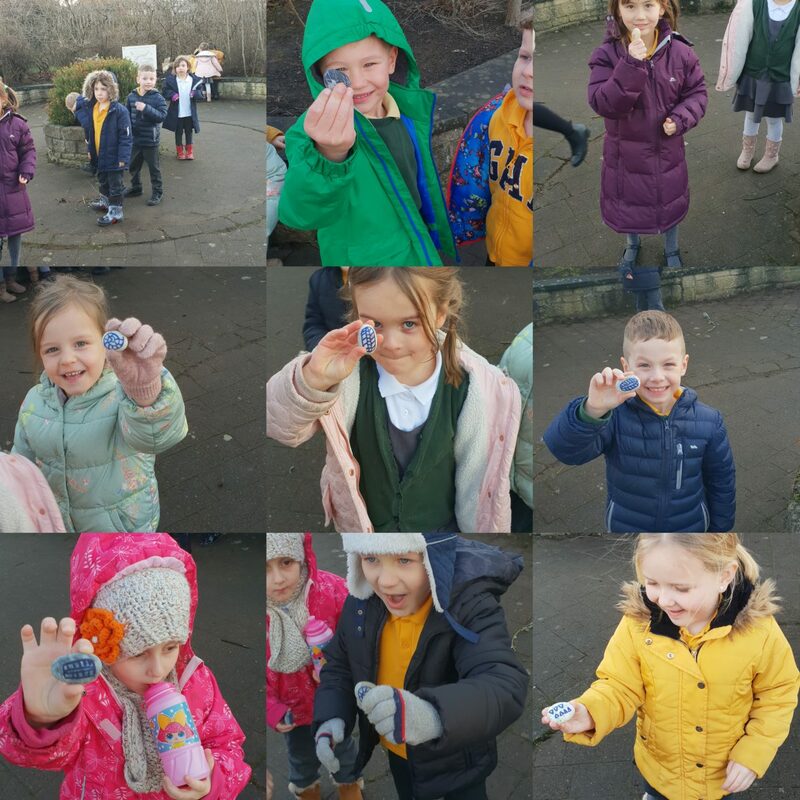 After we knew exactly what fossils were, we headed off outside to find the fossils and we managed to find all 14! We watched a video which explained what tools were needed to examine a fossil. Some of us noticed that the paleontologists were using brushes and decided to use paint brushes to dust our fossils. Pat then sent us another letter asking for our help as he to know about habitats. We researched what a habitat was and then looked at the differences between our habitats and the dinosaur’s habitats. We then drew pictures of our habitats and created paintings of the dinosaur’s habitats. 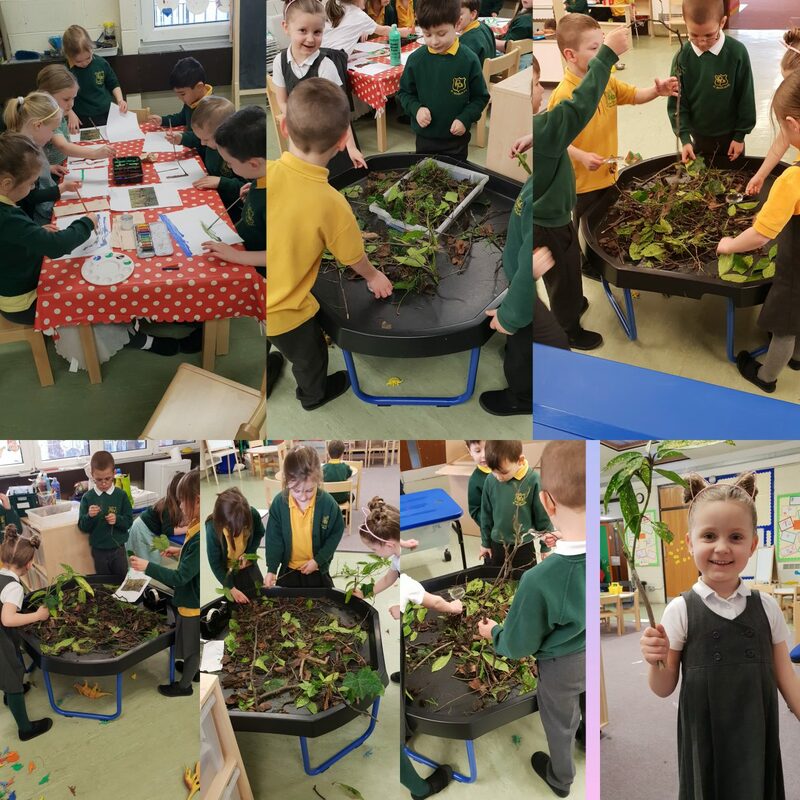 Some of us thought it would be a nice idea to make a nice habitat for the dinosaurs in the area so we headed outside to collect lots of leaves, sticks and grass for their habitats. We then built them a lovely habitat which we are sure they love! We are loving our new topic and can’t wait to see what happens next. Today Primary 5 worked with Primary 2 to think about what makes them happy. They look at mindfulness and the importance of it and why we should not worry about the past or future. 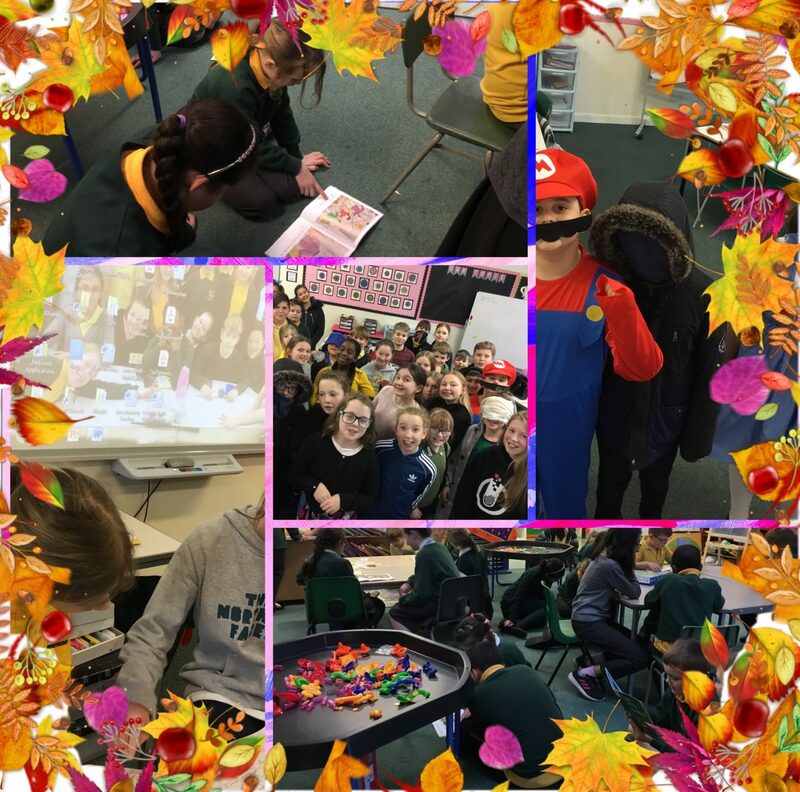 We have had a busy week in Primary 5. Here are some of the things we have been learning this week. Leo – We have been learning about storytelling as this is NAtional Storytelling Week and we watched David Walliams talking about his novels. 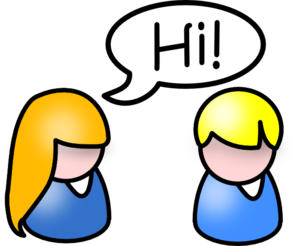 Ellie – We have been learning about the 7 times table and practicing our other times tables. 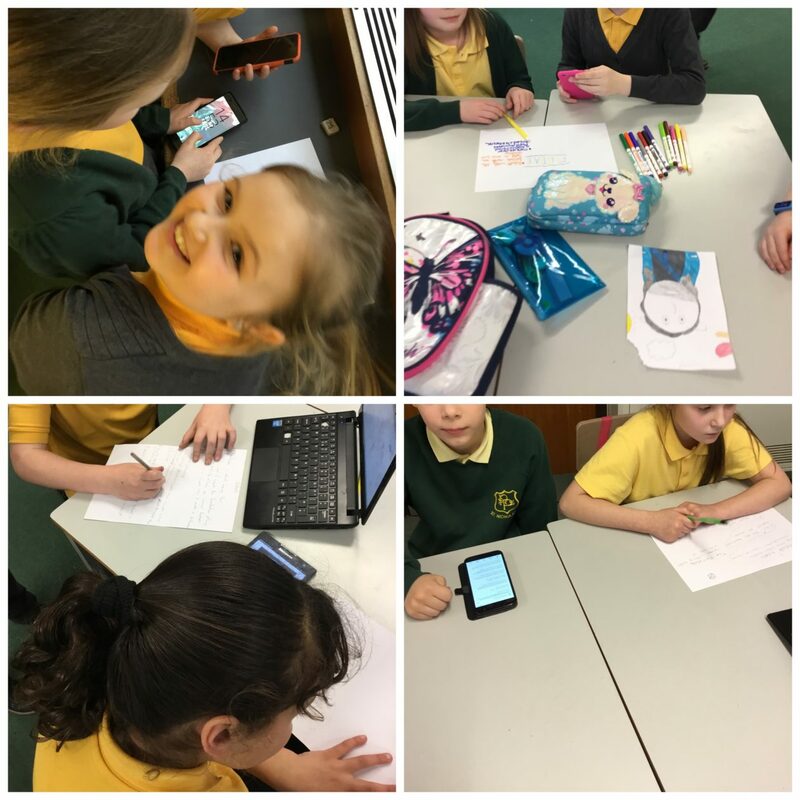 Cerys – We have drawing entries for the art competition and also designing inventions to make life easier for the engineering competition. Paula – We have been learning about the brain. Your brain connects to your nerves and tells you what to do. 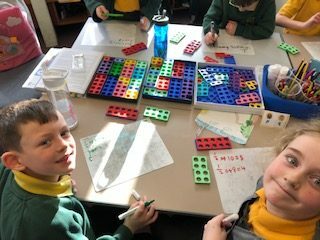 Ciaran – We have been practicing our tables and looking at different strategies for learning the facts we find tricky. 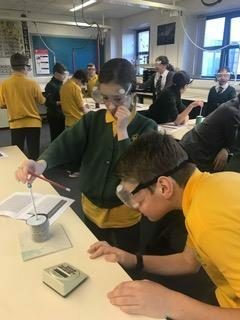 Mirin – We have photographed our latest and best pieces of Numeracy and Literary and tried to use teams to post them. Poppy and Leo- We have been talking about our reflexes and we were holding each others’ shoulder to see how quick our hand reacted and squeezed the other person’s shoulder. We also tried this with hands so see if it was quicker than our shoulders. Shoulder reflexes were quicker as the shoulder is closer to our brain. 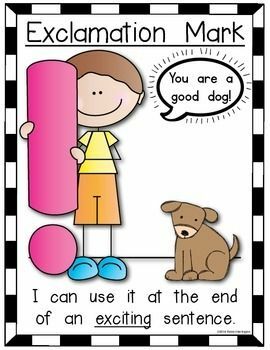 Erin – We worked on our estimation skills with Mrs Heather. We learned that our guesses have to be reasonable. Alexander – We have been thinking about our learning and completed our learners statements. 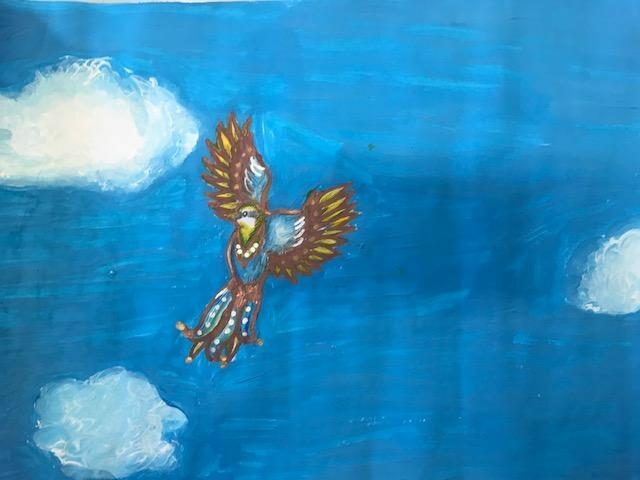 Leo – We were having learners conversations and talking about what we are good at and what we need to work on. 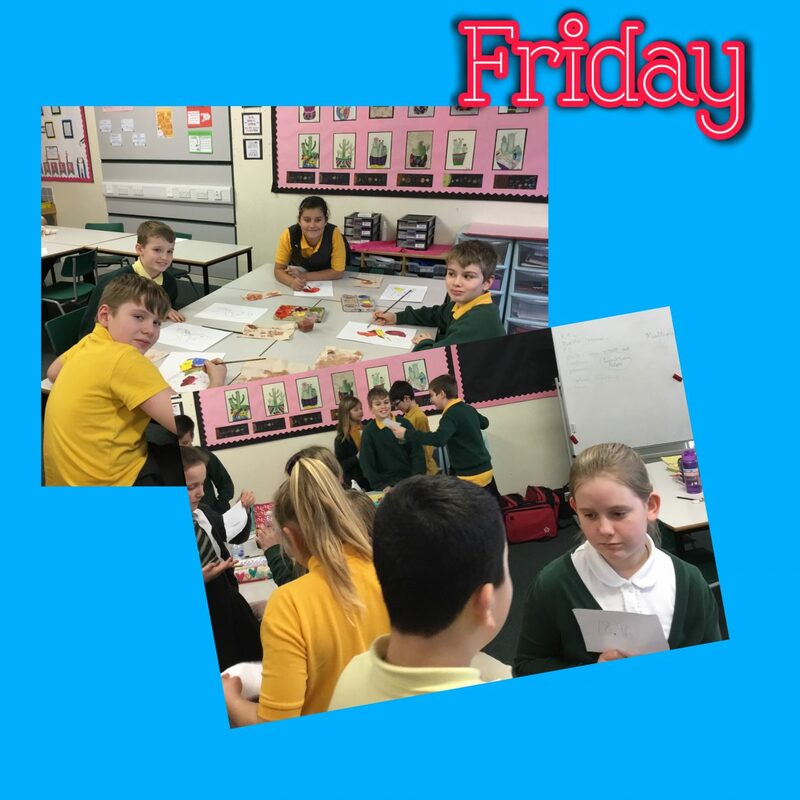 Ciaran – we have been completing our health and well-being check in and today is feel good Friday. Phoebe – Mr Menzies came into school to read us a story for storytelling week. We enjoyed learning about our new topic Scottish independence wars and making a shield for Robert Bruce.We also enjoyed writing a poem about ourselves using similes and metaphors.In maths this week we leaned about percentages and on Thursday Mrs Heather came in and did subitising. Another busy week in P3! This week we have started to prepare for our class assembly which will be about Friendship and Forgiveness. This ties in with our Reconciliation preparation. We have been working hard learning our lines, a song, a prayer and even a rap! We can’t wait to perform for you all on Friday 15th February. In Literacy this week, we wrote acrostic poems all about friendship. These poems didn’t need to rhyme but we had to make sure that each sentence told us something about friendship. Also, as this week is National Storytelling Week, we had a visit from Mr Menzies who came in to share tales and stories with us. He was really expressive and funny! In Numeracy, we have been continuing to learn the 5 and 10 times tables and some of us are getting quicker at recalling these facts without using our fingers. We are all going to keep practising. In PE, we are continuing to develop our gymnastic skills and have been practising doing different types of rolls. In Digital Learning we were learning how to edit a photo and upload it to our class Teams page. We have also been using a search engine to find the meaning of different scientific words to finish off our topic of freezing and melting. We look forward to our visit to the library this afternoon and the busy week that lies ahead! We have had another great week. 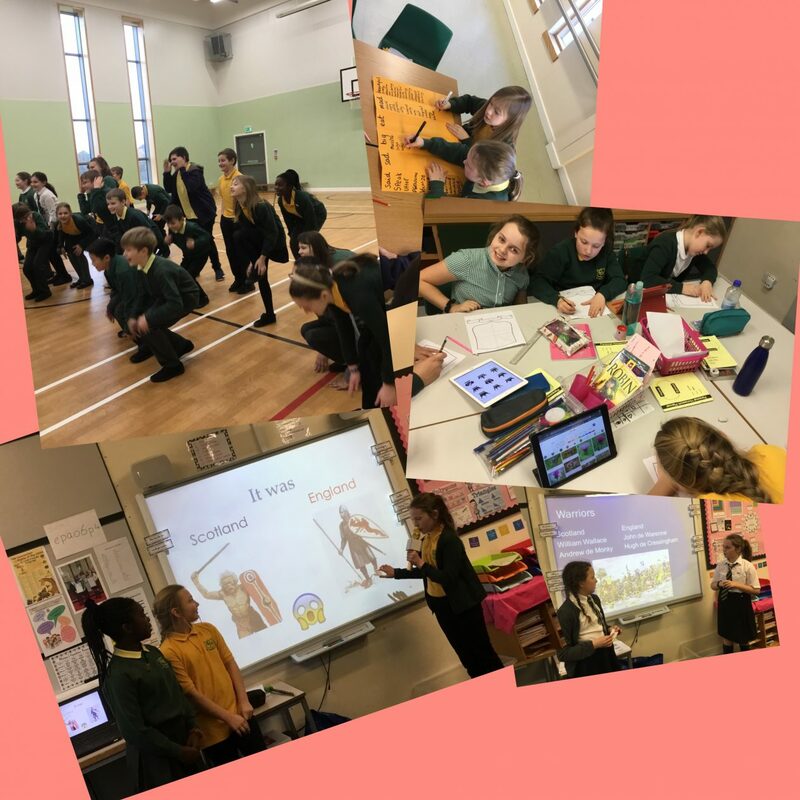 Some of our highlights include, working with fractions, learning the ed ending for our spelling and sharing our presentations on ‘Famous Scots’. 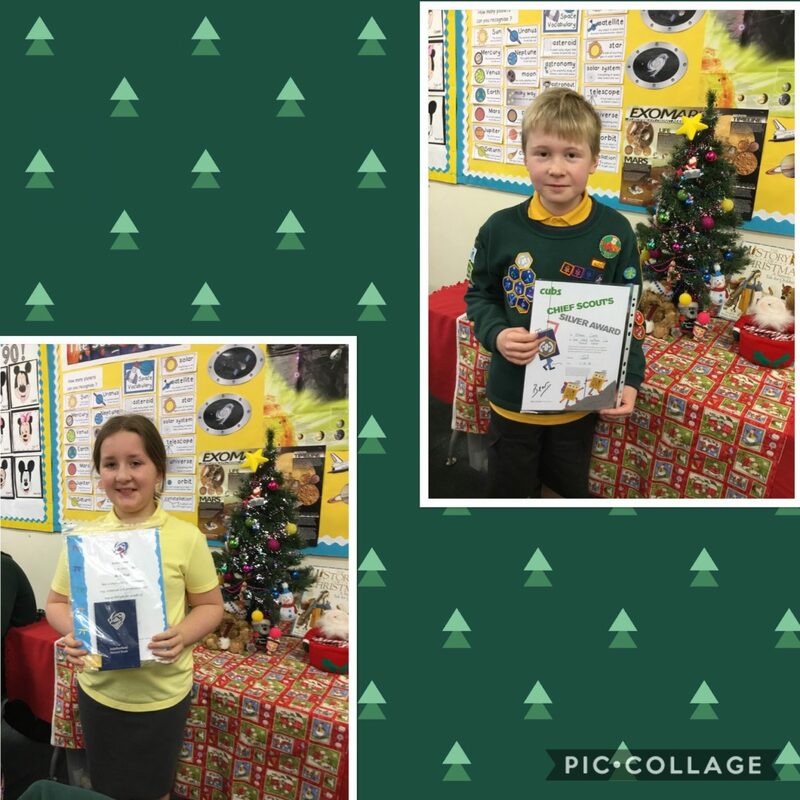 Our presentations included some very famous Scots l about James Watt, John Logie Baird, Mary Queen of Scots, Charles Rennie Mackintosh Muriel Johnston, Rob Roy, Rabbie Burns, Andy Murray, Gordon Ramsay, Steven Naismith, Scott Brown and Alexander Graham Bell. We are all feeling very proud of ourselves as our presentations were really good and lots of technology was used to help us to make them. Gerard used Sway, Freyja used Glow and lots of us made a powerpoint. We also got some irn bru and shortbread to celebrate Robert Burns Day. It has been a really enjoyable week. We have had another busy week in P4a. In Maths we have been doing fractions – halves, quarters and tenths. We learned more about what ‘numerator’ and ‘denominator’ mean. In Literacy we were doing presentations about famous Scottish people. Miss Doolan says she is very impressed by all of our presenting skills! 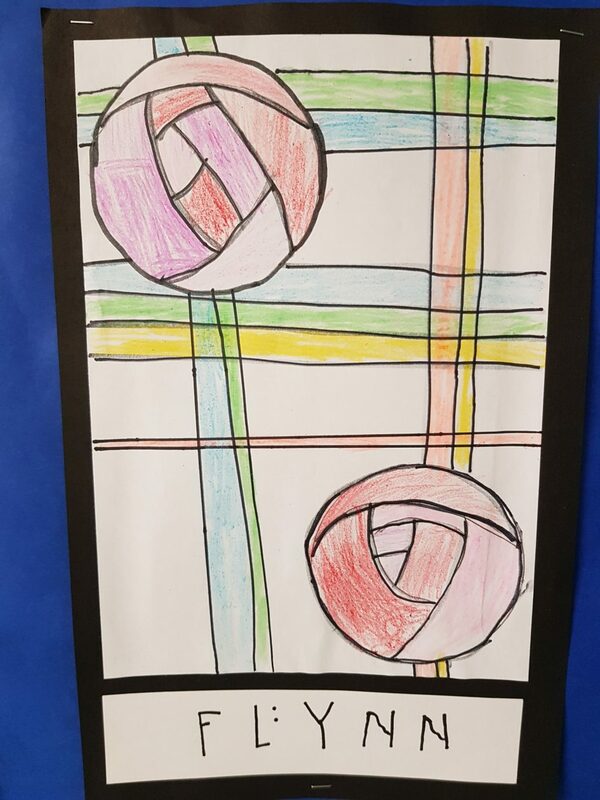 Our topic work in class this week included learning about Charles Rennie Mackintosh. We then drew our own ‘Mackintosh Roses’. In gym we were doing volleyball and gymnastics with Mr Muldoon. In gymnastics we were doing jumps from benches eg. pencil jumps, tuck jumps and star jumps. Our music lesson was fun. We were learning more about beat and rhythms. 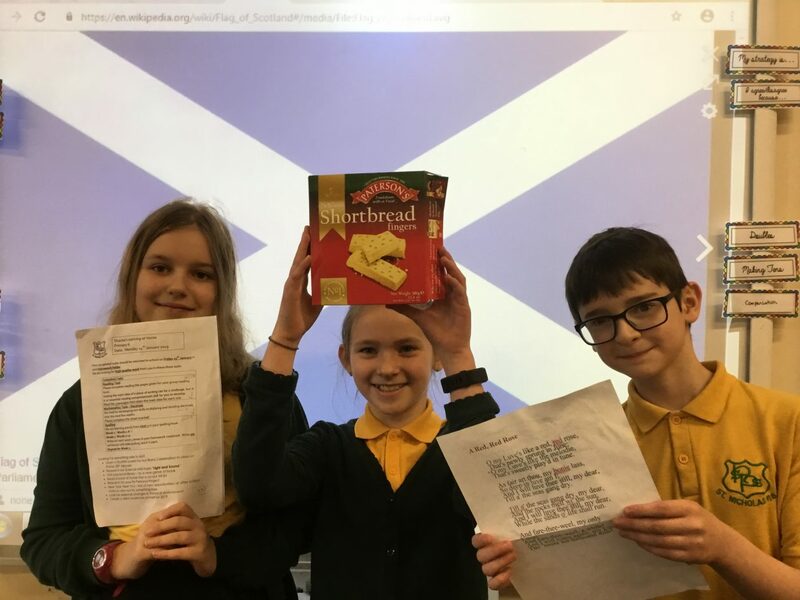 Today P5a and P5b celebrated Burns’ Day by reciting some of his poems and sampling some lovely Scottish fare: Oatcakes (kindly supplied by Mr Quinn) and shortbread. Happy Birthday to the great Bard and wishing everyone a lovely time tonight if they are having a Burns’ Supper. 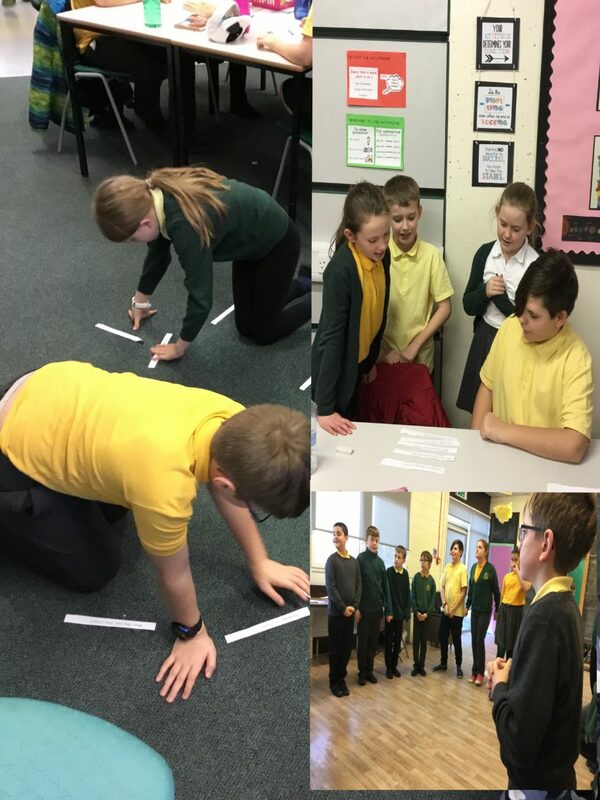 In P6b we have been learning how to divide decimals and we did lots of active games to practise. We have also making posters to encourage everyone to read, using persuasive language. Our writing this week was to write a poem using onomatopoeia. 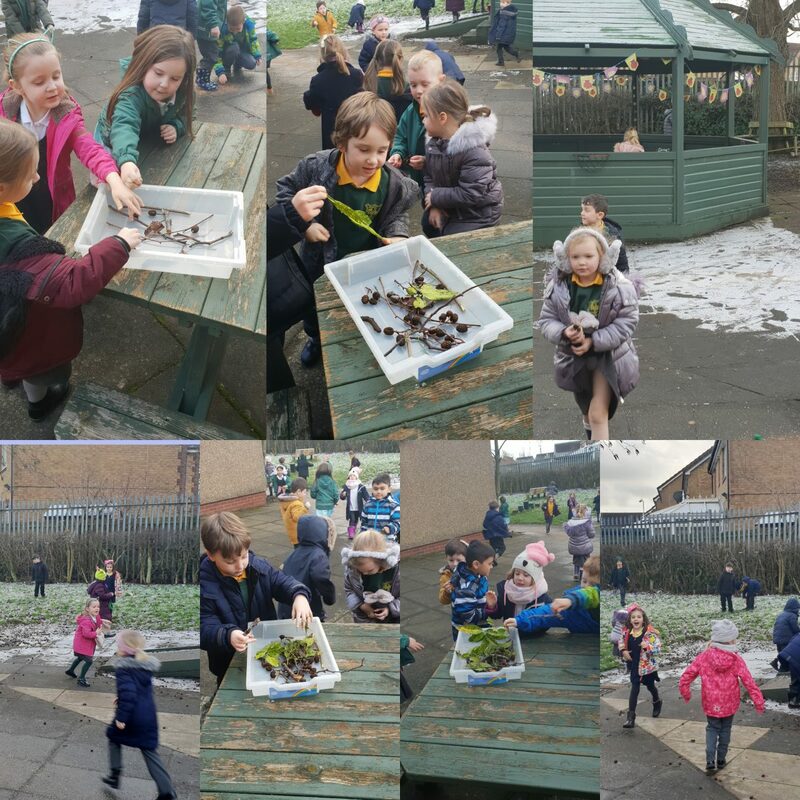 On Thursday we did a bird watch outside and on Friday we did a poetry recital for Burns day. Primary 5B enjoyed a Burns’ celebration today. We had shortbread and oatcakes. Kai’s dad very kindly gave us the oatcakes. Thank you! They were delicious! This week we have researched Robert Burns using our own devices and school i-pads and laptops. We created a profile of Robert Burns. We also learned some Scots words. For homework we also learned a few verses of a Burns’ poem or song and recited them to the class. Well done everyone! Some facts we have learned about Robert Burns. Ellie -He was very famous for his poetry and songs. Mirin – He died because of a heart condition. Szymon – He was born in a farm in Alloway, in Ayrshire. Christy – He was also called Rabbie Burns. Max – He originally spelled his name BURNES. Sam and Leo – He had a wife called Jean Armour. Marwa – He had 9 children. Tomasz – He was born on 25th January 1759. Charlie – His last resting place is in Dumfries. Max – He died 21st July 1796. Sam – He was 37 years old when he died. We have had a busy week learning lots of new things in primary 2. Burns Day Supper in Primary 7! 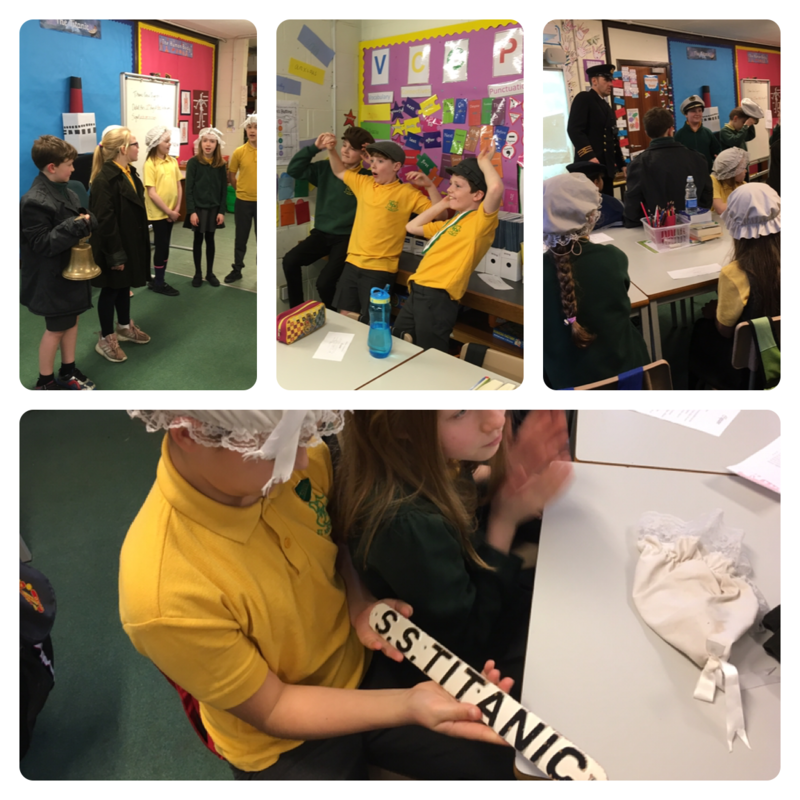 Primary 7 had a lovely Scottish afternoon celebrating Burn’s Day. We had some fantastic poets, some great singing and plenty of eating. The traditional haggis was the most popular compared to vegetarian haggis, scotch bonnet crisps and of course shortbread were amoung a few favourites! 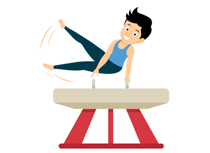 In PE we have been practising gymnastics and have been having competitions where one group is demonstrating different types of jumps and the other group is judging the quality of the jumps. The judges are looking for well stretched bodies and a good balance. In Science, we tested different materials to see if they were soluble or insoluble. 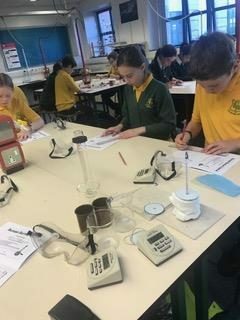 We discovered that gravy granules, coffee and salt were all soluble materials whereas paperclips, paper and blu tac are insoluble. We bet you’re all tired from reading about our busy week and we’ll check in again next week to share more of our learning. After the fantastic achievement of gaining the Gold School Sport Award last year the school have continued to go from strength to strength. Instead of sitting back and relaxing the pupils have hit a record number of attendances at after school clubs. Compared to last year when 29% of pupils attended an after school club in term one this year 49% of pupils attended an after school club. 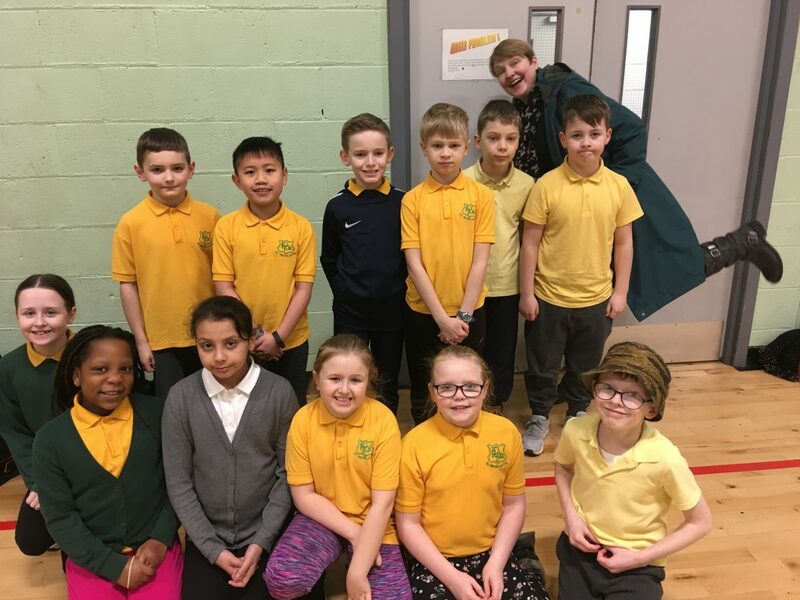 Active Schools have worked closely with Miss Miller to put on a range of after school clubs for all the primary stages. Clubs have included football, dance, hockey and tennis. This term we have spoken to the Health Committee who requested a number of different sports. From these we have a volleyball club starting soon. All after school clubs will be starting the week beginning 4 February, keep an eye on school bags for letters coming out. 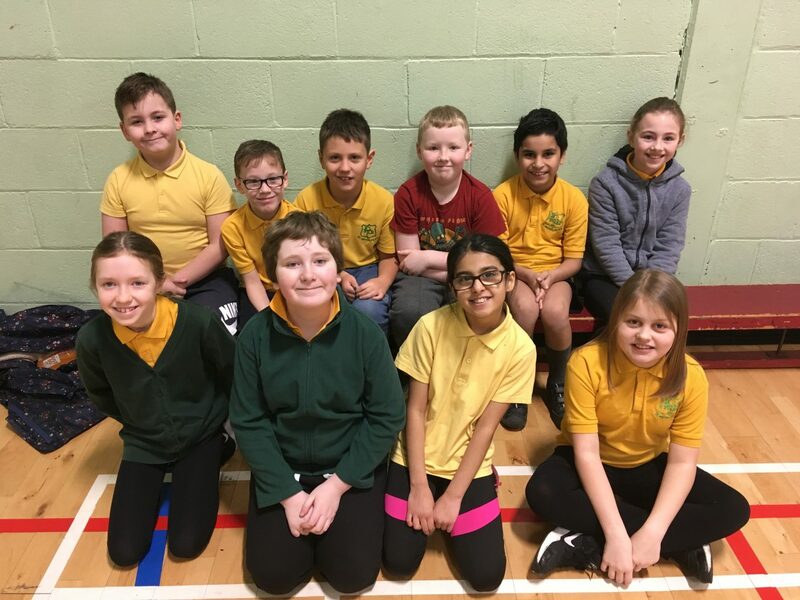 Follow Broxburn Cluster Active Schools on Twitter, @ActiveS_Bburn. 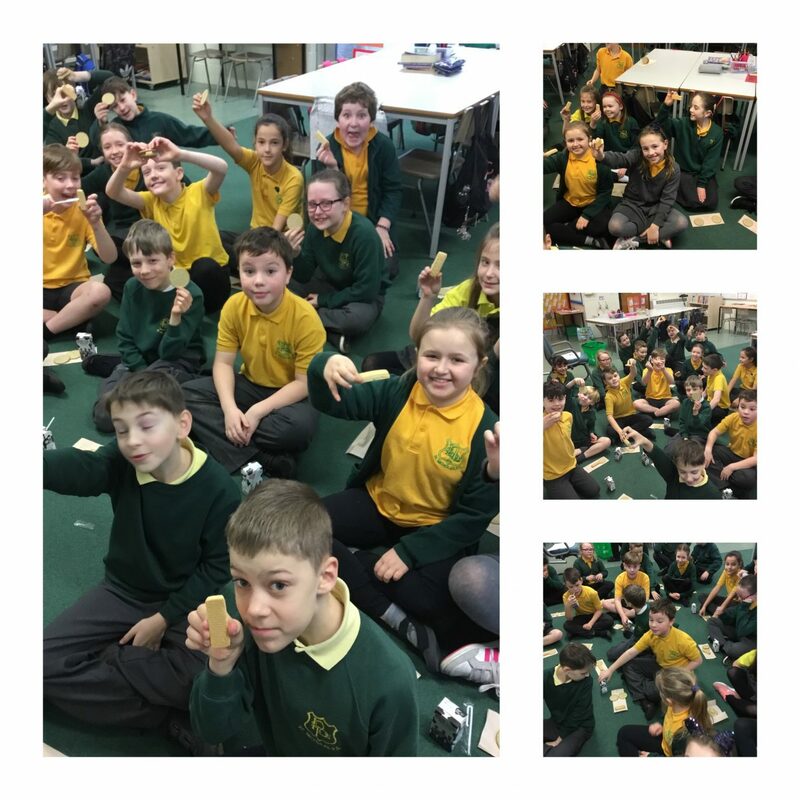 P5 learn about the digestive system! P5 have been learning about body systems. This week we looked at the digestive system and did a messy practical experiment! Our digital leaders made a quick video to display the learning. At our assembly today we spoke about the whole school New Year’s resolution we set last week – to focus on showing kindness and respect to each other – which also features in our School Prayer. At St Nicholas showing kindness and respect is just an everyday part of our culture and ethos, but teachers were able to give examples of children who went ‘over and above’ in this area. And lots of these ‘over and above’ children were recognised by winning ‘Pupil of the Week’. Well done to all our pupils of the week who are pictured below. Have lovely weekend St Nicholas pupils, and keep being kind and respectful. This week we have been busy. In maths we learnt how to do number patterns/sequences and practised division with remainders and without. Our topic is Famous Scots. 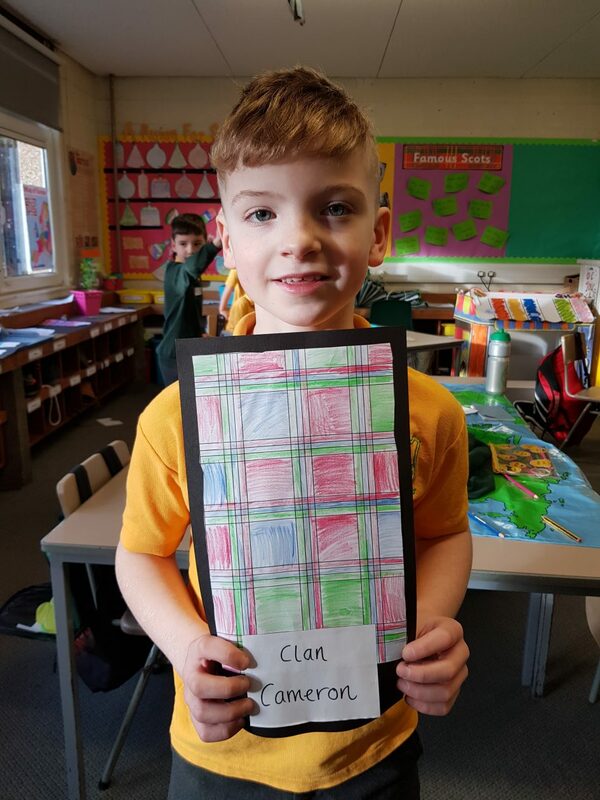 We learned that Scottish clans often have their own tartans so we made our own! In gym we are doing gymnastics so we were doing jumps over a bench this week. For spelling we were revising the qu sound and we remembered that q to have a u beside it. Our tasks included unscrambling qu words and making a wordsearch for someone else to do. On Friday we have music with NYCoS. We did singing games and practiced keeping a steady beat along with rhymes. This week we have been learning how to multiply decimals and played a game to practise it. We also had a great time at our vertical learning groups and at the library. 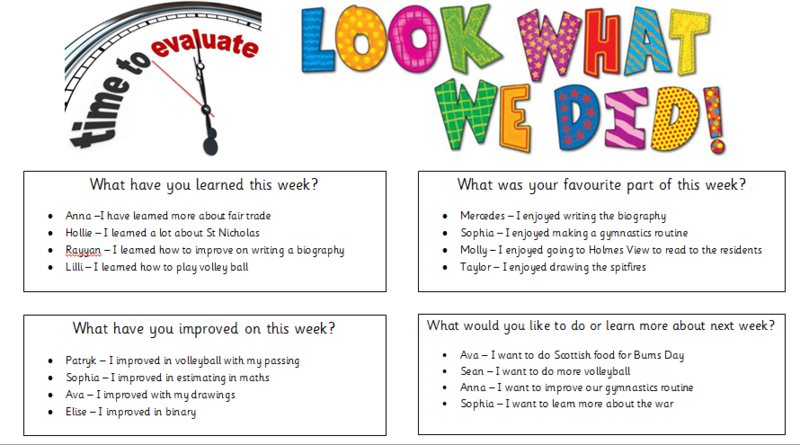 Primary 4b’s Week so far ! We have set a couple of challenges for next week. Firstly we have to “make a powerpoint about a famous Scot” and “learn how to say a Scottish poem”, Lucas C. We are up for the challenge! We will tell you all next week how we get on. In literacy we made a wordsearch with our spelling words all hidden, we have also been working hard on our grammar. 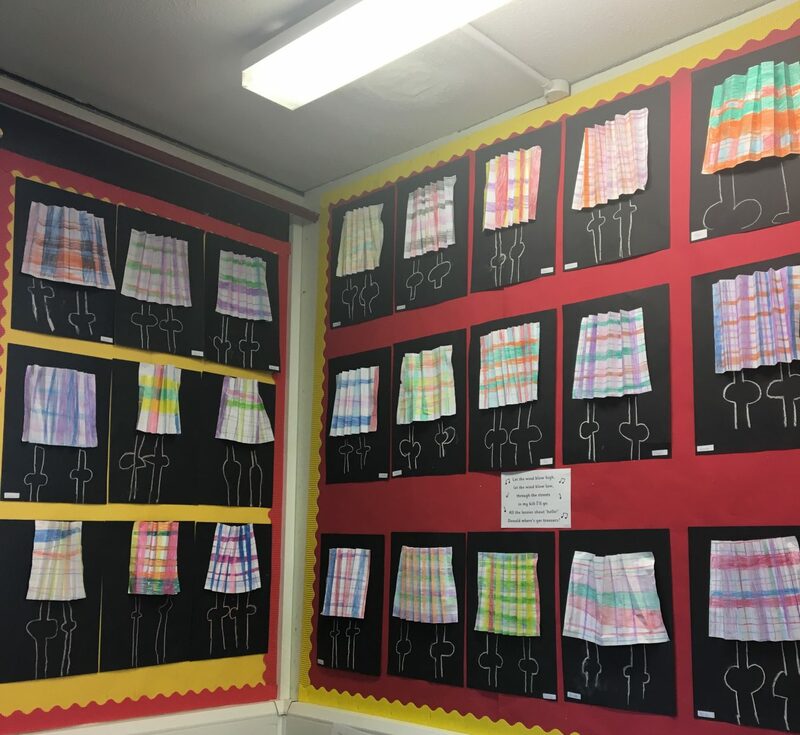 In numeracy we have been learning about fractions, practising our times tables and exploring through tartan. “It has been an amazing week”, Olivia. P2 have a new topic! P2 are very excited to share their new topic with you. We are going to learn about ‘Schools Past and Present’. We worked on our plan together. We are going to learn about what it was like being a pupil in the past compared to being a pupil today. This includes subjects taught, games played, transport to school, school lunches, tools used in school and pupil voice. We are also looking for any parents who would like to come into school and talk to us about what it was like! The children will have lots of questions for you. If you can, please let us know. We had lots of fun this week looking at old photographs of our school and of previous teachers and pupils. This week so far we have been busy bees! 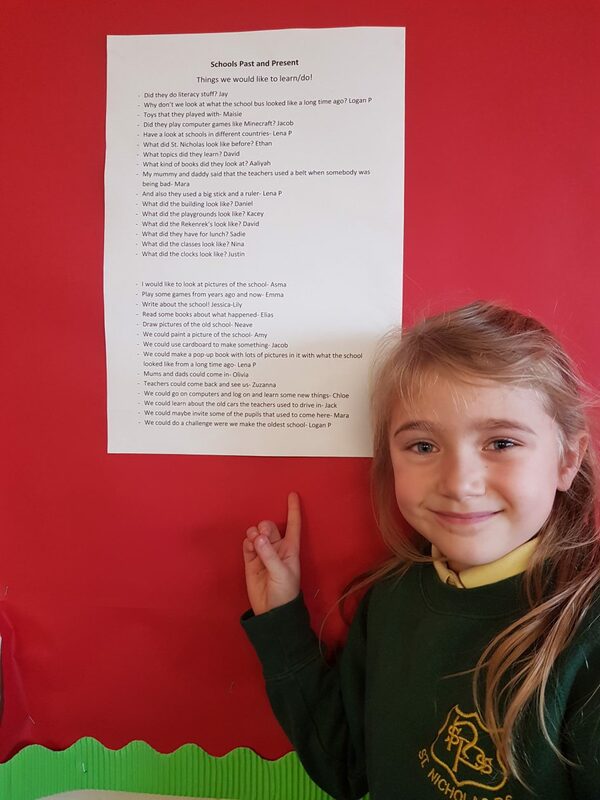 In Literacy, we have started to learn about poetry and we know that not all poems need to rhyme and that they can be split into verses. They also have patterns and can be read to a rhythm. We made up actions for a poem and performed to our class. In Numeracy, we have been looking at number patterns and counting in 5s and 10s from lots of different numbers. We noticed that when you count up in 10s that the ones column number doesn’t change and that when you are using a 100 hundred square you just need to jump down. When you count in 5s there is a pattern for example, 1,6,11,16,21 etc. In Science we have started to learn about Freezing and Melting. We found out that water freezes when the temperature is 0 degrees or below. We also learned that water can be solid, liquid and gas. In RE, we have started to prepare for the Sacrament of Reconciliation. We have been learning about Baptism and talking about our Godparents and where we were Baptised. In PE we have started to do some gymnastics and have been practising different types of jumps like star jumps, stretch jumps and tuck jumps. Can you believe that we have done all of that work so far and it is only Wednesday?! The winners of the St Nicholas Reading and Writing competitions had a lovely lunch with our Head Teacher, Mrs Brown, today. They went on a bus to the other end of Broxburn, had a delicious lunch, and were treated to a book of their choice. Thank you very much to our local partners, Glow Worm Books, for looking after our prizewinners so well and for sponsoring these competitions for us. And well done again to our fabulous readers and writers. 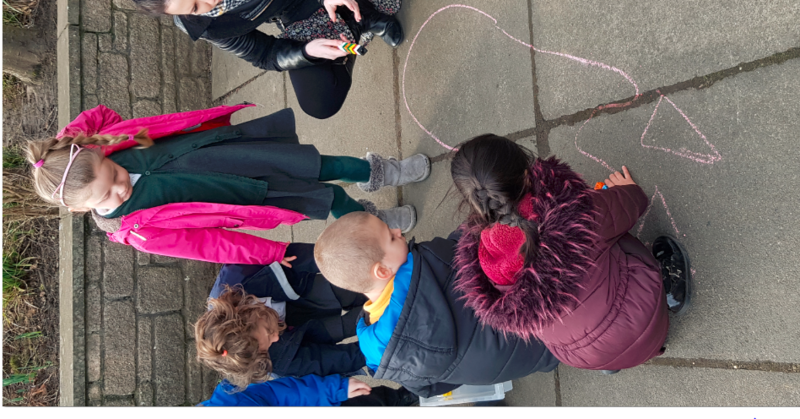 The Eco Group did the RSPB’s Big Schools’ Birdwatch today, noting the different types of birds that are in the Broxburn area, before we uploaded our results to find the Top 10 birds around St Nicholas. 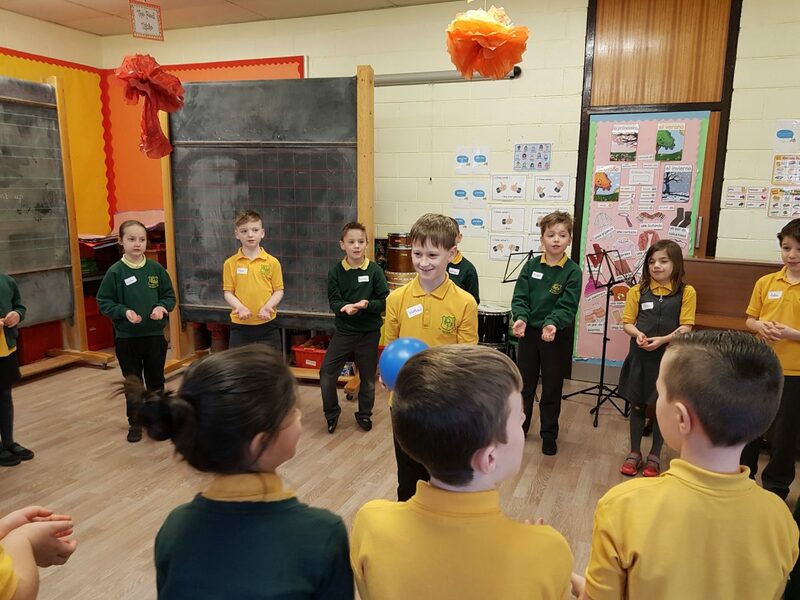 We then worked to create bird snappers – older pupils working alongside younger pupils. Thanks to our P7, P6 and P5s who took such good care of our younger St Nicholas children, working with such care, skill and patience. The snappers were very fiddly to put together but we got there with them. Well done everyone! 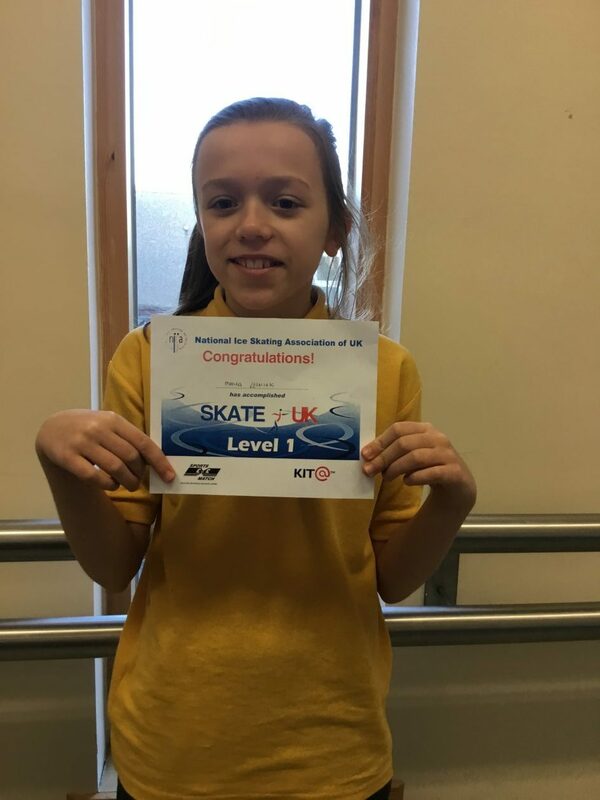 Maya passed level 1 in ice skating! The competition will run in this term too. Primary 5 have had a busy first week back at school. In Literacy, we have been learning about poetry and metaphors and similes. We have worked very hard to create our own metaphors and similes and added them to a poem about dogs. In Numeracy, we have been continuing to work on money. We have been working on subtraction number talk strategies and also using our number bonds knowledge to add and subtract multiples of 10. We have been learning about the 10 Commandments and came up with our own commandments that we felt were important. This week we have continued with our science topic about our body systems. We have looked at our respiratory system and also our circulatory system. We have been working together to research body organs and locate them in our bodies. We have also been making new year resolutions and looking at making targets for ourselves this term. 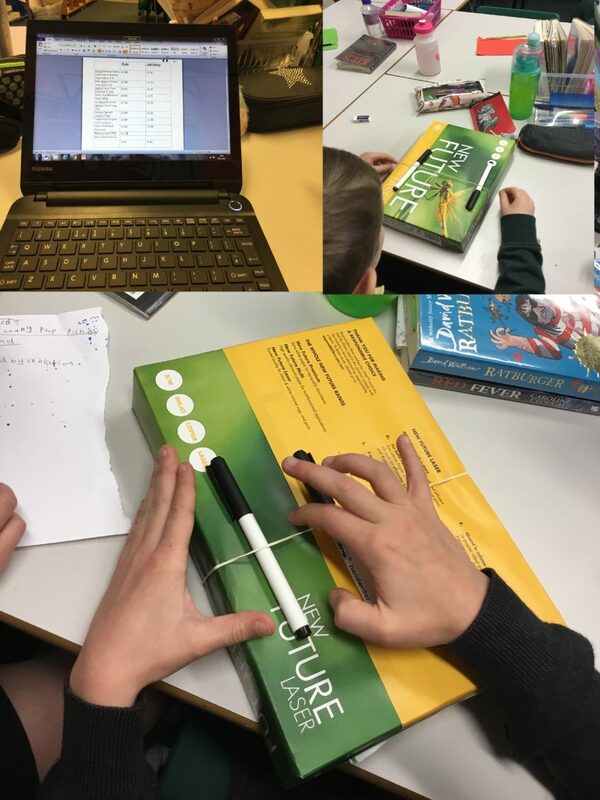 This week in p6b we were using laptops to make a shopping list, we also played elens in Spanish and had a lot of fun! Miss Gilmore came into our Limerick writing lesson and did game with us where you have to find the missing line sof a Lymerick poem. We had lots of fun this week! Goodbye and have a Good Day! Busy week back at school! 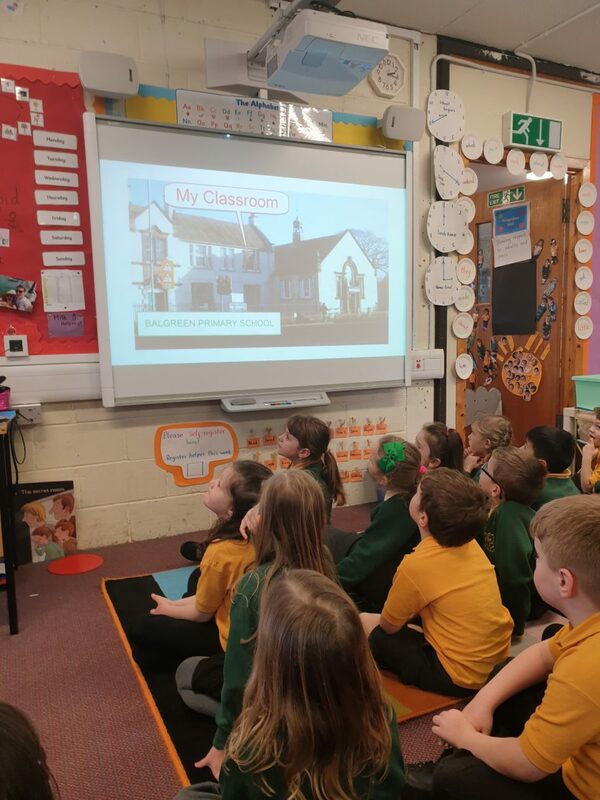 Primary 2 would like to share some of the things they have been doing and learning since Monday. Olivia- We have been using our Rekenreks to switch numbers! A switch is when you change the order of the numbers in your sum. Nina- We have made shadow pictures for art. Daniel- We have been writing Winter Senses poems. Rory- We read a book and wrote about the main thing that happened. Wilf and dad went to the ice rink. Elias- We read ‘No Tricks Gran!’ and the main thing that happened was Gran made a ghost outside to scare the children. We are really looking forward to telling you all about our new topic very soon. Our Pupil Council began the judging process today, looking at entries for the St Nicholas Writing Competition. Here they are hard at work reading the entries. The standard of writing was very, very high. Winners for the both the reading and the writing competitions will be announced on Friday 11th of January at assembly. Thanks Pupil Council for your help and giving us your views and insights into what makes a great story. Some lovely photo’s that were taken of our Nativity dress rehearsal in case anyone didn’t manage to get a picture of their child in their costume. Nativity DVD will be available soon too! Today we really enjoyed taking part in the Christmas Carol concert. We sung ‘Beneath the Stars’ in front of all the parents and the St Nicholas V.I.P.’s. It was fun and breath taking as we noticed some members of the audience becoming emotional as we sang. Primary 6 would like to wish you all a Merry Christmas. Our classmate Isla has earned a dance award for showing excellent improvement and skills in her first half of her dancing term. We all think Isla did a very good job and appreciate her effort and growth mindset for her dancing! Well done Isla! 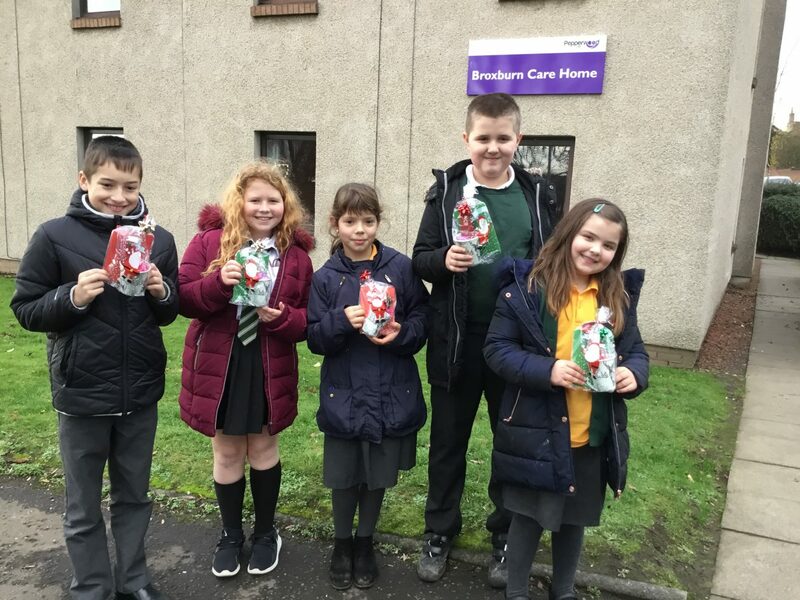 This week we made a special delivery to Broxburn Care Home to drop off a ‘Cup of Christmas Cheer’ for every resident. Our Relationships vertical learning group discussed the importance of spreading joy at Christmas and made up little packs which included a personalised Christmas card, a Christmas cup with a hot drink sachet and a wee cake. The package was well received by the residents and staff who were delighted with our little gifts. 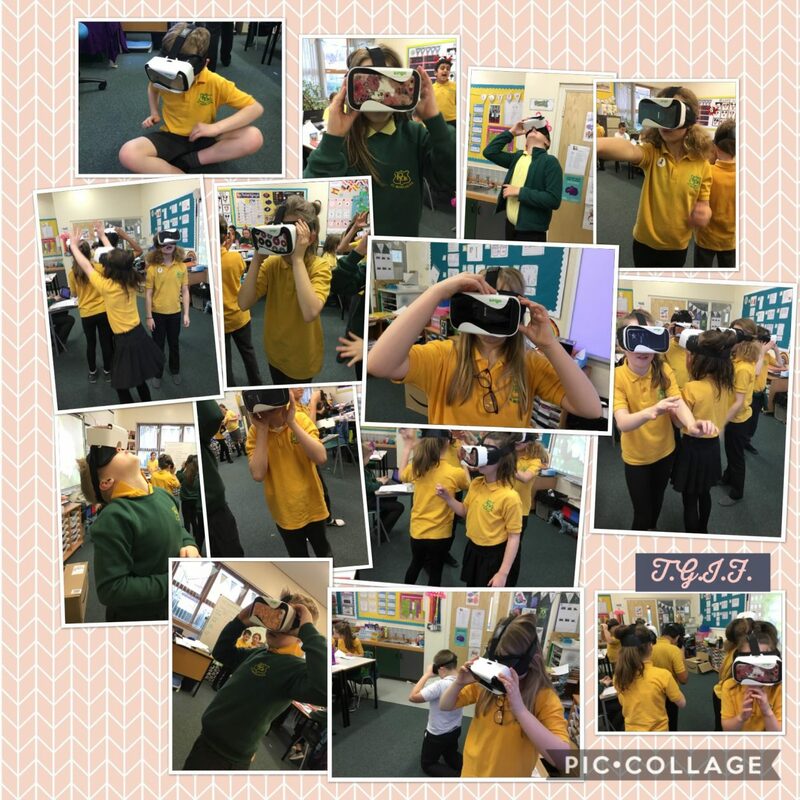 Yesterday P6 visited the International Space Station, then they landed on the moon, then they popped in to the Kennedy Space Centre…using our new virtual reality headsets. The class had a fabulous time exploring all the places that we have been learning about over the past few weeks. I wonder where we will be exploring next ? On Tuesday we had a visit from Clare who reminded us how to care for animals. We worked in teams to play a game answering questions about different animals and what they eat, the name for their young and which category of animal they are. We had a great time learning all about it. Beth won a certificate in judo and moved up to a yellow belt. 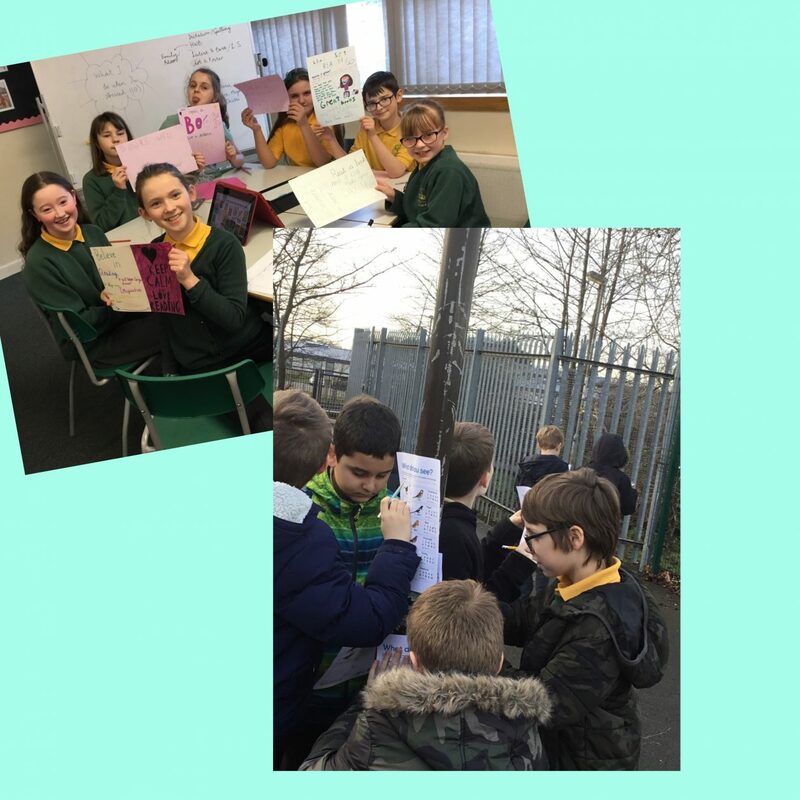 West Lothian Council GLOW allows teachers and pupils to communicate over the internet in a safe and secure way. Teachers can post work and lessons for pupils. 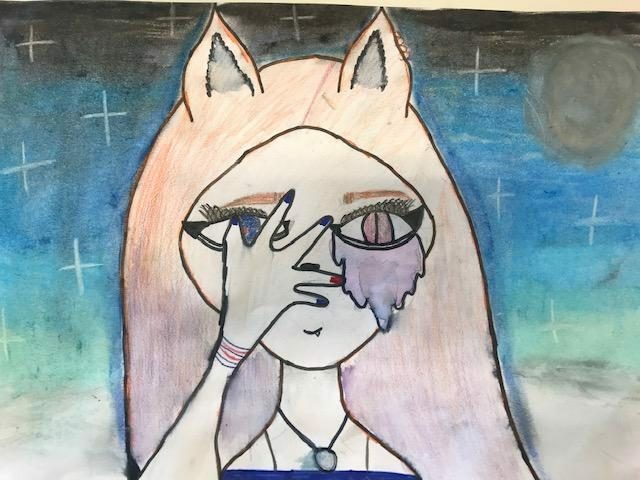 Pupils can submit completed work. 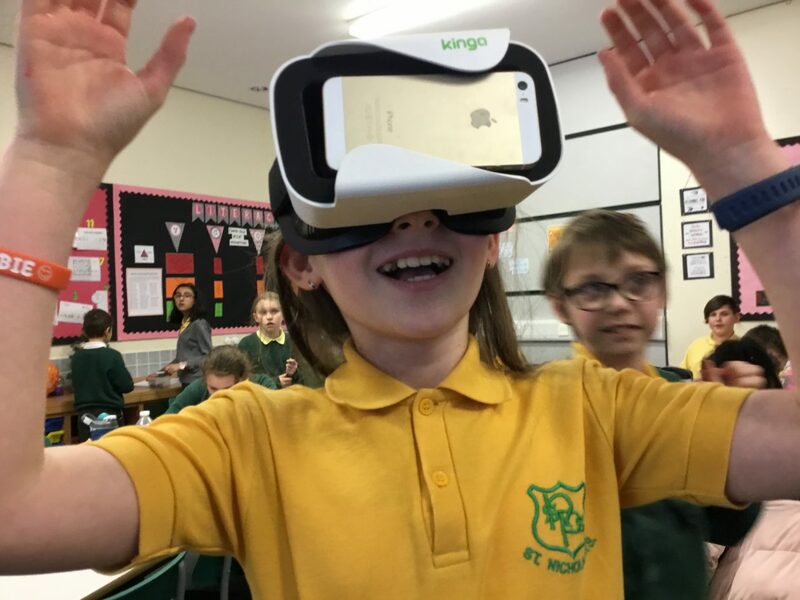 Features include safe and secure ‘chat rooms’ where teachers can answer pupil questions, and where pupils can help each other out and share learning experiences. At St Nicholas nursery class we value your opinion and appreciate any feedback you give us. We appreciate that not all parents get a chance to come into the nursery so this gives you an opportunity to express your ideas and opinions. Please take a few minutes to answer the following questions. Please go to bit.ly/stnicsnurserydec18 to answer the questionnaire. 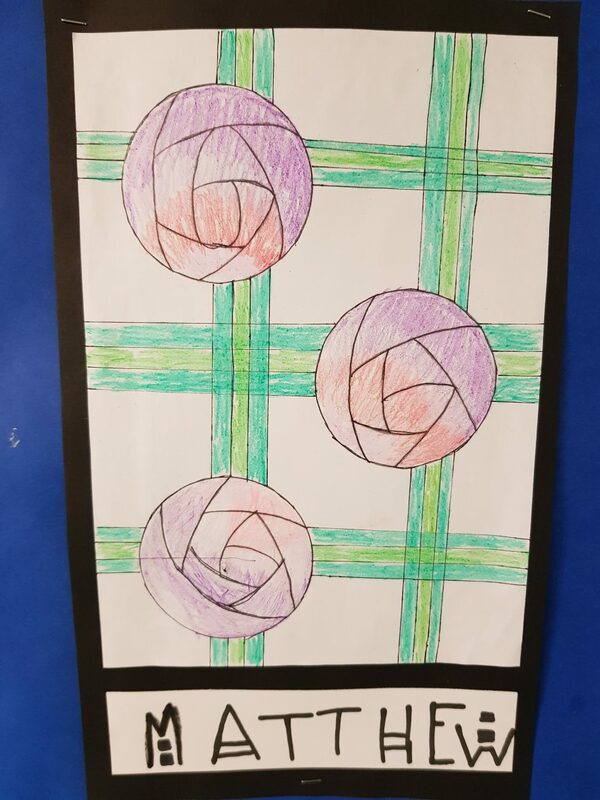 Last week in Maths we were learning all about symmetry. We used mirrors to check if a shape was symmetrical and how many lines of symmetry it had. We discovered that not all shapes are symmetrical and that is called asymmetric. In Literacy, we were learning about common and proper nouns. We learned that a proper noun is a little bit fancy and needs a capital letter. Words such as months of the year, names, places and days of the week are all proper nouns. We are starting to feel a little festive, so in Art we were given a challenge by our class elf to create a Christmas tree using forks, paint, glitter and paper plates. 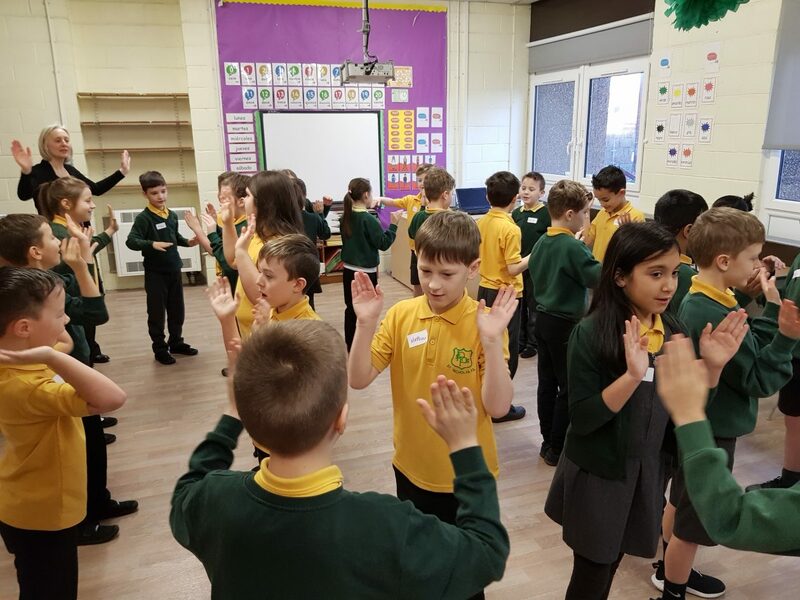 ising our dance moves for our Christmas party and have been learning The Square Dance, The Grand Old Duke of York and The Flying Scotsman. We hope that our class elves leave us some more fun challenges to do this week! 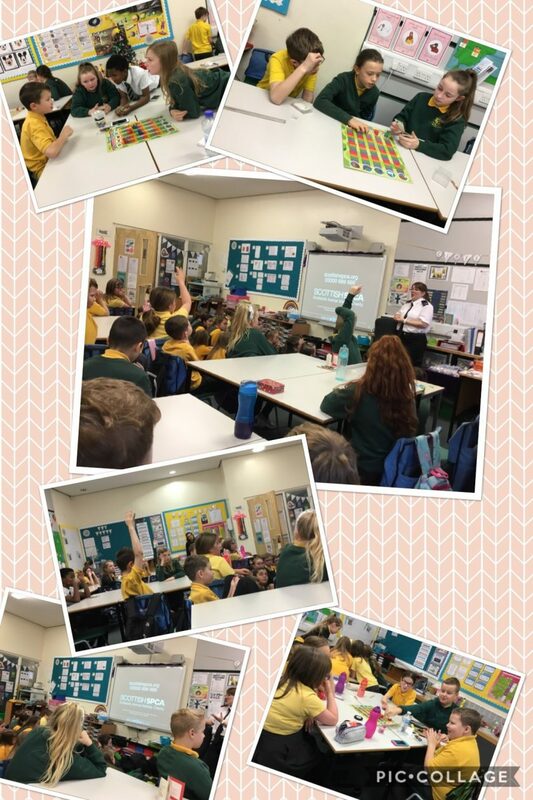 Mrs Dickson, a parent from P6a visited our classes to share her knowledge about mindfulness. She helped us to understand the importance of mindfulness by showing us a jug of water and stirred some glitter into it. 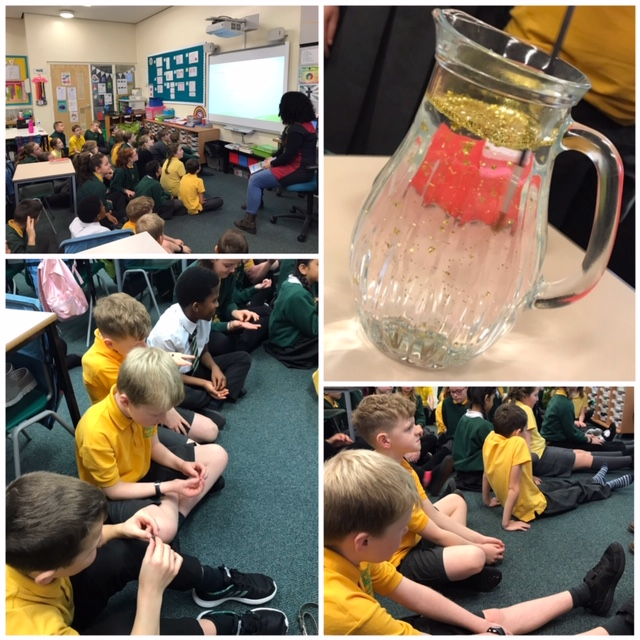 The water represented our brain and the glitter represented our thoughts and it showed us how busy our brain can become and this is why it is so important to have quiet, calm time …mindfulness. “Mindfulness helps you to get into a place where you can think about your problems or relax without feeling stress.” said Callum. 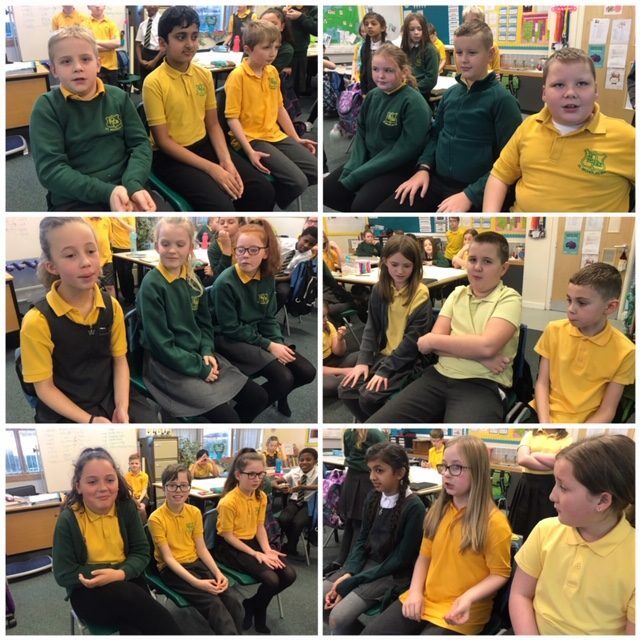 We would like to give Mrs Dickson a big thank you for teaching us about mindfulness. We are so proud of Rebecca who played her cornet in the Brass Band Championships in Perth. One of her favourite songs that she can play is ‘This is me’ from the Greatest Showman. 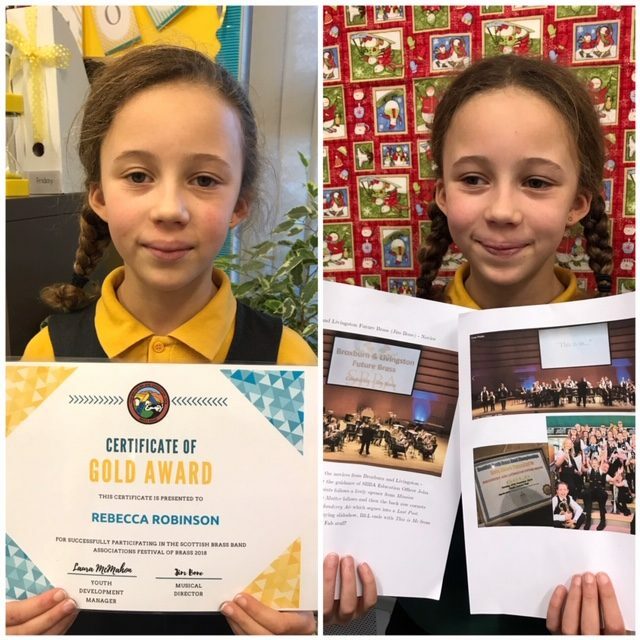 Rebecca is a member of the Broxburn and Livingston Brass Band and they won first prize in the competition. 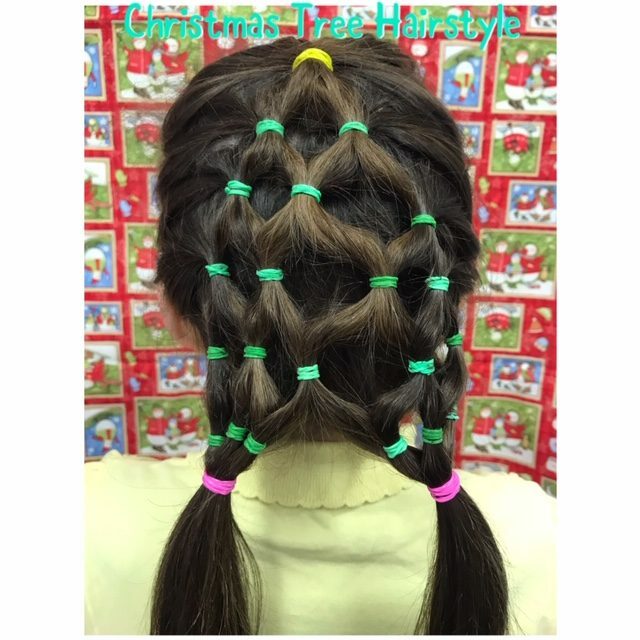 Are you looking for a new style for the festive season ? P6 created this Christmas Tree design during Golden Time. 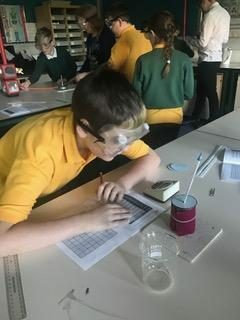 Primary 6 have been researching the moon landing of 1969. 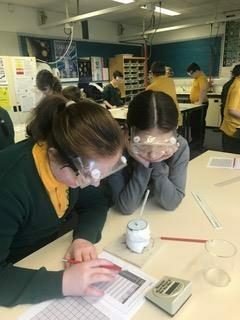 There are many conspiracy theories surrounding this event so P6 set to work to discover all the facts and then to have a debate. After several arguments the class had a vote and the response was 50:50 as we could not decide which theory to believe. 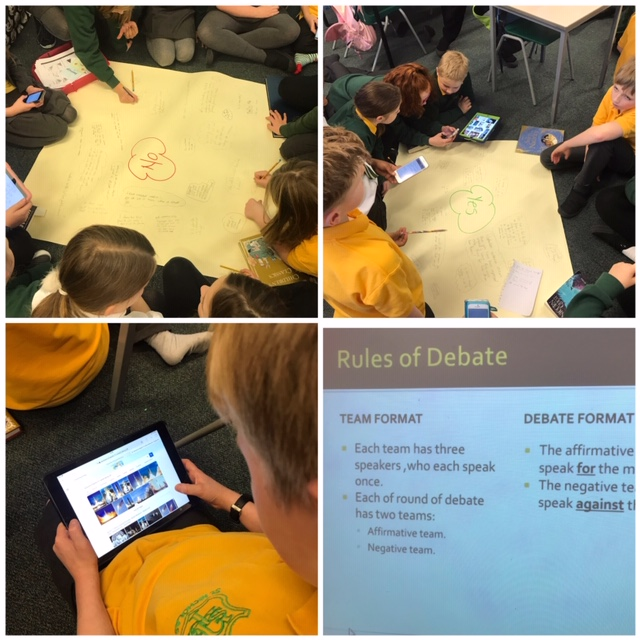 It was fascinating introduction to the skill of debate. 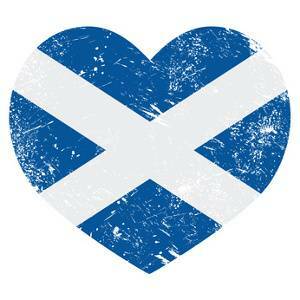 Happy St Andrew’s Day! This week we have been learning about St Andrew. Ellie – St Andrew is the patron saint of Scotland, Rope, Fisherman and Fishmongers. Paula – St Andrew was one of the 12 disciples of Jesus. Cerys – St Andrew was 62 when he died. Szymon – He was killed by the Romans in Greece. Alexander – Some of St Andrew’s remains are in Scotland. Sam – He said that he was not worthy to be crucified on a cross like Jesus so he was crucified on a x-shaped cross. 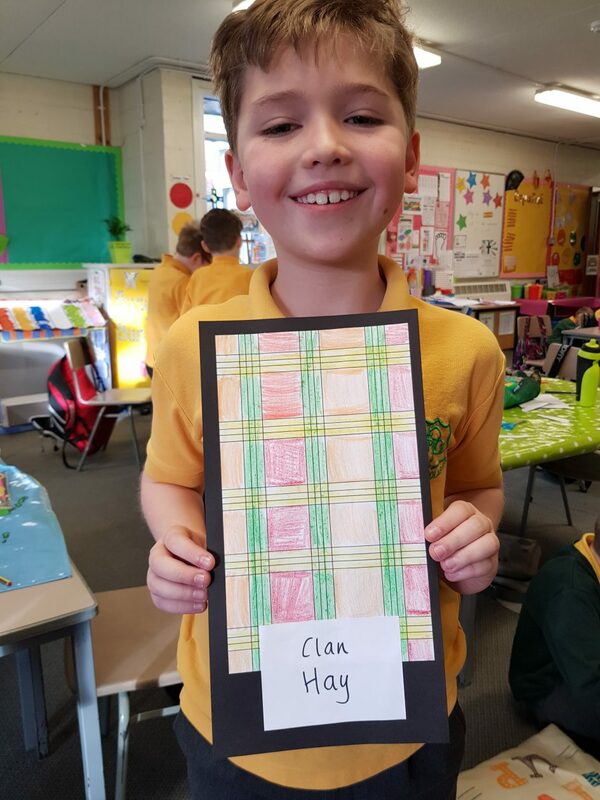 Ciaran – The x shape was adopted as our national flag of Scotland (the saltire). Matthew – He had a brother called Simon Peter. Mirin – St Andrew appeared in a dream and told the Pictus people that they would be victorious in battle. Phoebe – he followed Jesus and spread the good news. We have also been learning about multiplying and dividing by 10, 100 and 1,000 in numeracy and using subtraction strategies in number talks. We have worked very hard this week in all areas.